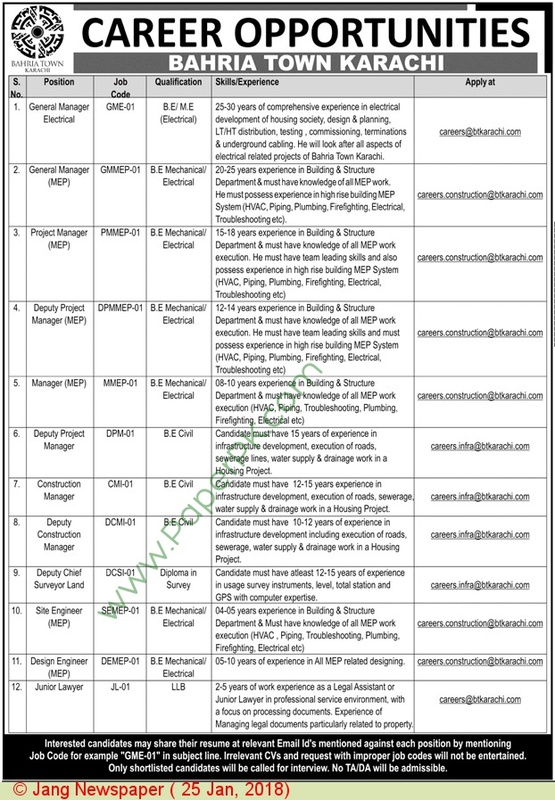 Punjab land development company Lahore needs civil engines. 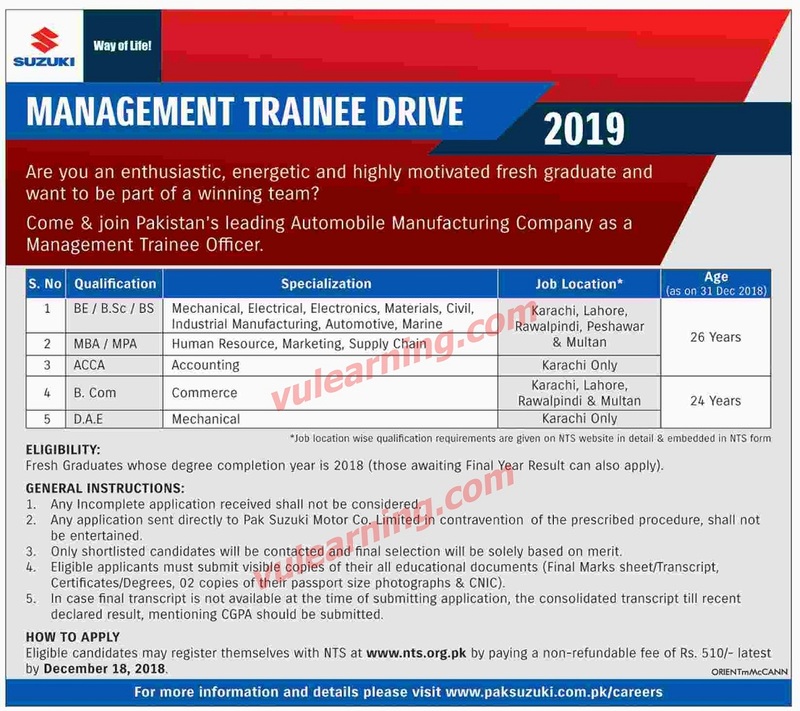 candidates can check details through link given below. 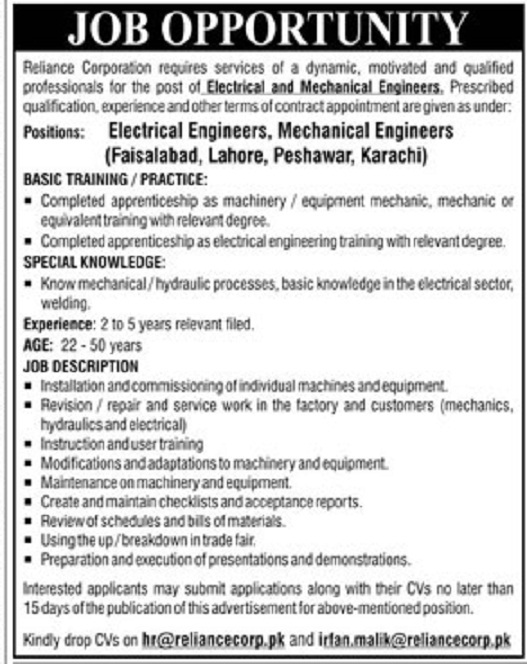 A Pakistan based engineering company is looking for trainee engineers ,holding B.Sc degree in Mechanical/Electrical Engineering. 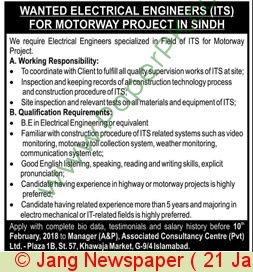 A Construction Company is looking for electrical engineers for its projects in sindh Motorway. 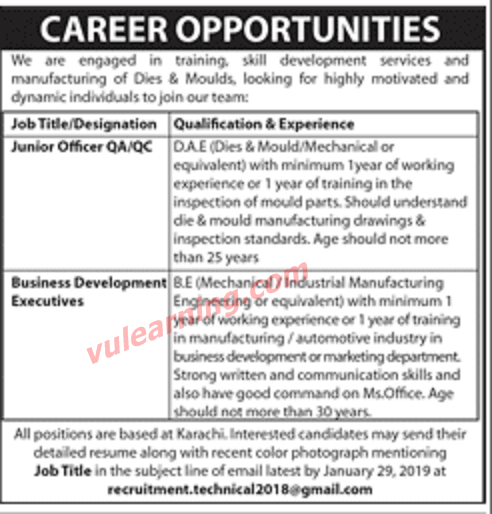 For further details visit the link given below. 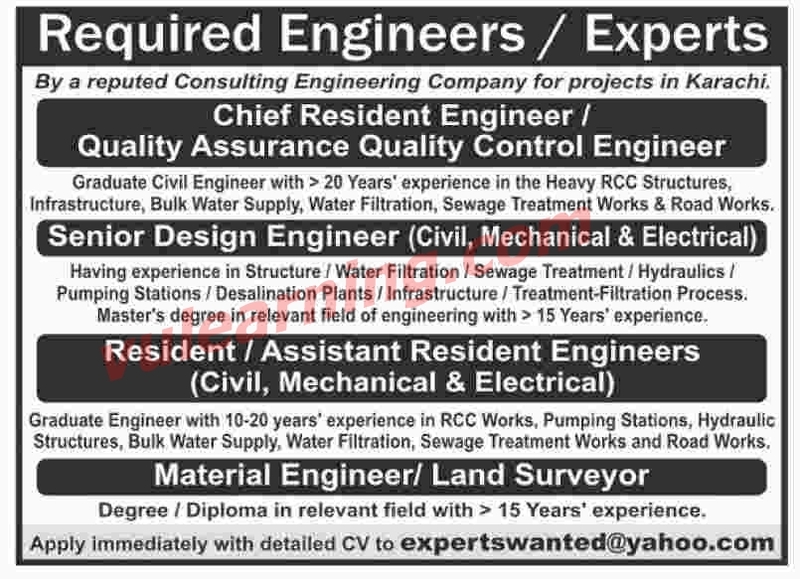 A Construction company in Saudi Arabia needs services of electrical/mechanical engineers. 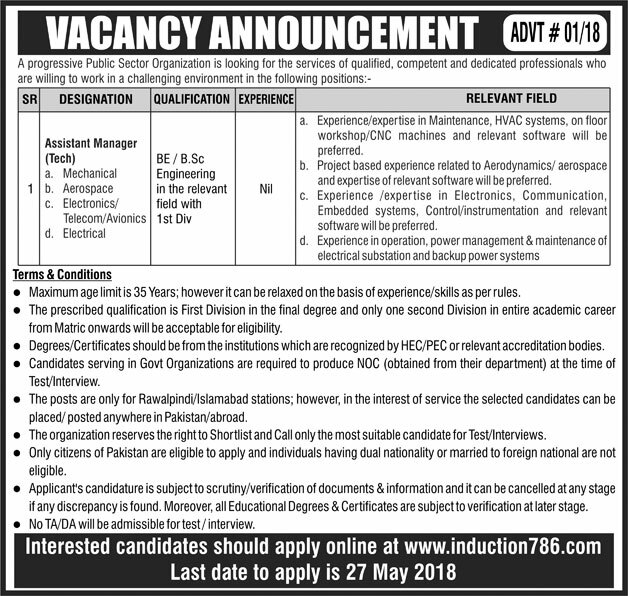 WAPDA needs services of civil/Electrical/Mechanical Engineers in its Project in Gilgit .For more info visit the link given here. 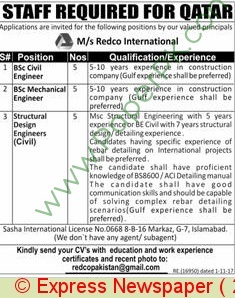 M/S Redco International need services of Civil/ Mechanical Engineers for its project located in Qatar. 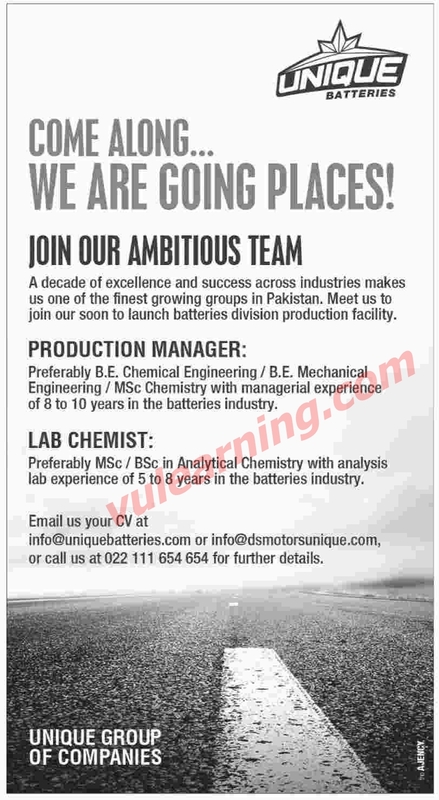 For more info visit link given here. 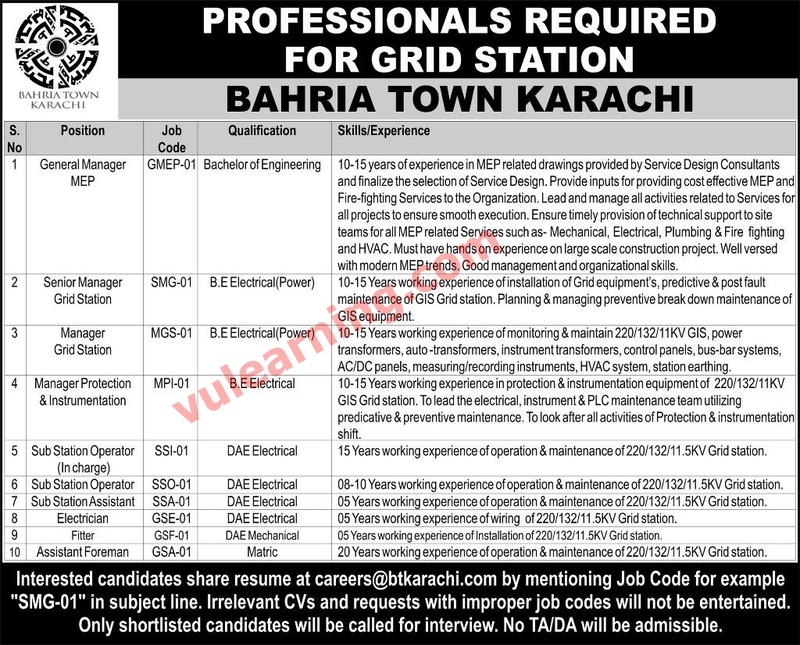 Bahria Town Karachi need services of Electrical/Mechanical/Civil Engineers for its project in Karachi.For more info, please visit link given here. 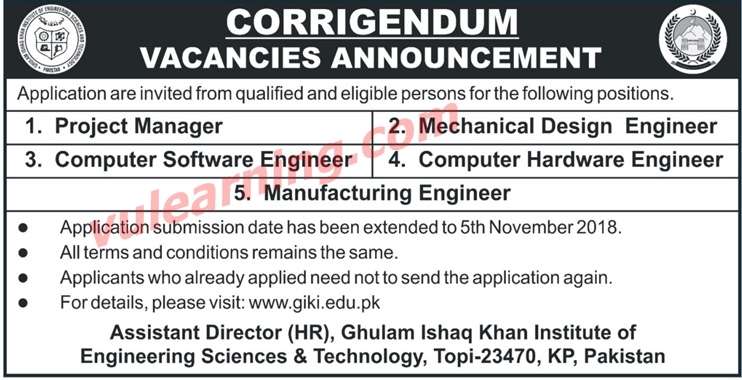 GIK University needs services of mechanical/electrical Engineers in topi gadoon. 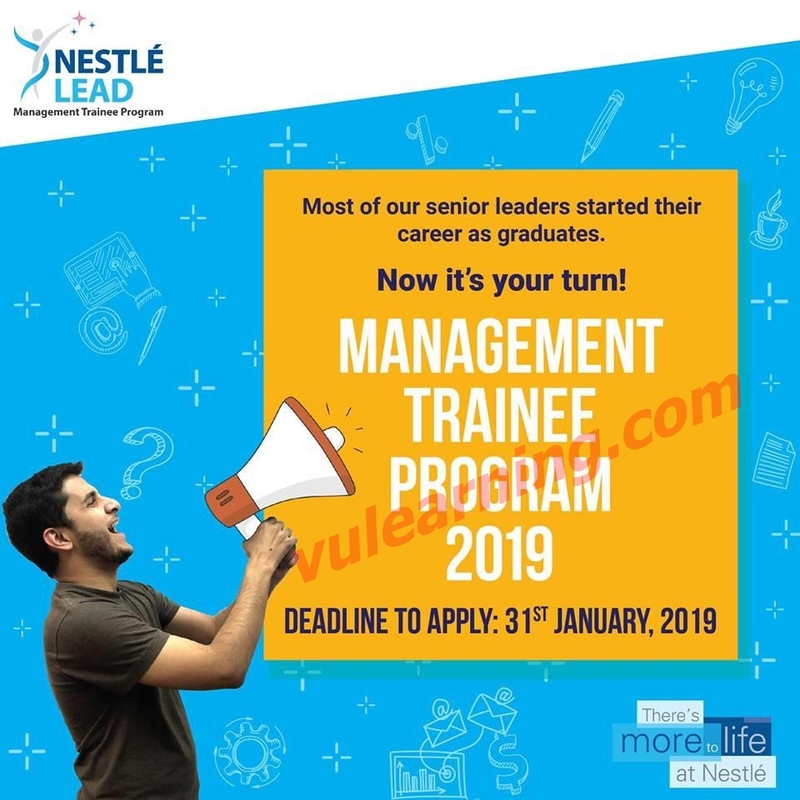 For more info please visit the link given here. 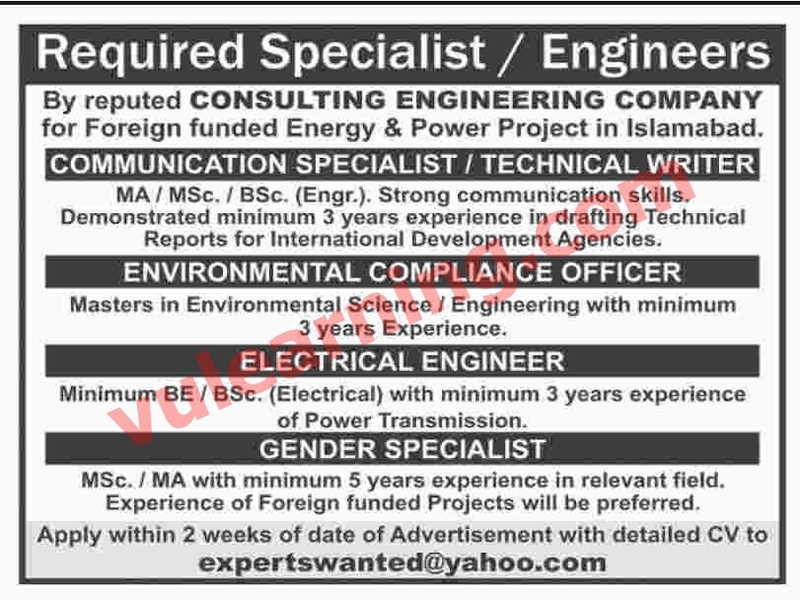 A well known Industrial Complex need Services of B.Sc Electrical Engineer in Lahore.For Details visit the link given. 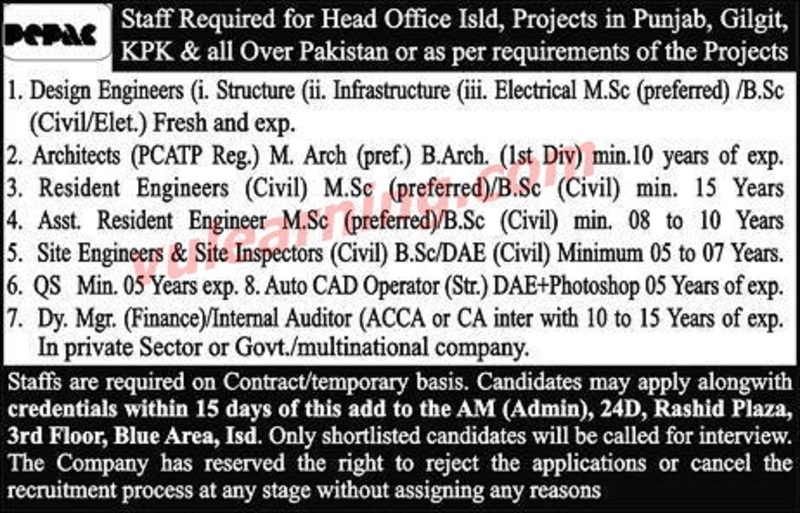 POF needs services of B.Sc Mechanical/Electrical Engineers for post of Manager Technical/Assist- Manager Tech on regular bases.Further details are given in link. 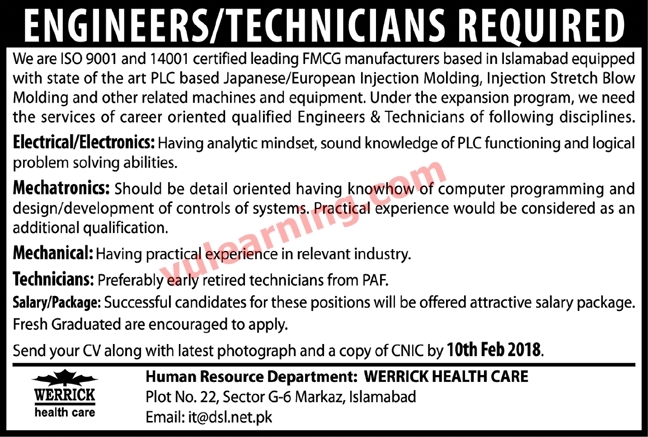 Werrick Health Care need services of energetic and motivated Electrical Engineers.More info is given in link. 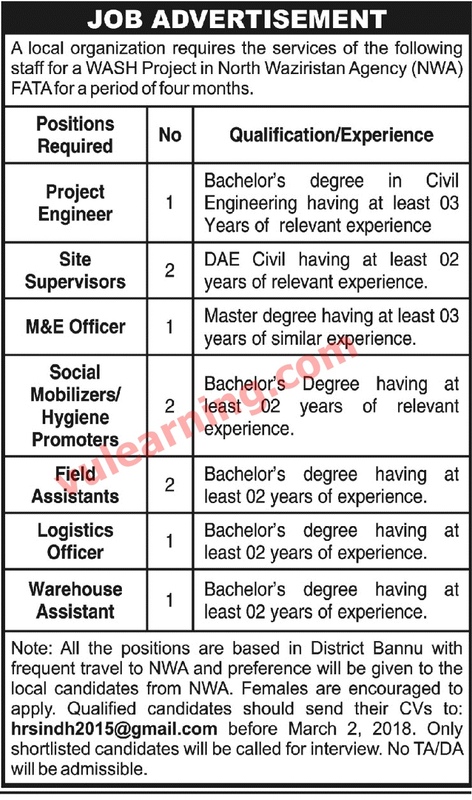 LDA (Lahoer Development Authority) need Services of B.Sc Engineering Graduates (Electrical/Civil/Mechanical) for the post of Assist- Dir (Engineering). 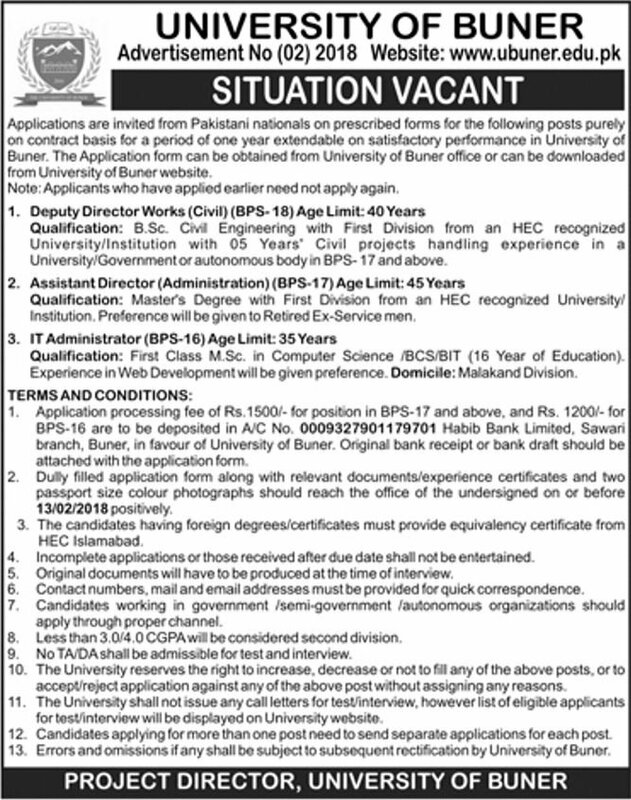 University of Buner needs services of B.Sc Civil Engineer for the post of Assist Dir. 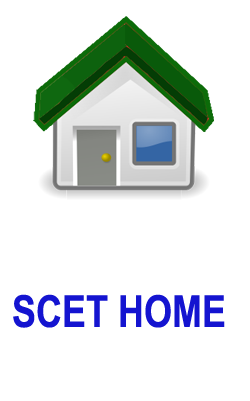 (Works).Further details are given in link . 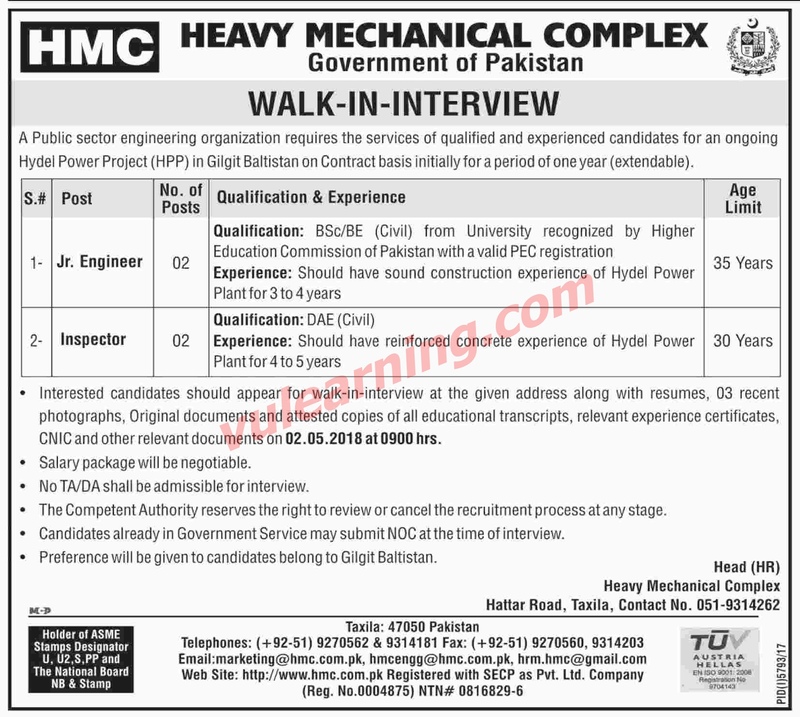 HUBCO is hiring Mechanical Engineers .for more details ,visit the link given here. 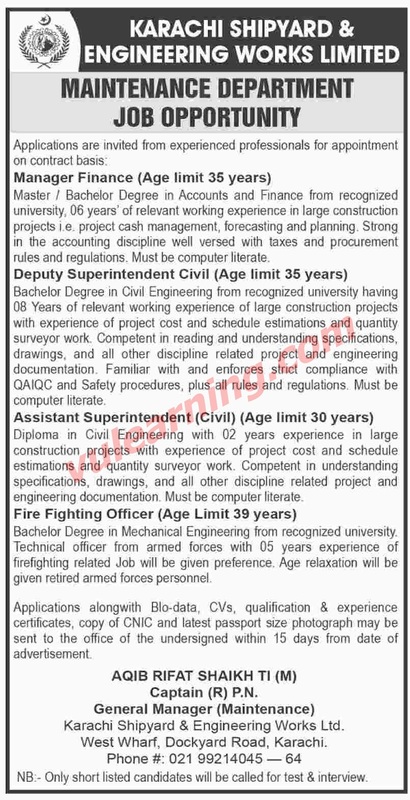 Govt of KPK needs Civil Engineers in Haripur..More details are given in Link. 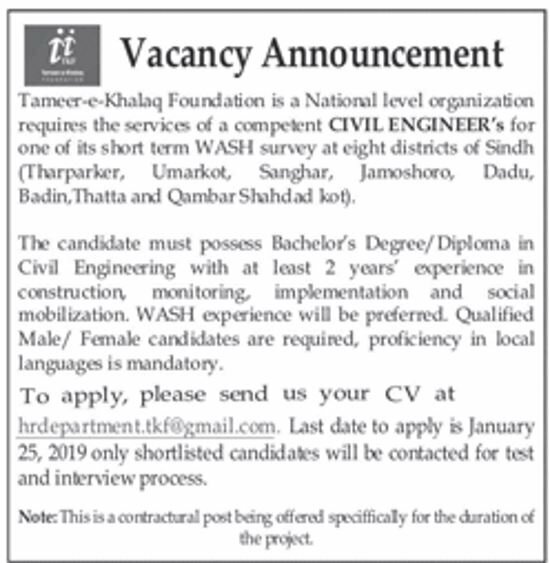 FJWU needs Civil Engineers.Further Details are given in link. 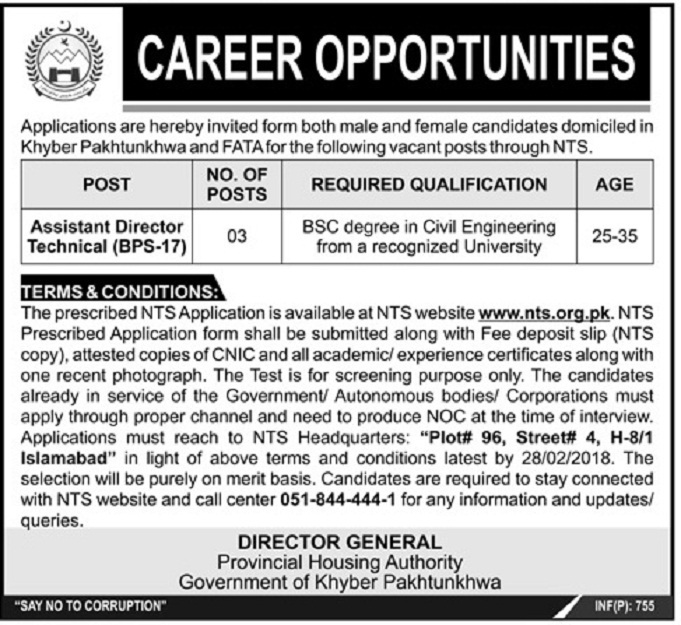 Provincial Housing Authority kpk Govt needs services of BSc Civil Engineers for the post of Assistant Director Technical.Further Details are given in link. 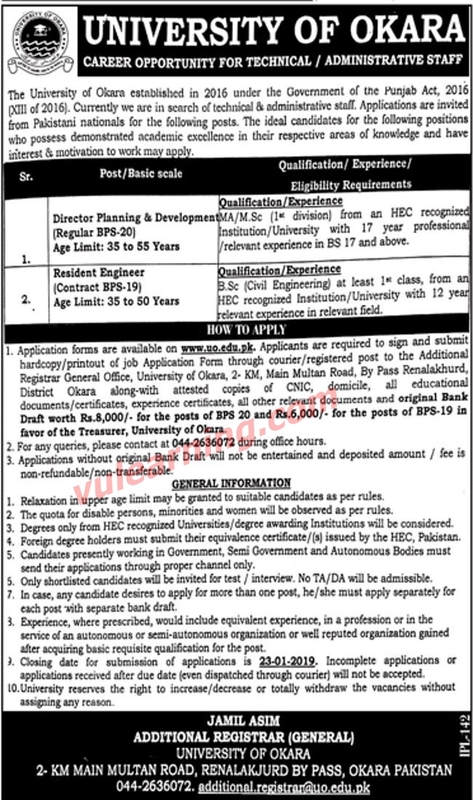 Pakistan Red Crescent Society kpk need BSc Civil Engineers.Further Details are given in Link. 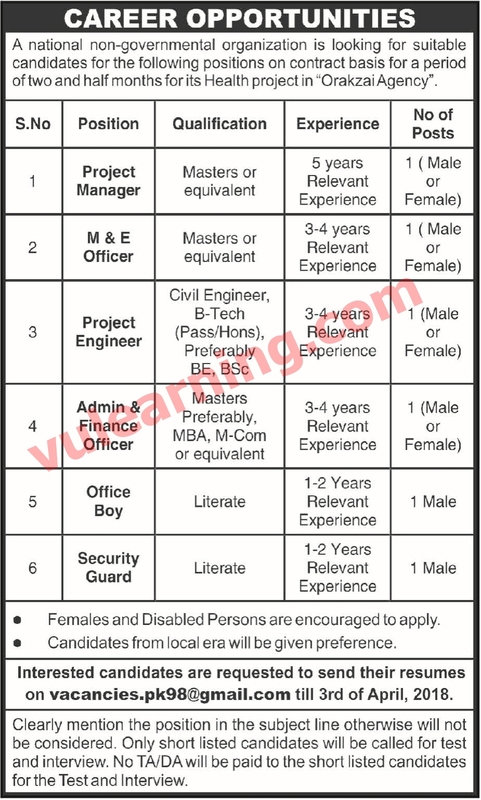 Women University Swabi Needs Services of Civil Engineer for the post of Deputy Director Works . 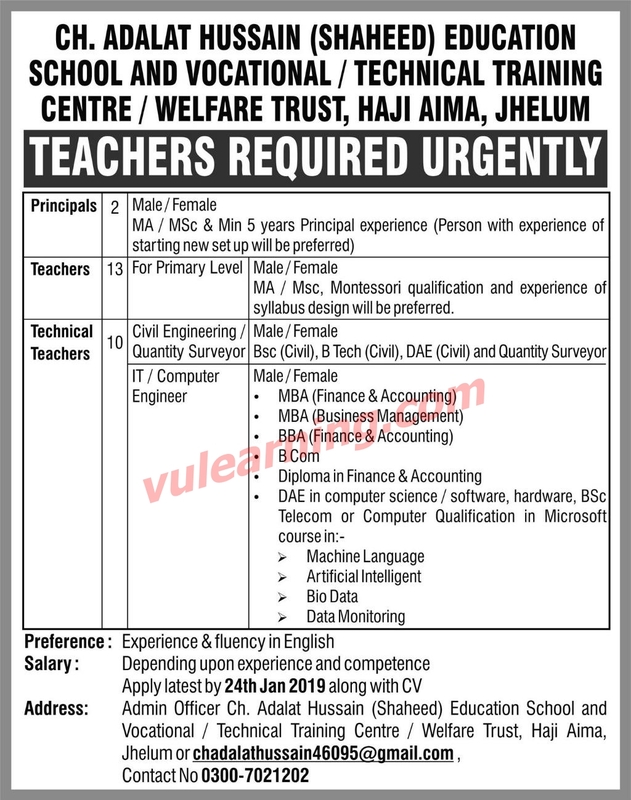 Further details are given in link. 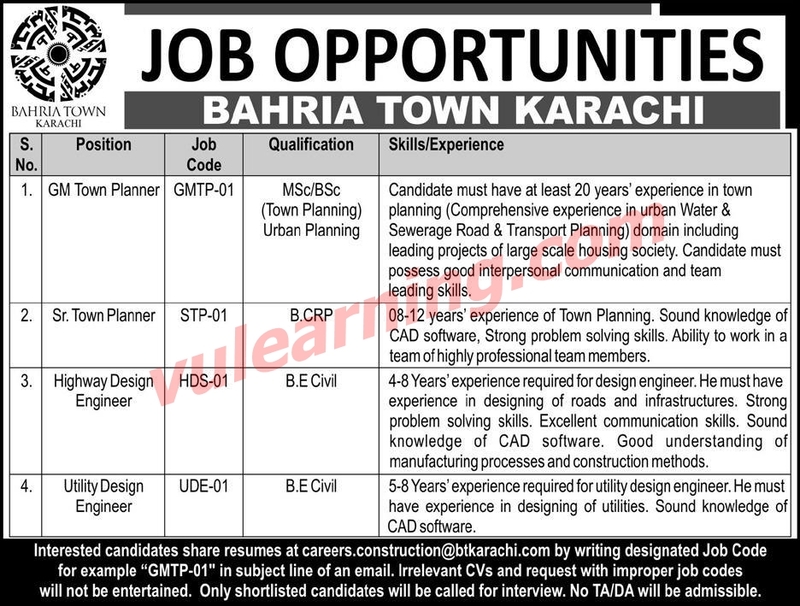 Bahria Town Karachi Need Bsc Civil Engineers.Further Details are given in link. 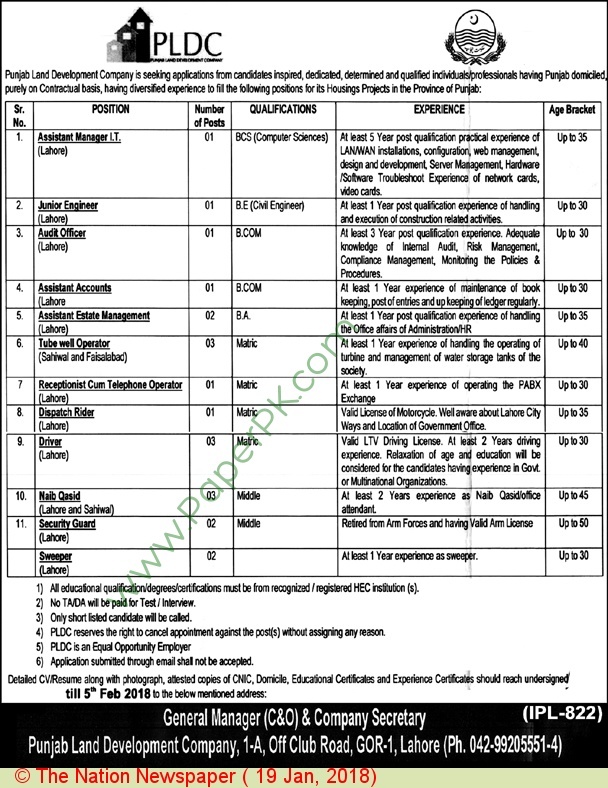 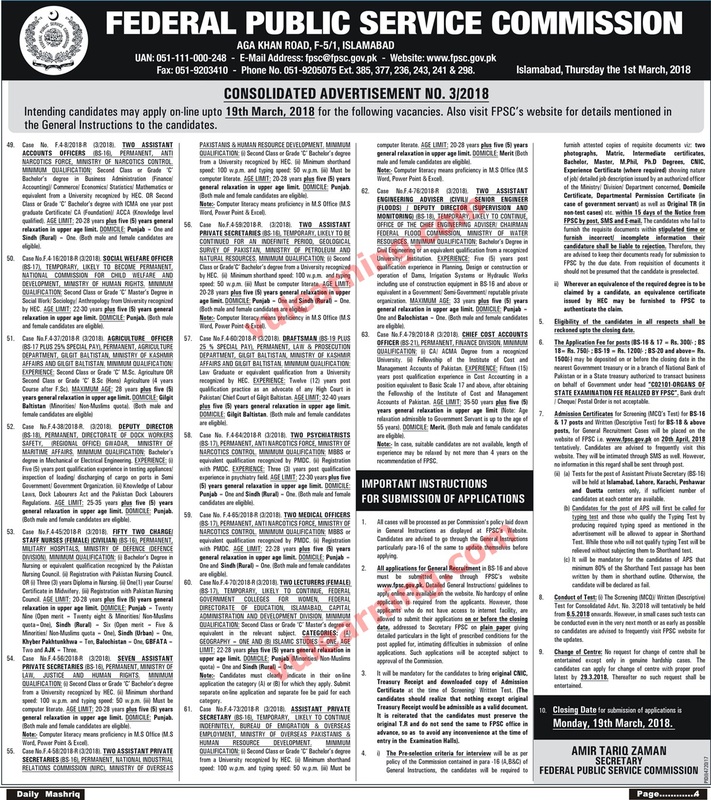 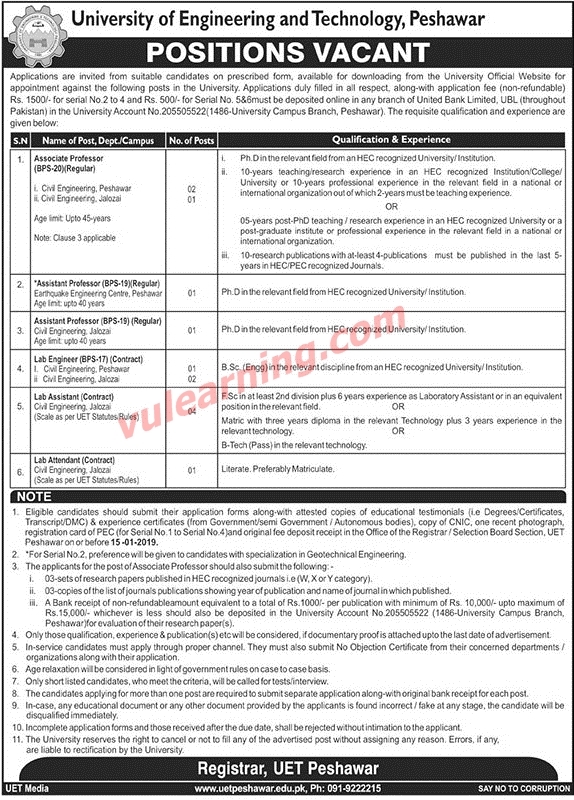 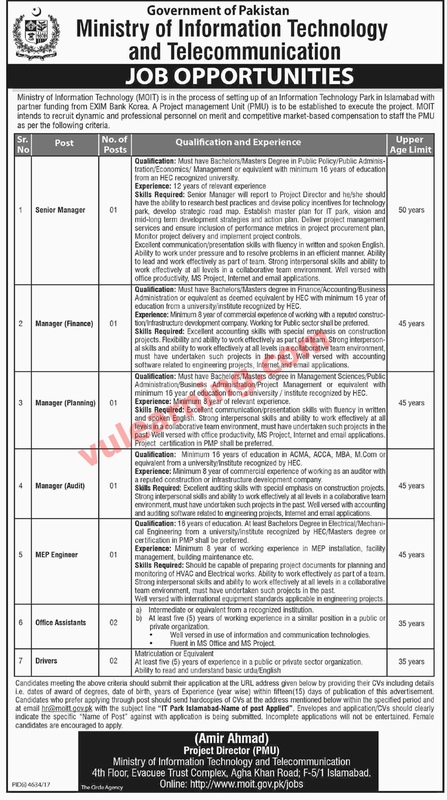 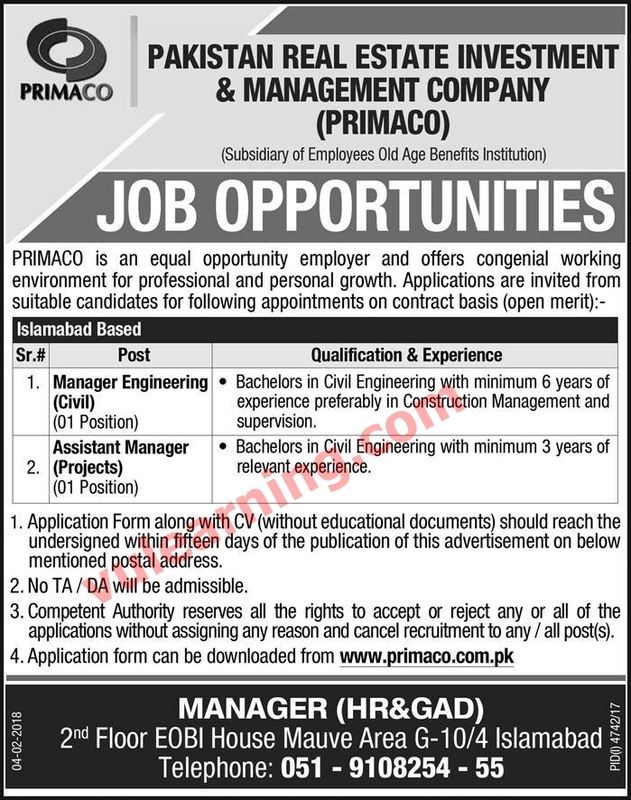 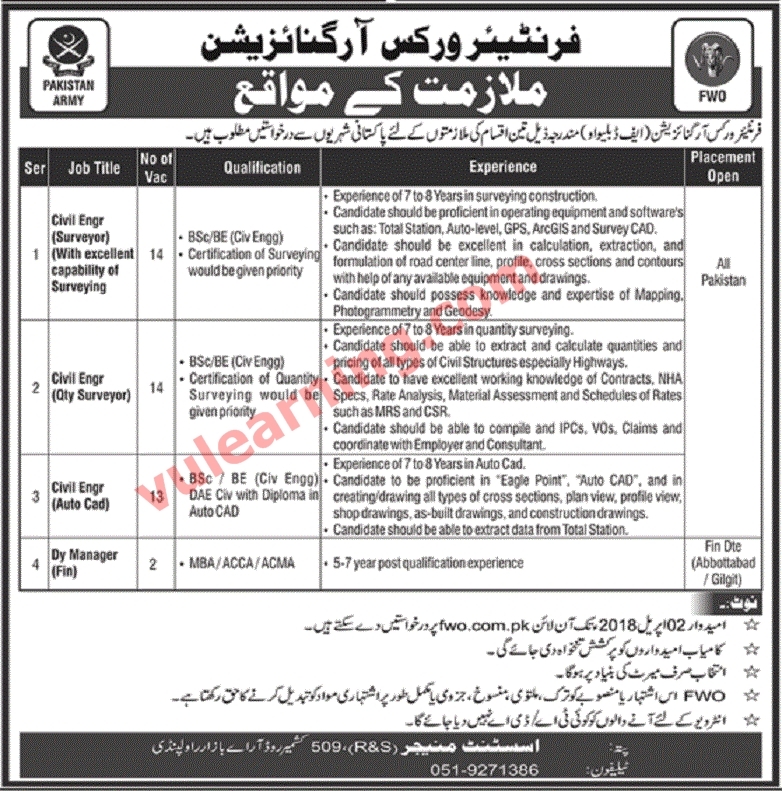 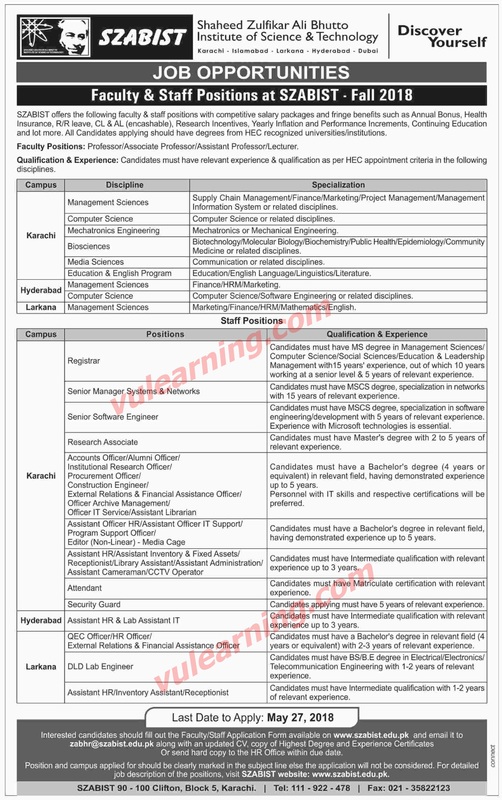 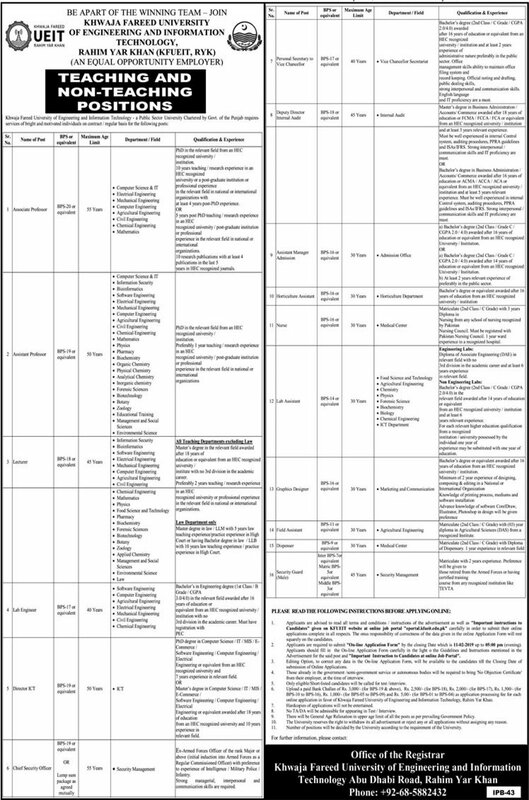 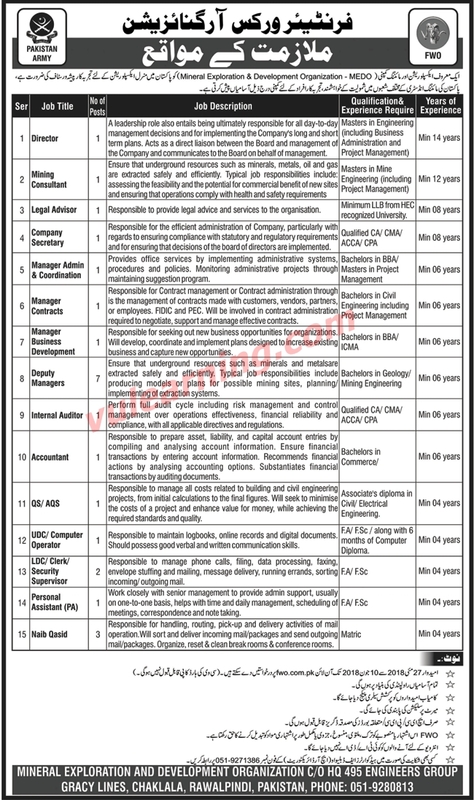 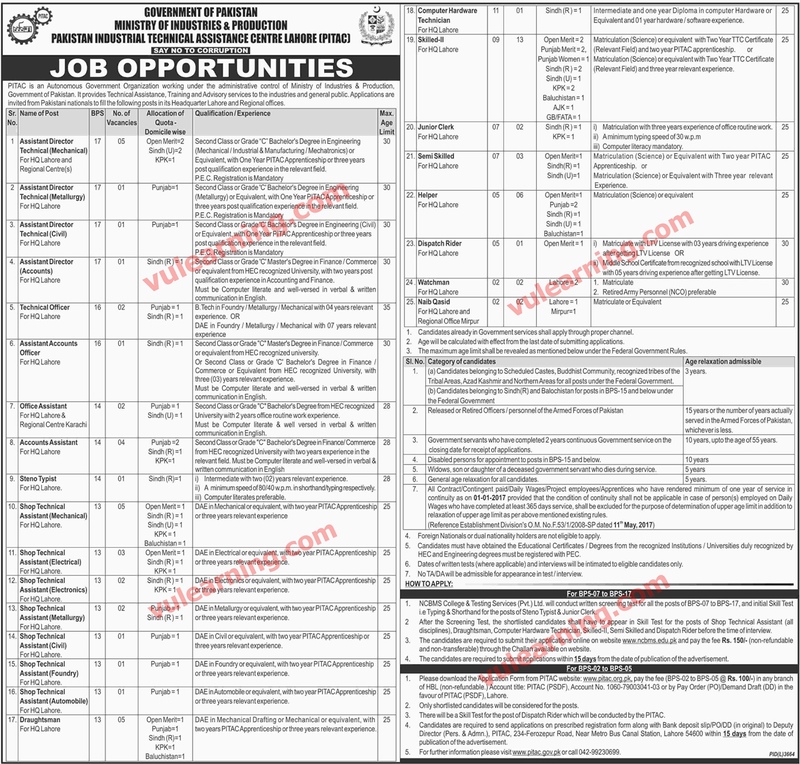 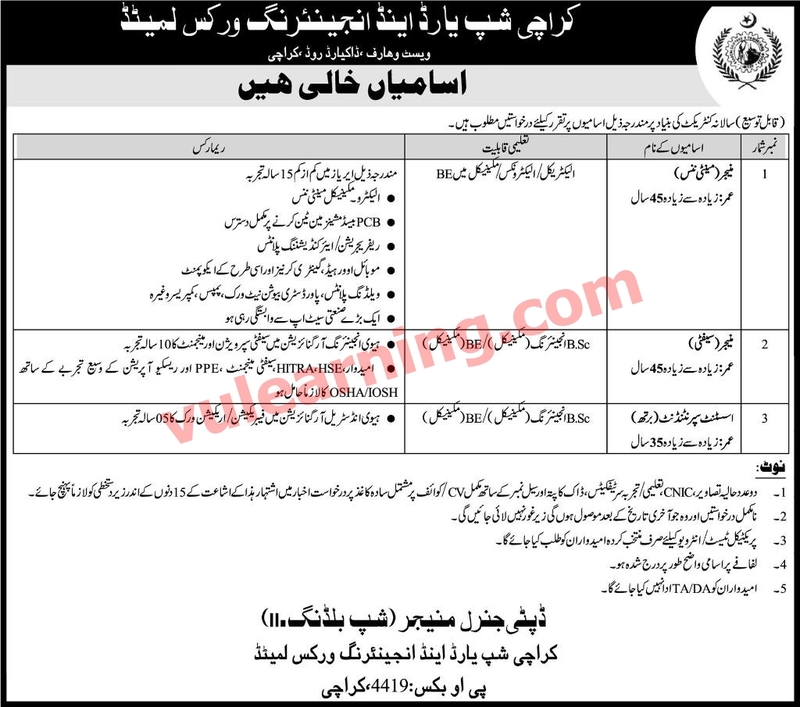 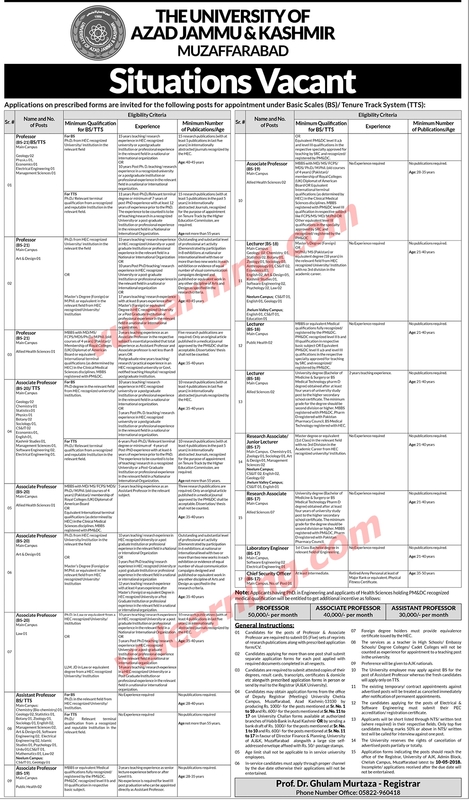 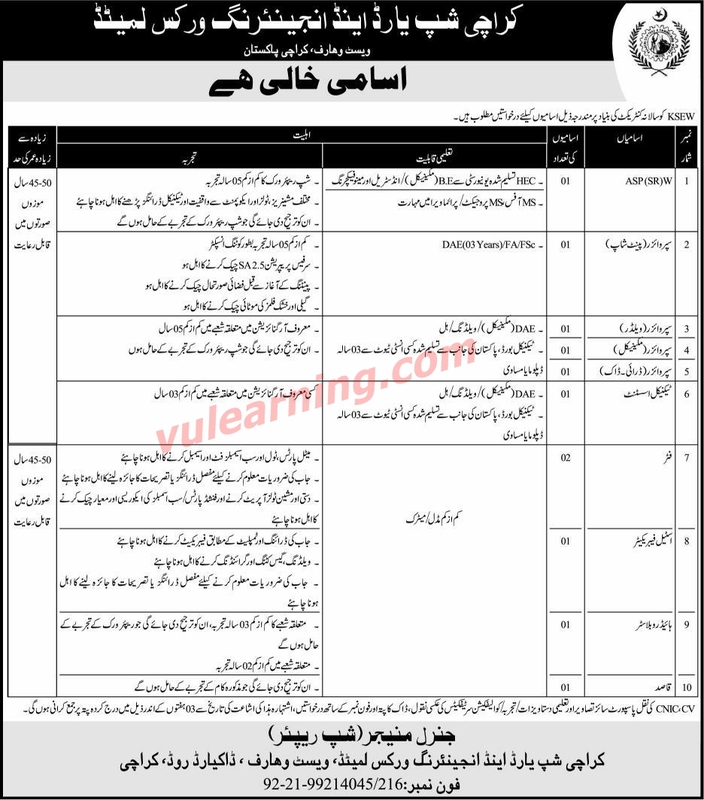 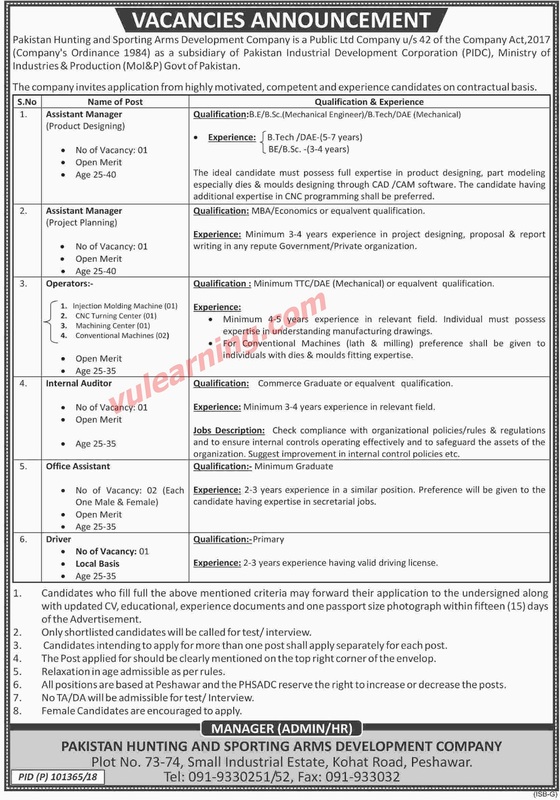 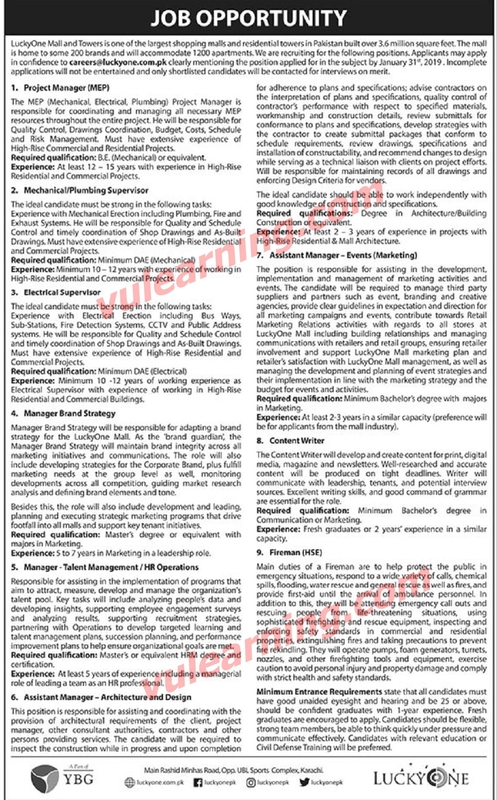 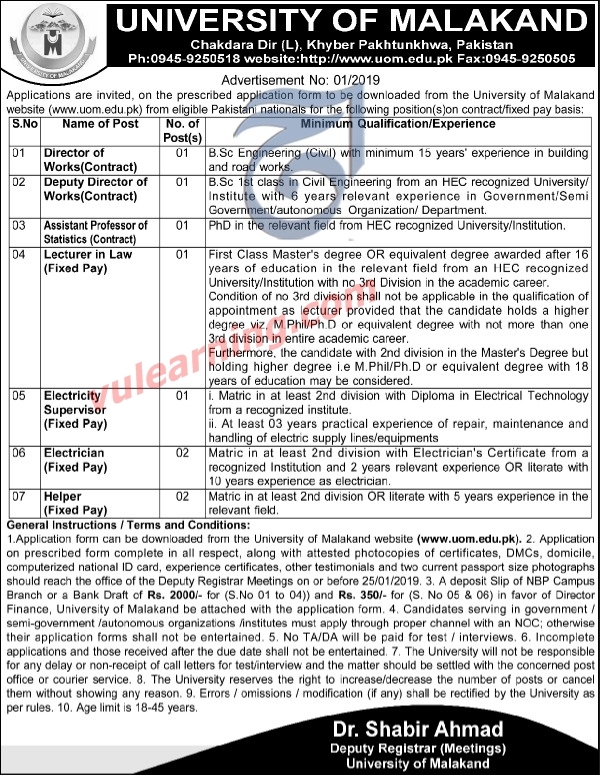 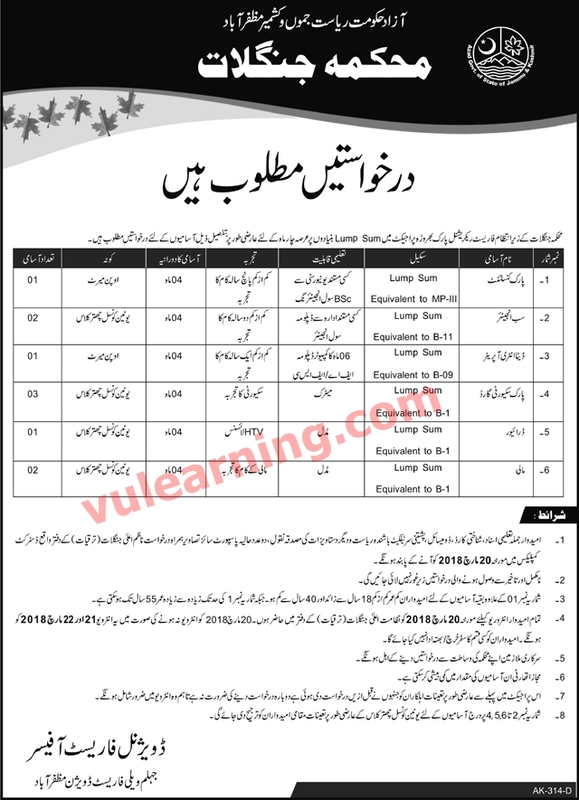 Pakistan Civil Aviation Authority Need Services of Civil/Electrical/Mechanical Engineers For the post of Project director.Details may be seen in link. 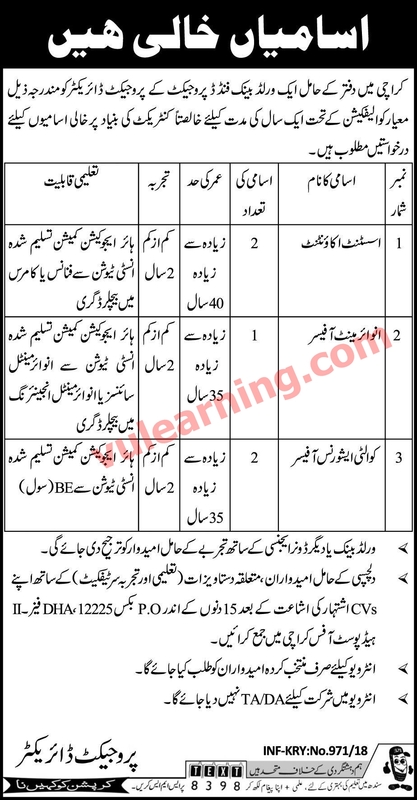 Karachi Shipyard & Engineering Works needs services of Electrical /Mechanical Engineers .Details are given in link. 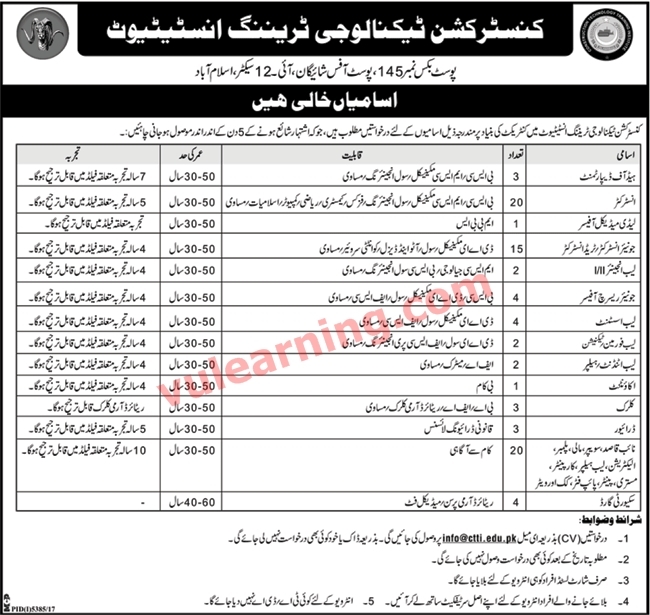 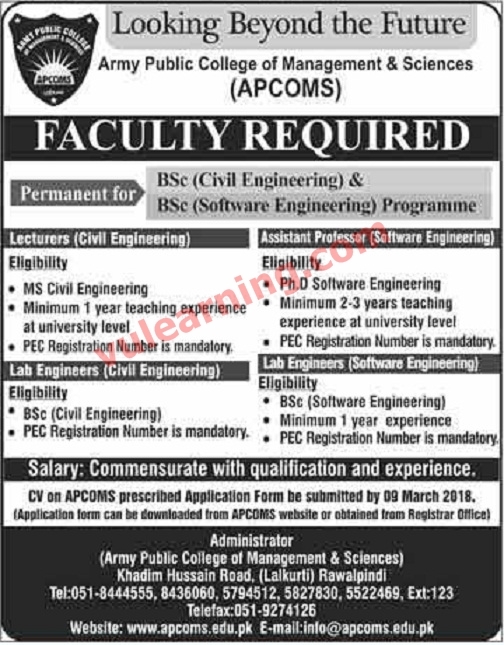 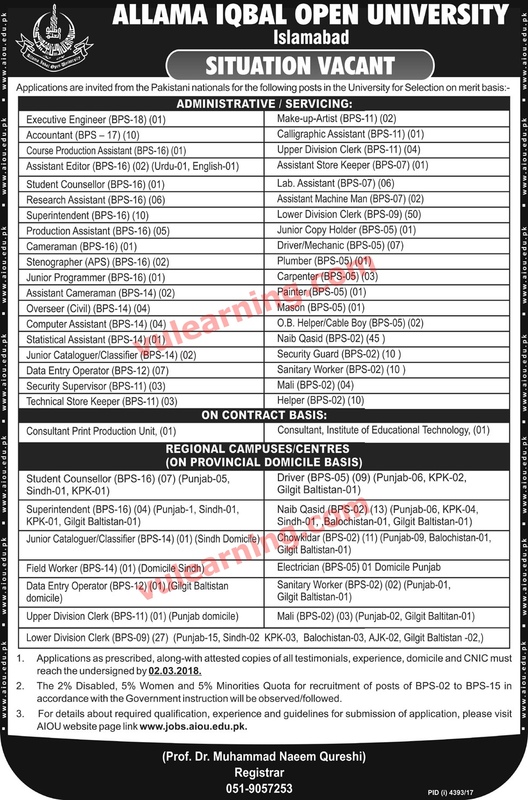 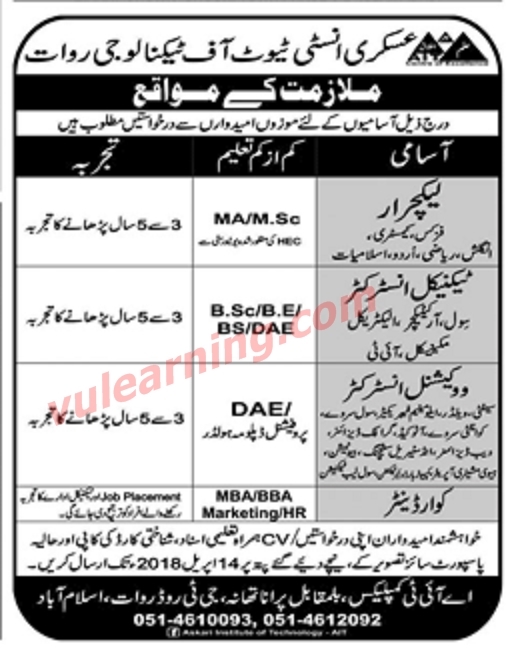 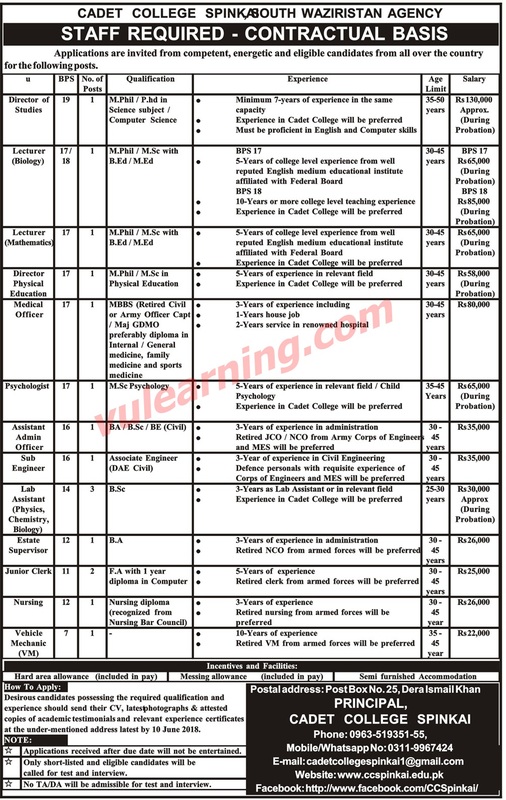 Army Public College of Management & Sciences APCOMS Rawalpindi Jobs 2018 for Lecturers, Lab Engineer. 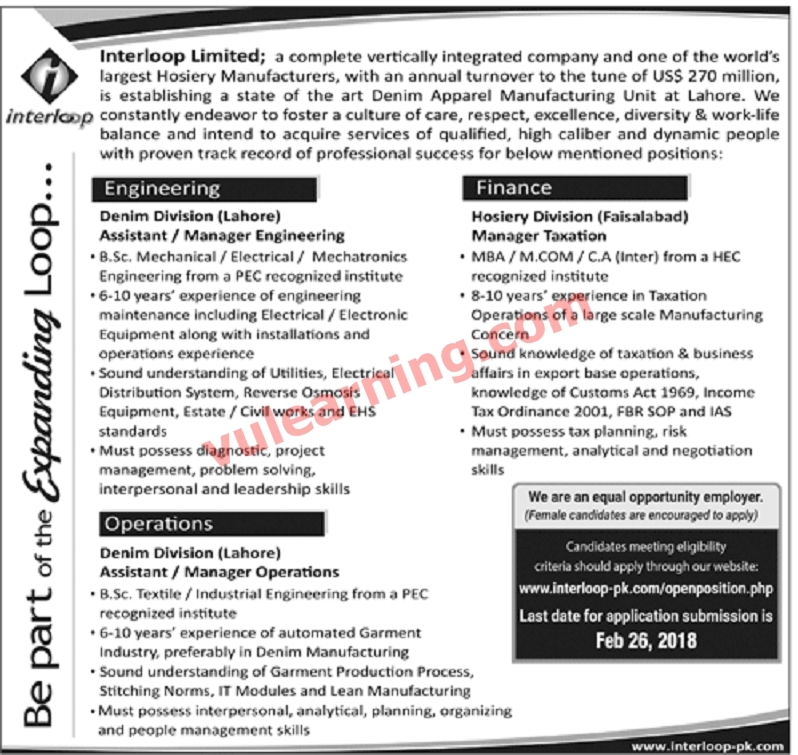 Interloop Limited Faisalabad & Lahore need services of Electrical /Mechanical Engineers .Details are given in link. 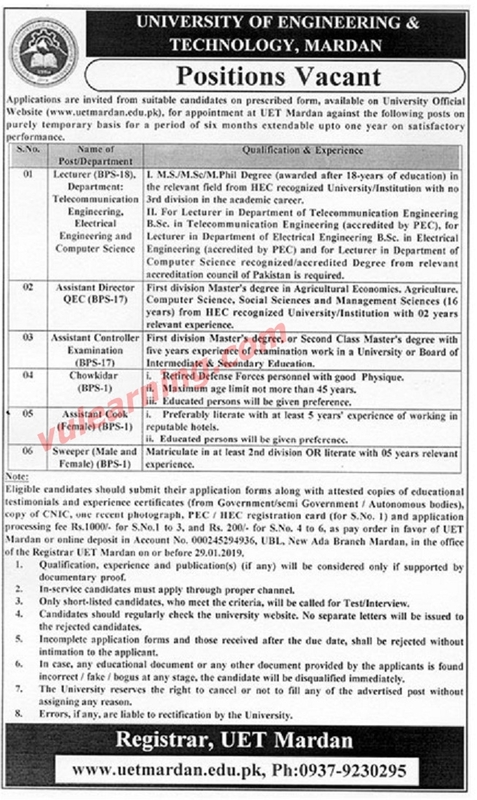 Ministry of Information Technology & Telecommunication need services of Electrical/Mechanical Engineers for post of MEP Engineers.f[Further details are given in link. 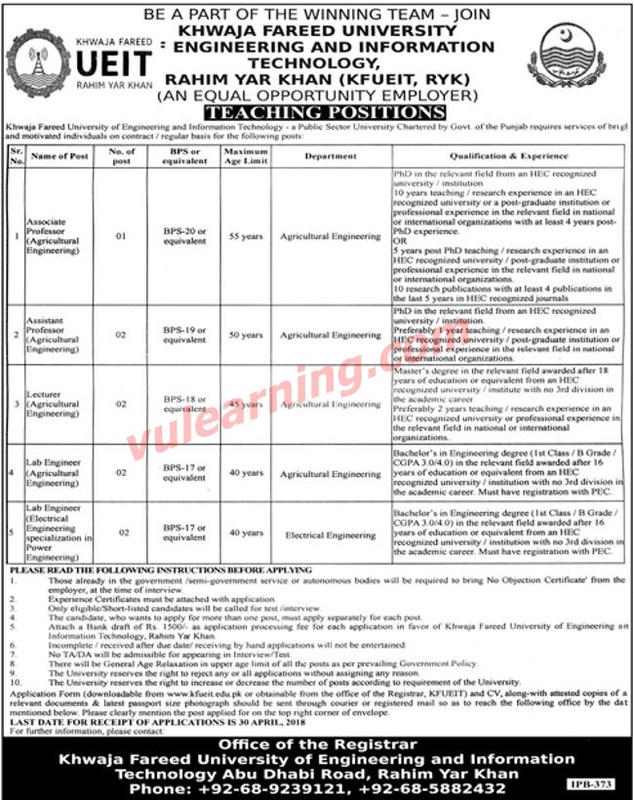 UET Peshawer need Civil Engineers for post of Site Engineer/Senior Engineer/Project Manager .Further Details might seen in link. 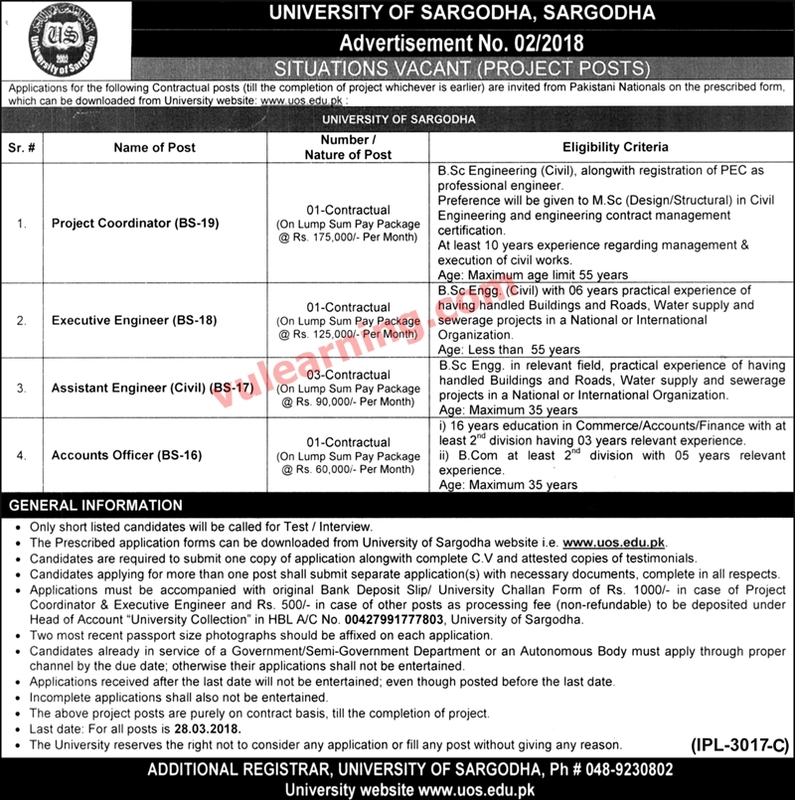 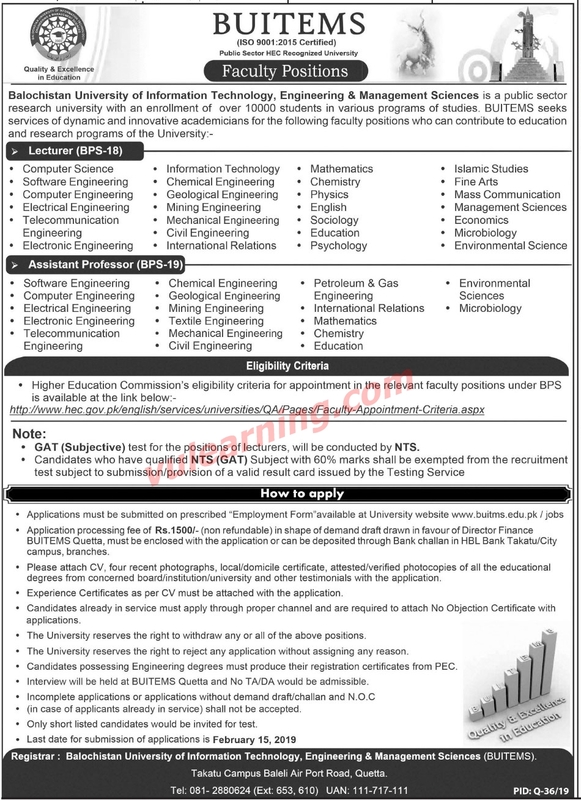 University of Sargodha need Bsc Civil Engineers .Further details are given in link. 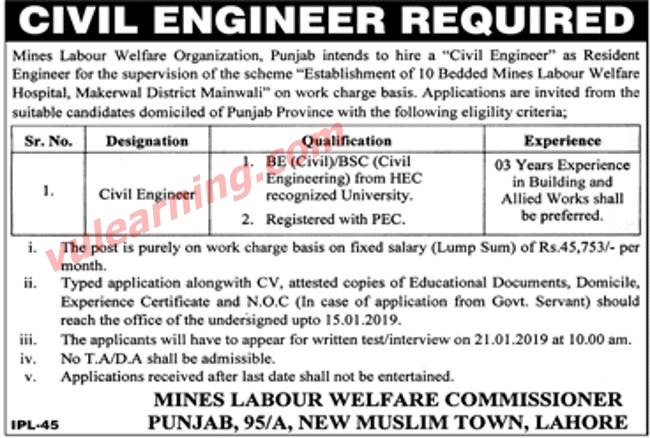 Punjab Govt Servants Housing Foundation need BSc Civil ENGINEERS for post of Executive Director .More details are given in link. 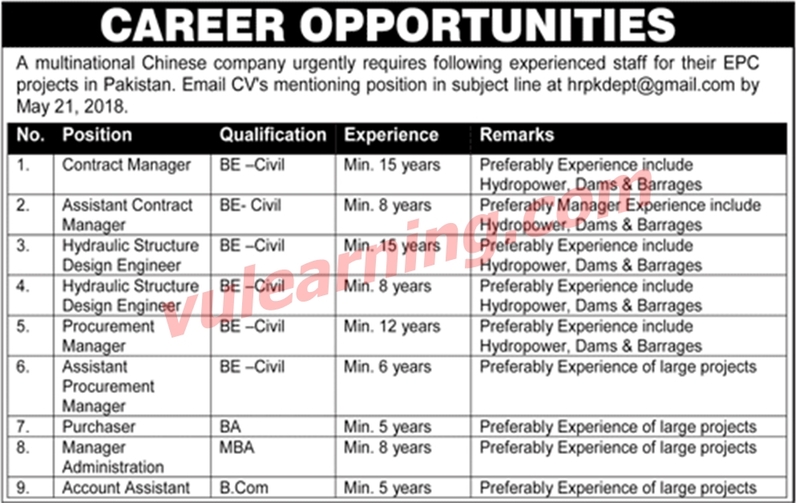 NESPAK need Electrical /Mech/Civil Engineers having BSc degree in relevant Discipline.Further details may be seen in link. 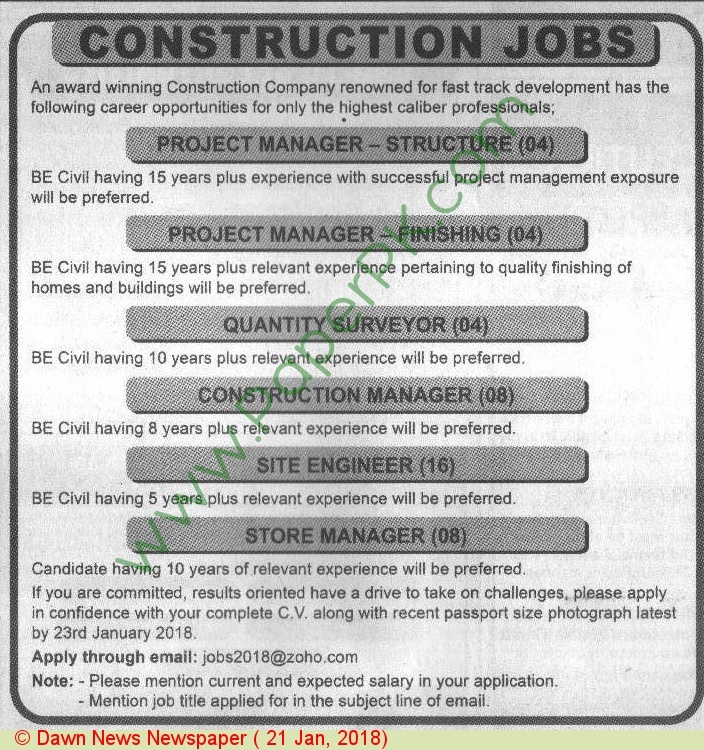 A Public Sector Organisation need BSc civil Engineers for post of Assistant Manager. 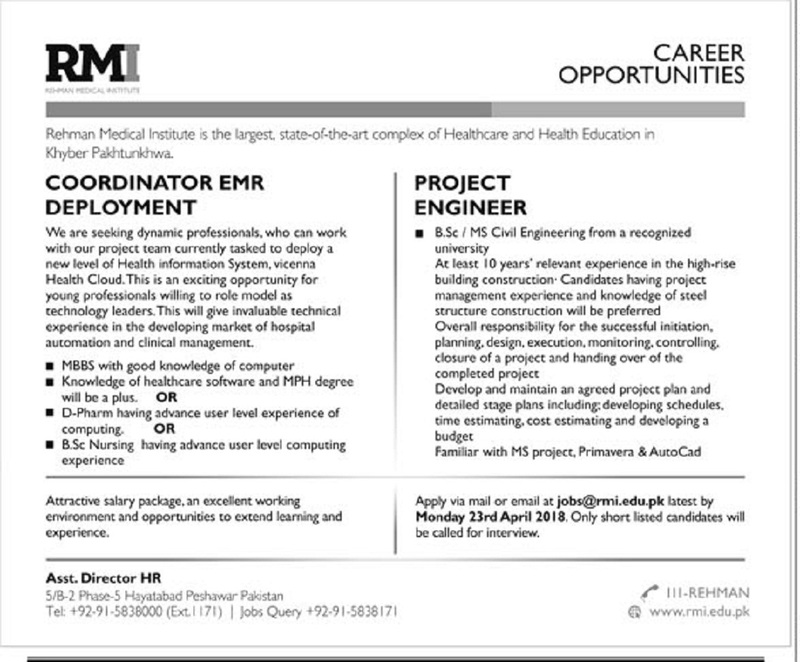 Interested Candidates may visit the link for further info. 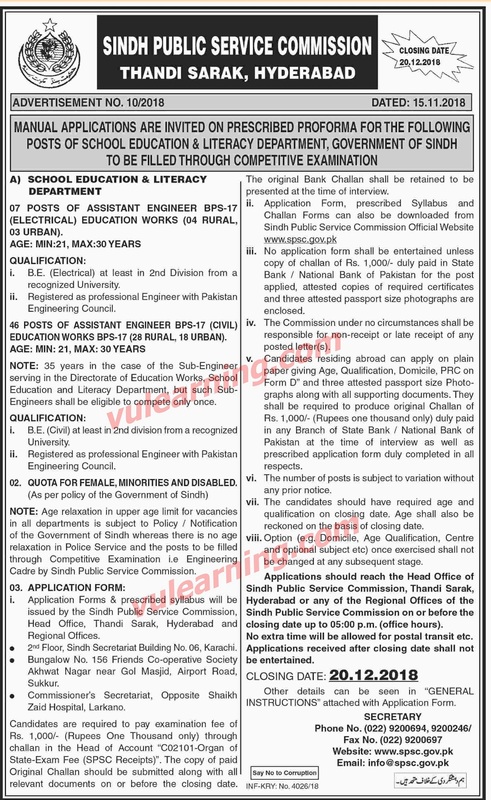 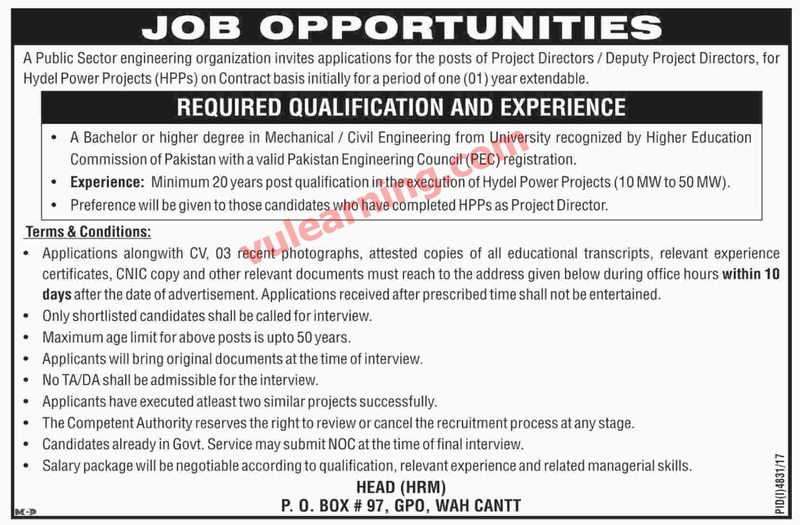 Pakistan WAPDA Foundation need Civil Engineer for post of Dir General (Housing). 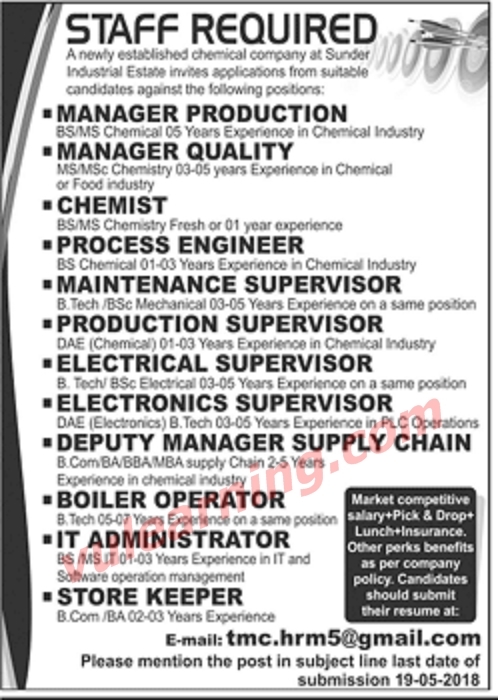 Further details are given in link. 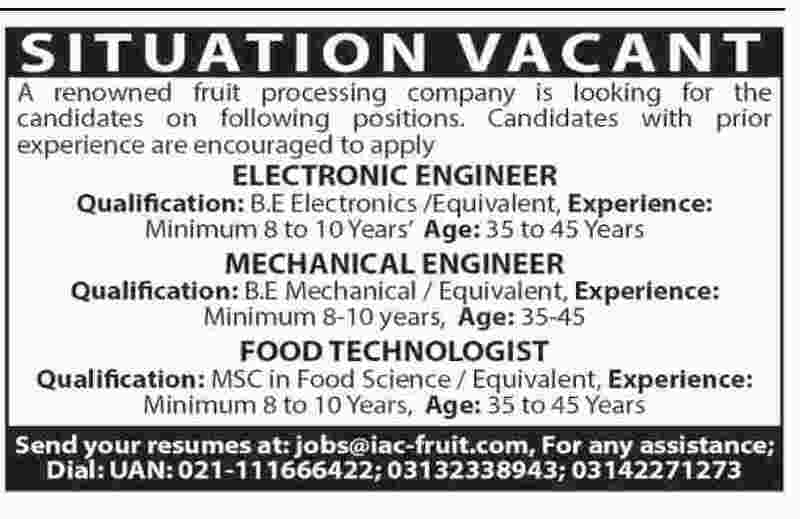 A Fruit Processing Company need BSc Mechanical Engineer.Further Details are given in link. 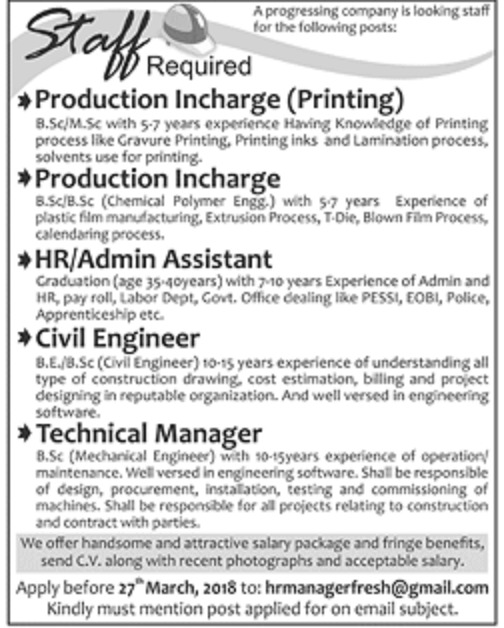 A Processing Company is looking for Civil Engineers .More info is given in link. 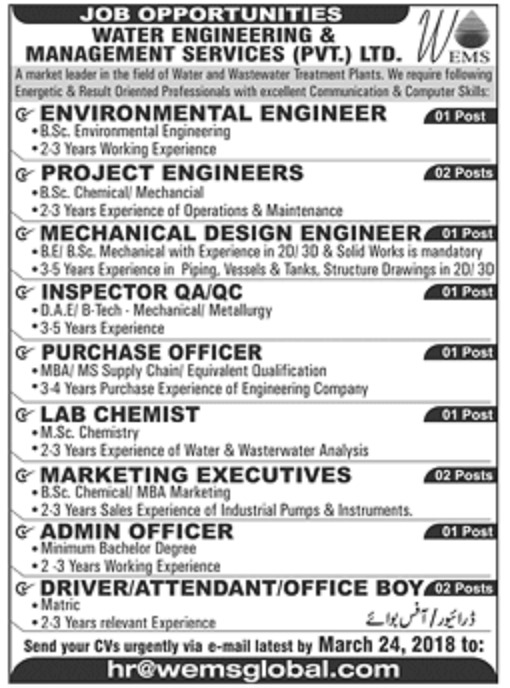 Water Engineering & Management Services need BSc Mechanical Engineer.Further details are given in link. 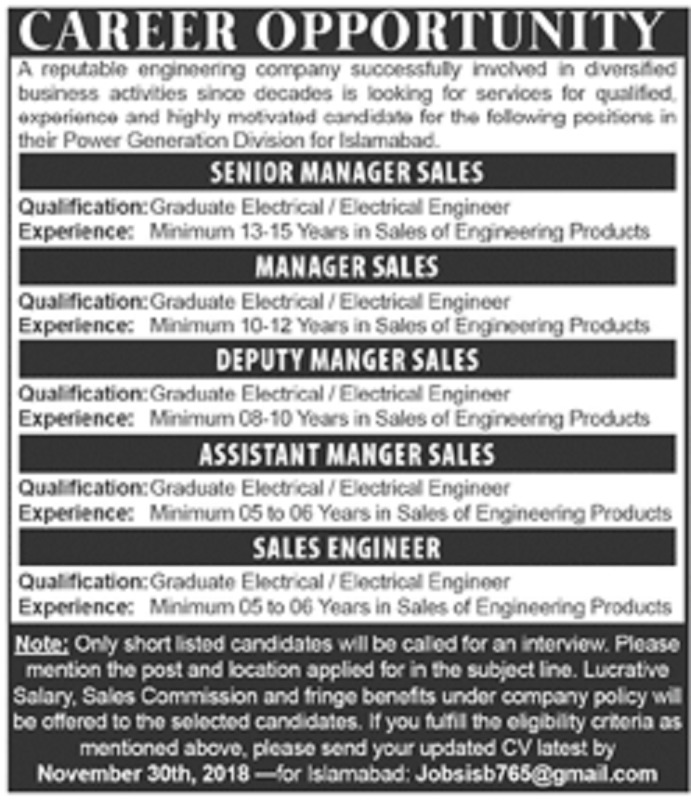 Rupali Group Pakistan need Electrical /Mechanical Engineers .More info is given in link. 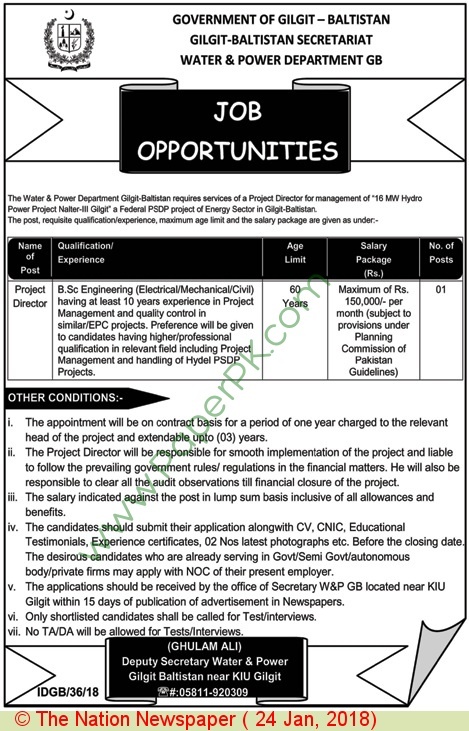 A govt Organization Based in Karachi need services of Electrical Engineers.Further info may be checked in link. 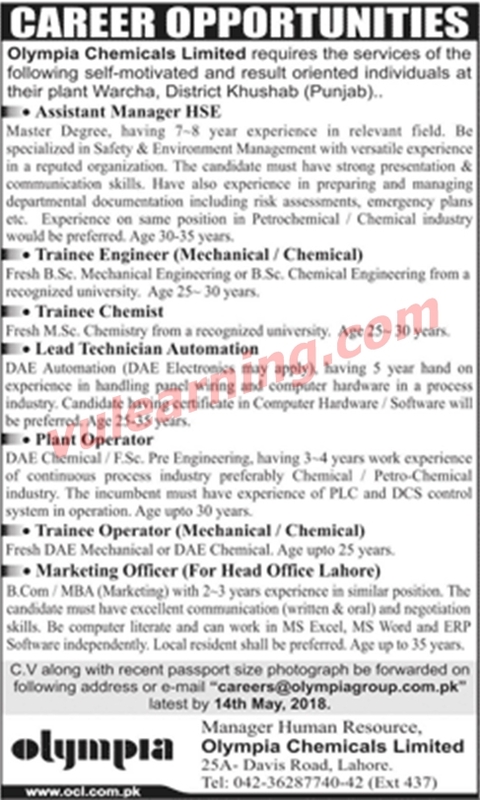 Ministry of Industries Lahore need Mechanical Engineers.Further details are given in link. 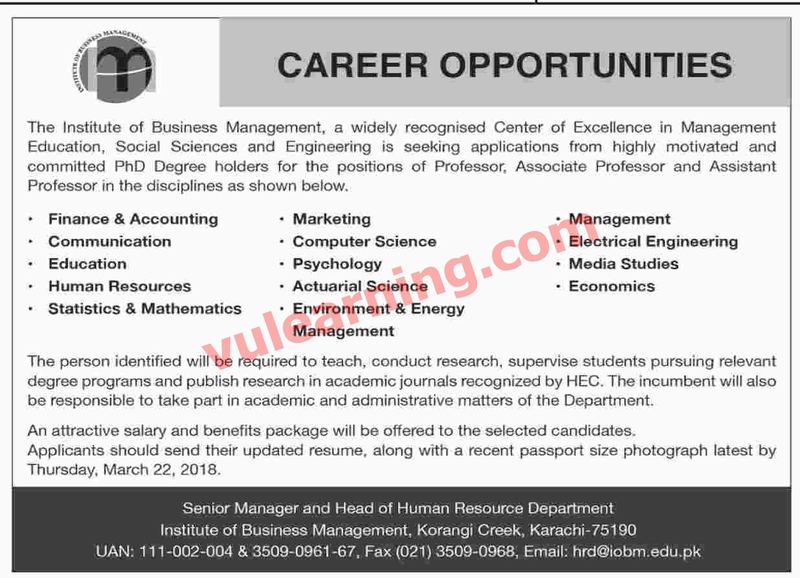 Institute of Business Management karachi, need Electrical Engineering Faculty.More details are given in link. 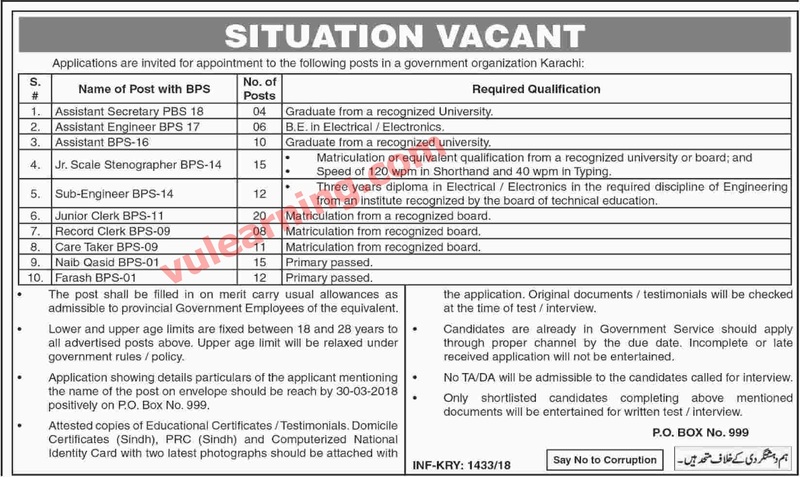 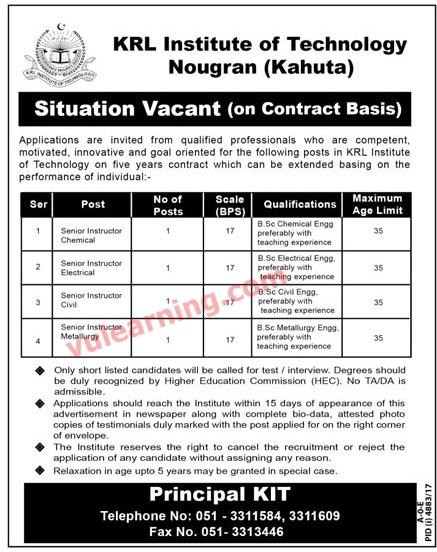 KRL Institute of Technology Kahuta need services of Civil/Electrical Engineers.More details may seen in link. 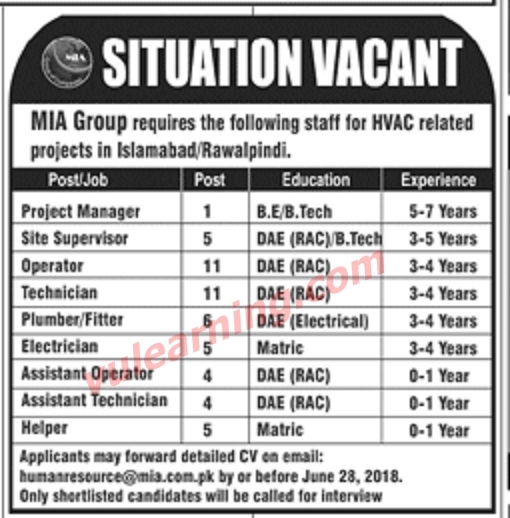 MIA Group need services of BSc Mechanical Engineers.Further Details are given in link. 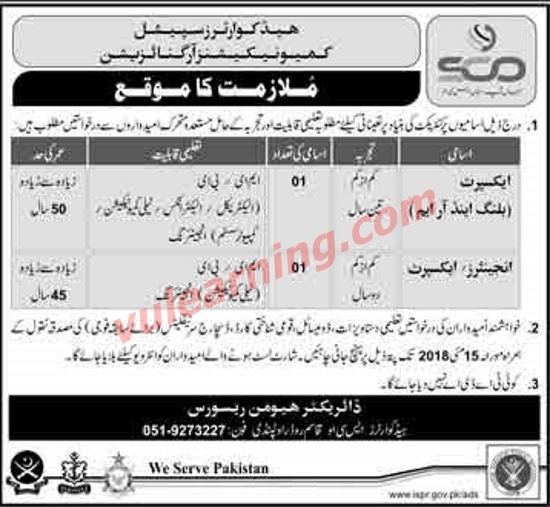 Karachi Shipyard & Engineering Services need BSc Mechanical Engineer. 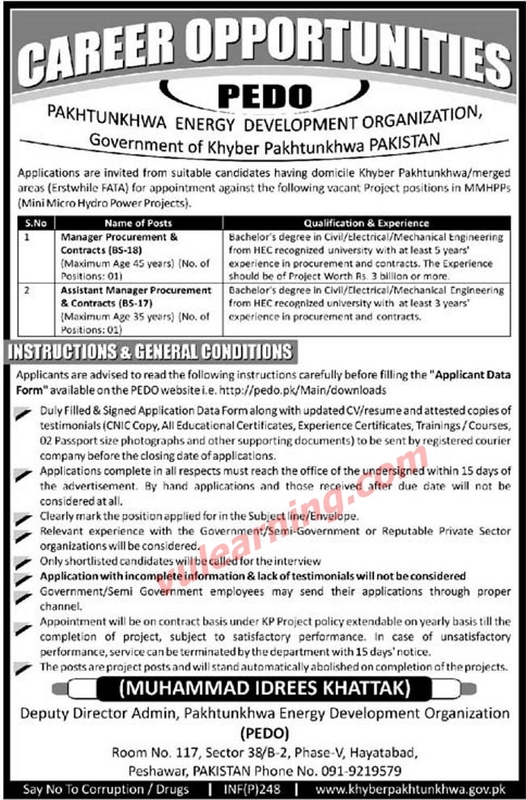 More details may seen in link. 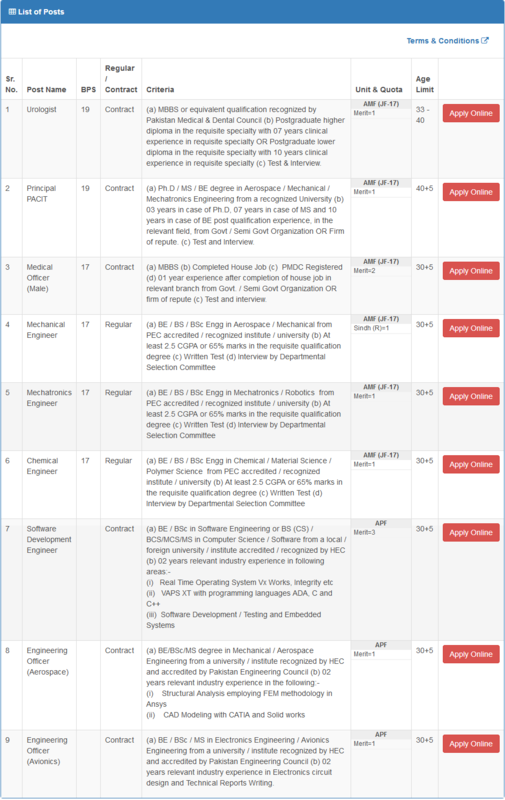 Reliance corporation need BSc Mechanical /Electrical Engineers.Further info may collected through link. 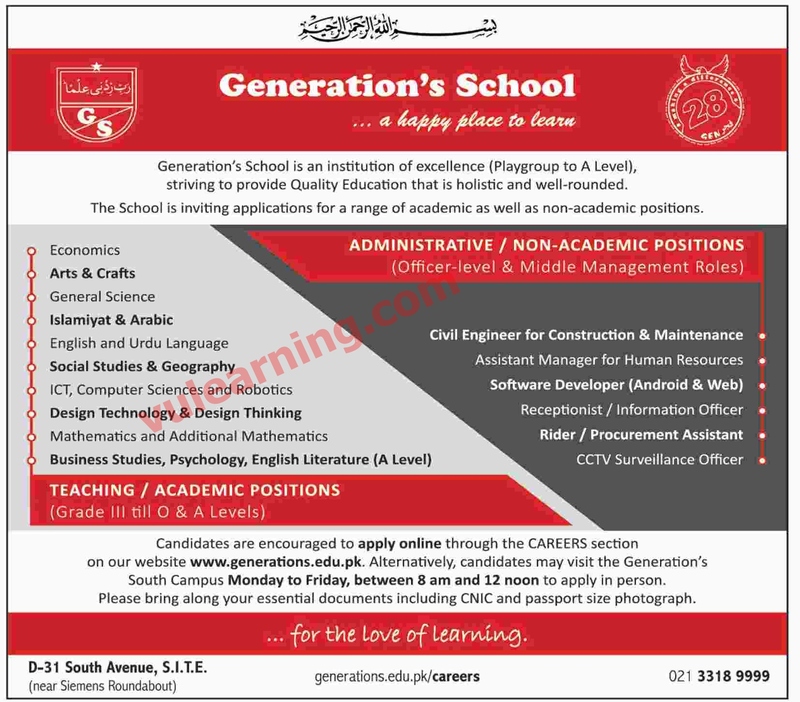 Generation School System Karachi need Civil Engineer for Construction Site.Further details may seen in link. 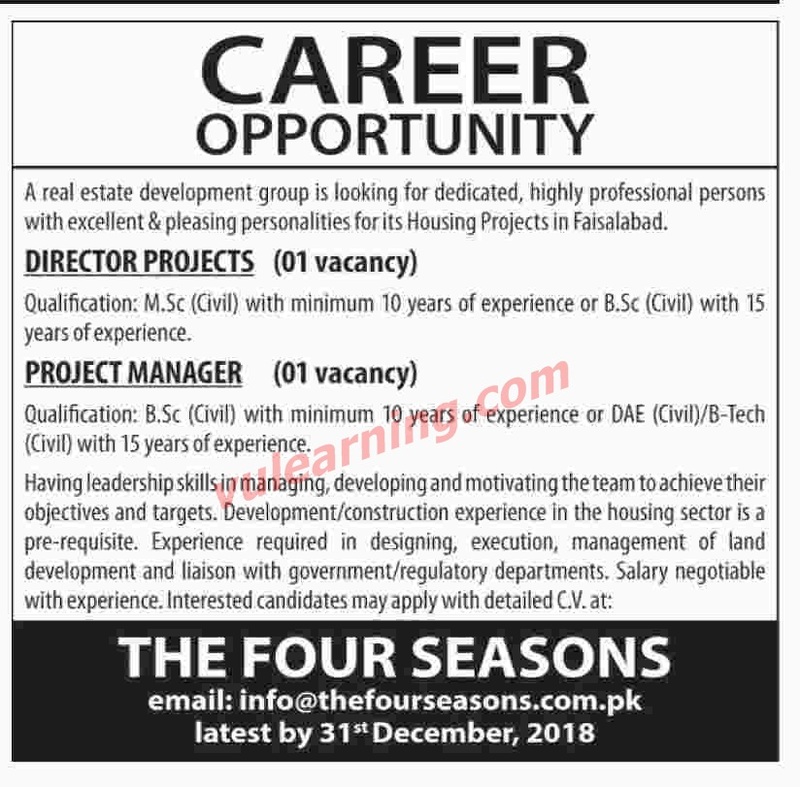 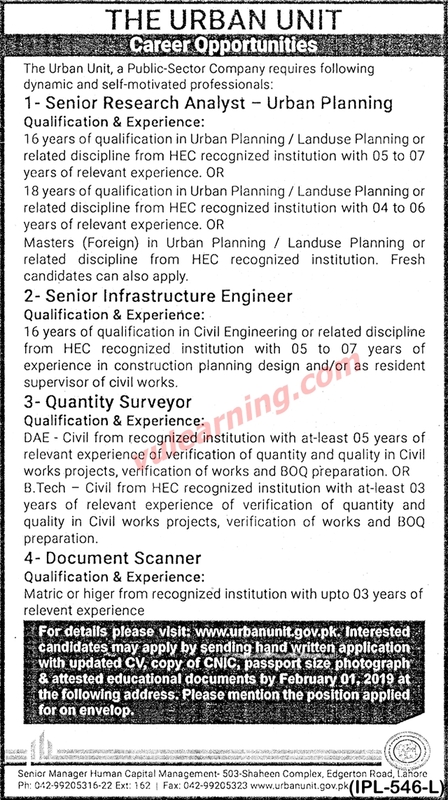 Fazaia Housing Scheme Lahore need resident Engineer having BSc degree in Civil Engineering from a recognized institute. 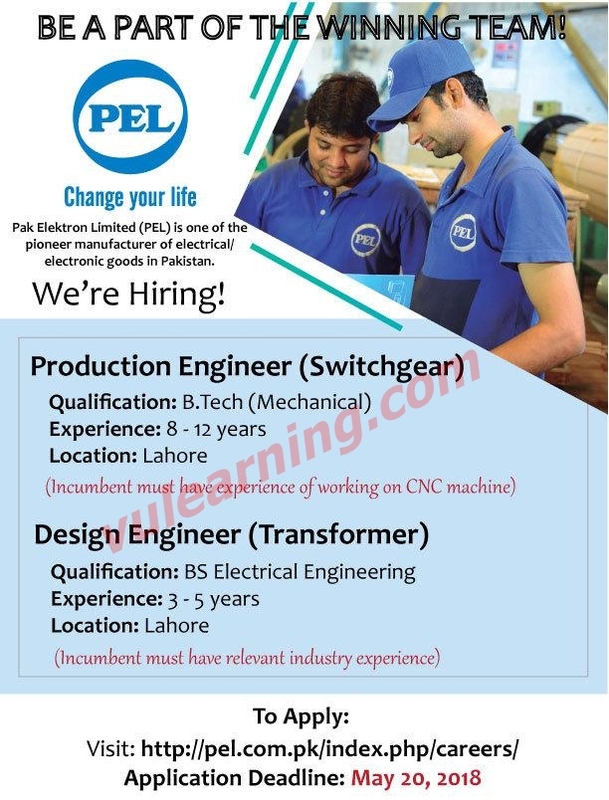 SHIBLI Electronics need BSc Electrical/Mechanical Engineers.More details may seen here. 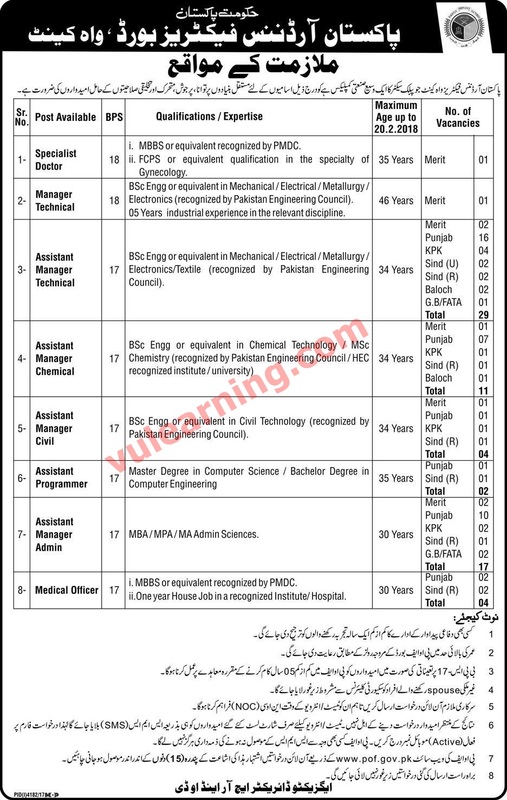 Nishtar Hospital Multan need BSc Civil/Electrical Engineers for post of SDO. 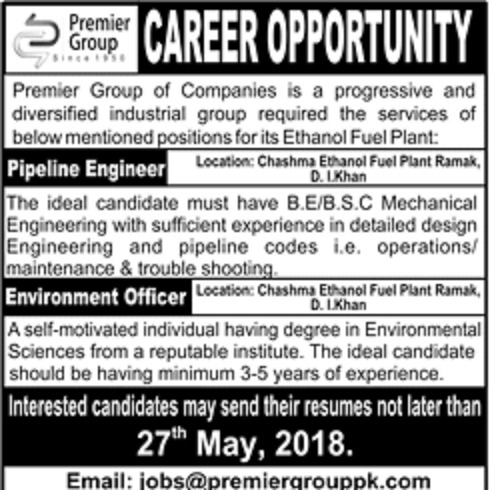 more details are given in link. 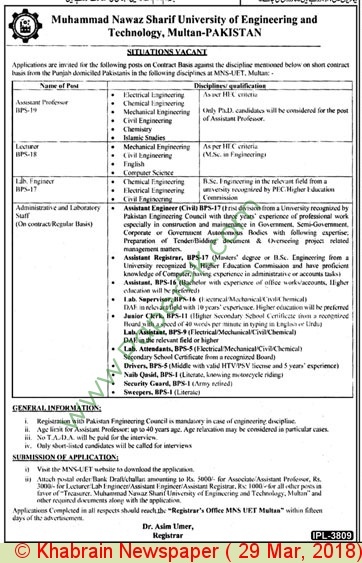 UET Peshawer need BSc Electrical/Mechanical Engineers for post of Lab Engineer. 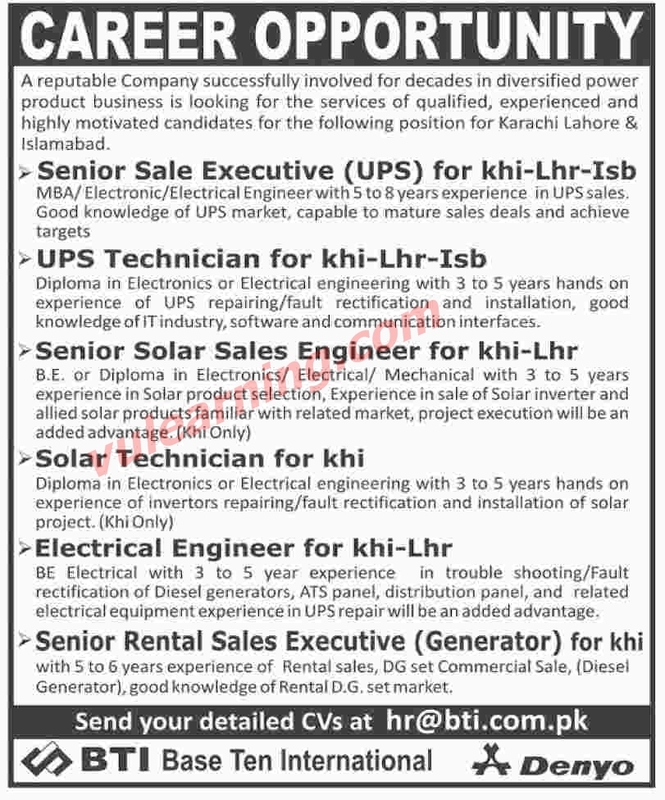 Further details are given in link. 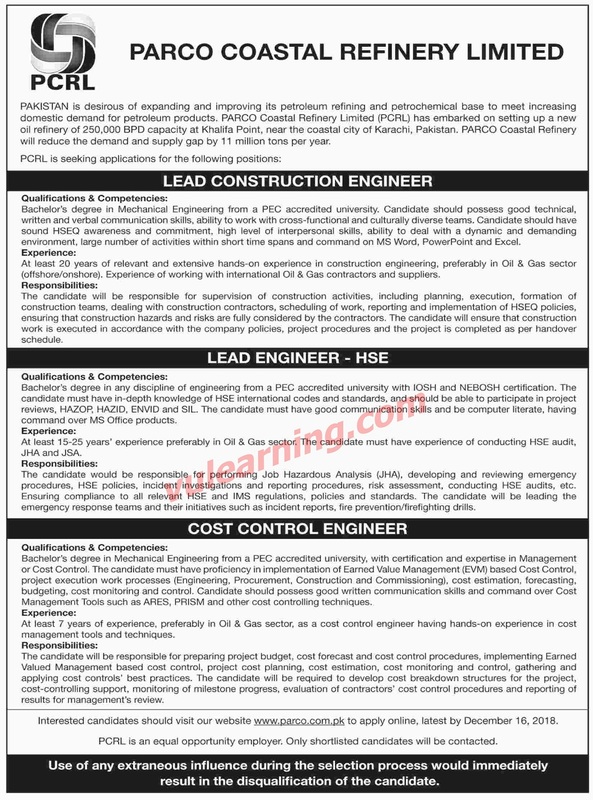 Karachi Shipyard & Engineering services need BSc Electrical /Mechanical Engineers .Further details are given in link. 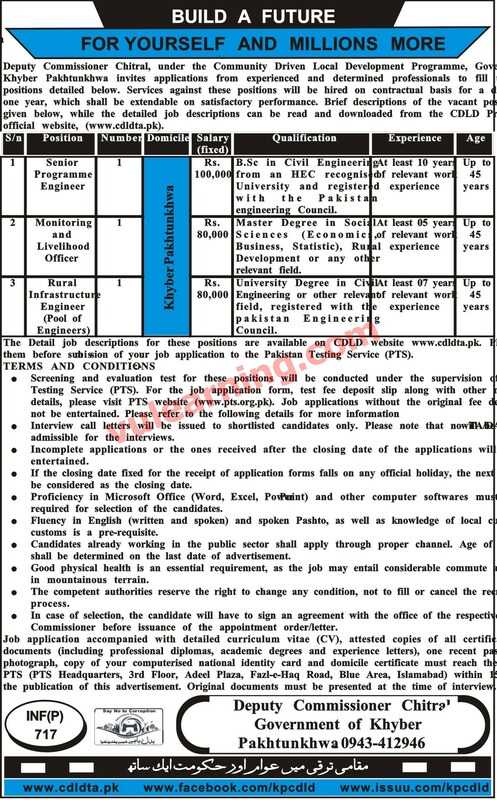 Punjab Public Service Commission need BSc Mechanical Engineer for post of Assistant Director Agriculture.Further details are given in link. 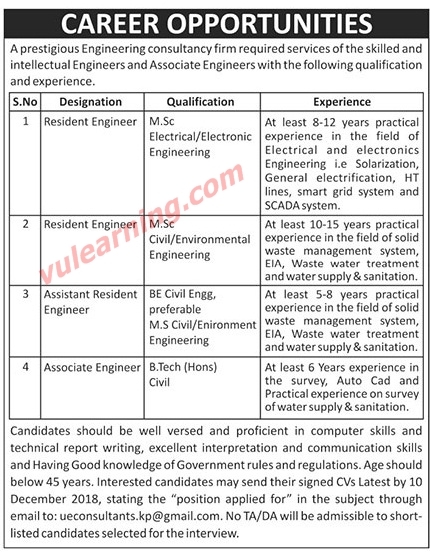 CTTI Islamabad need BSc Mechanica / Civil Engineers for post of HOD & Instructors.Further details are given in link. 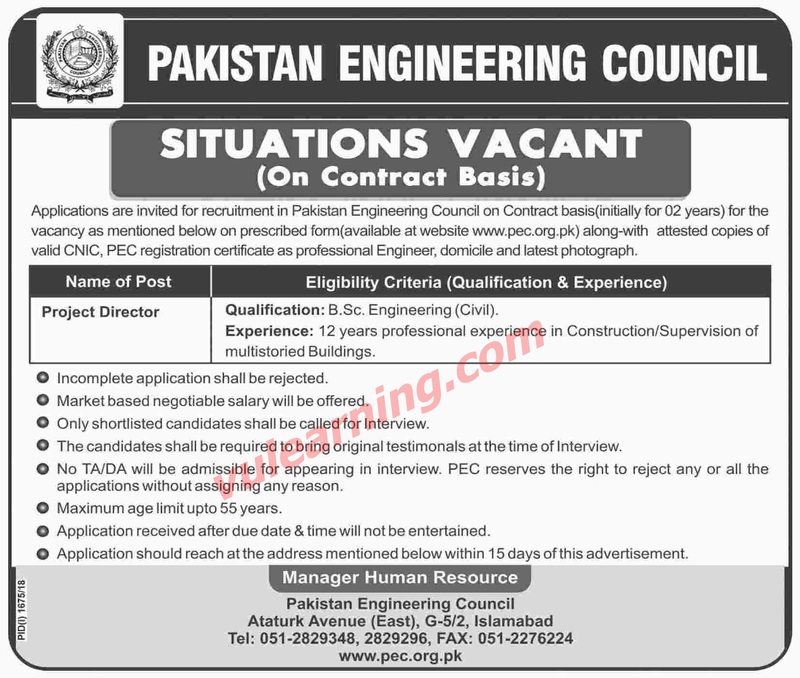 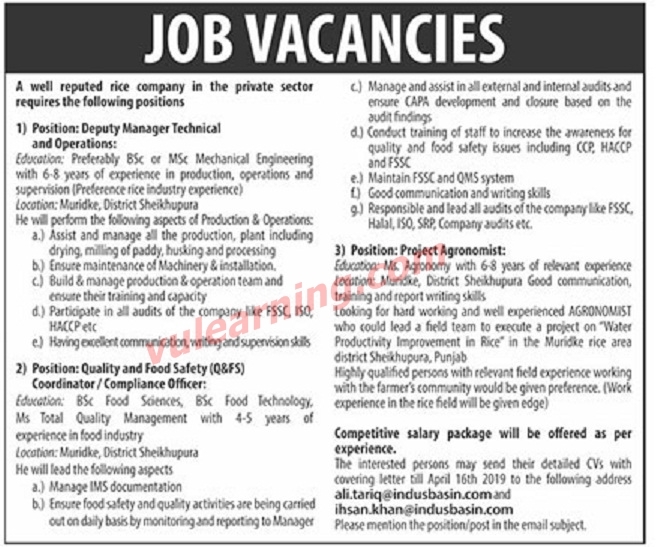 Pakistan Agriculture Storage & Services Corporation ltd need BSc Civil Engineer For post of Assistant Engineer. 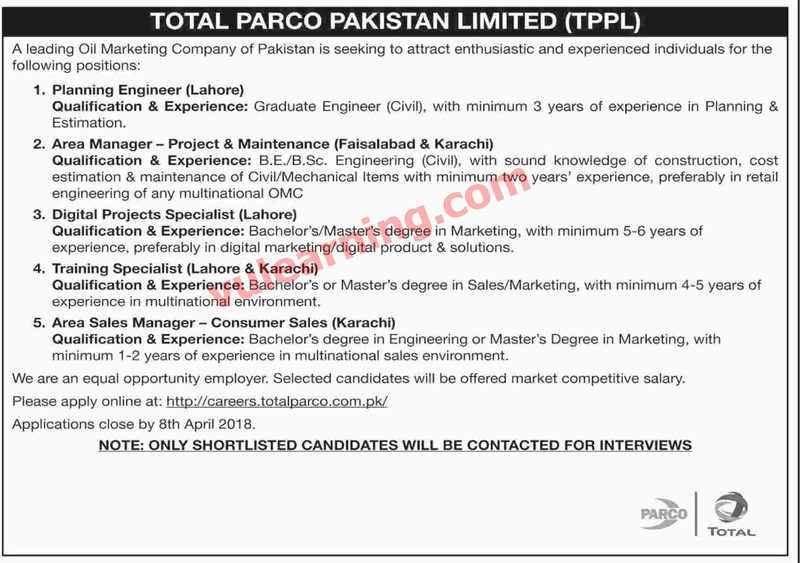 Total Parco Pakistan Limited need BSc civil Engineers in its Projects countrywide . 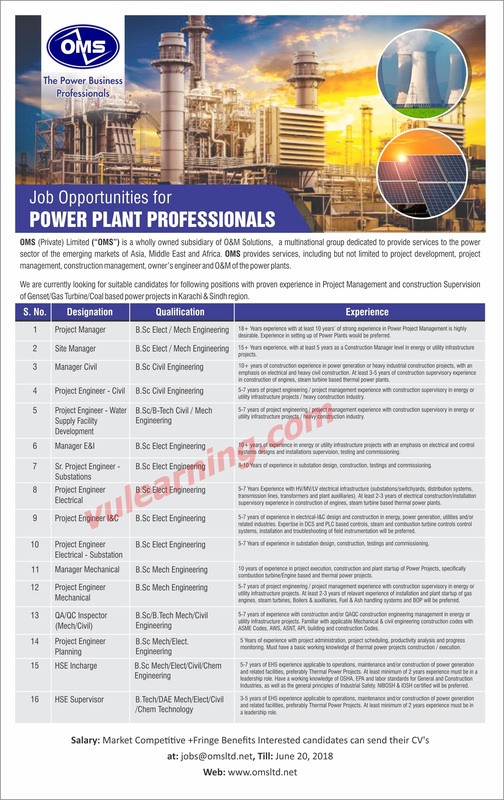 Interested Candidates may visit link for more info. 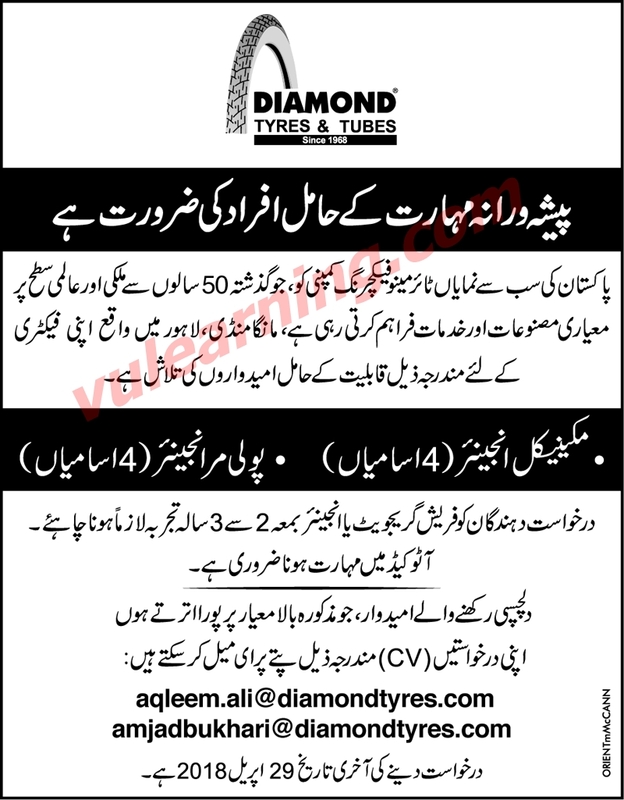 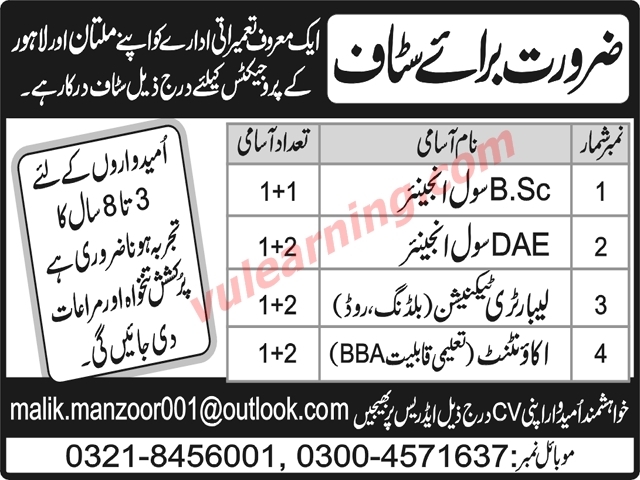 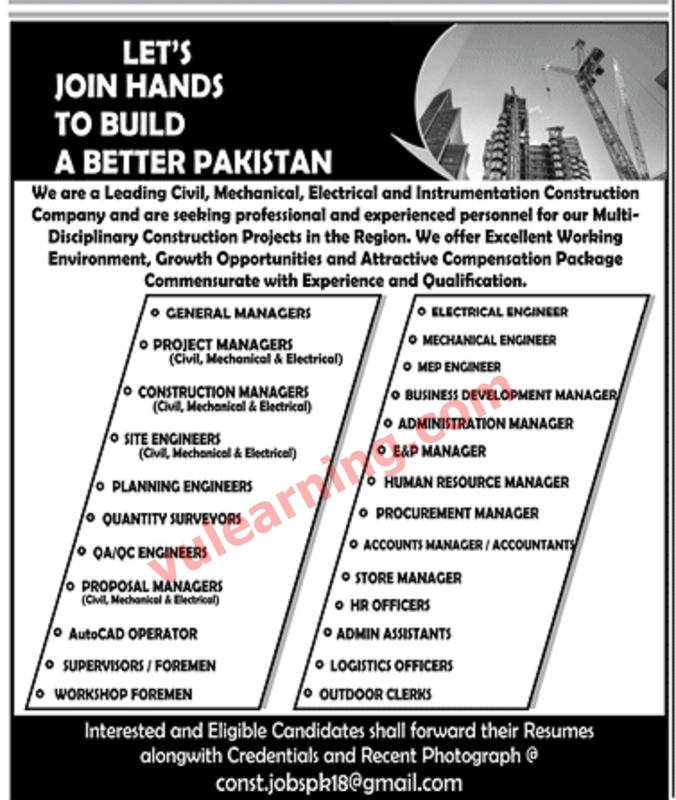 A leading Contruction Company in pakistan need BSc Electrical/Mechanical/Civil Graduates . 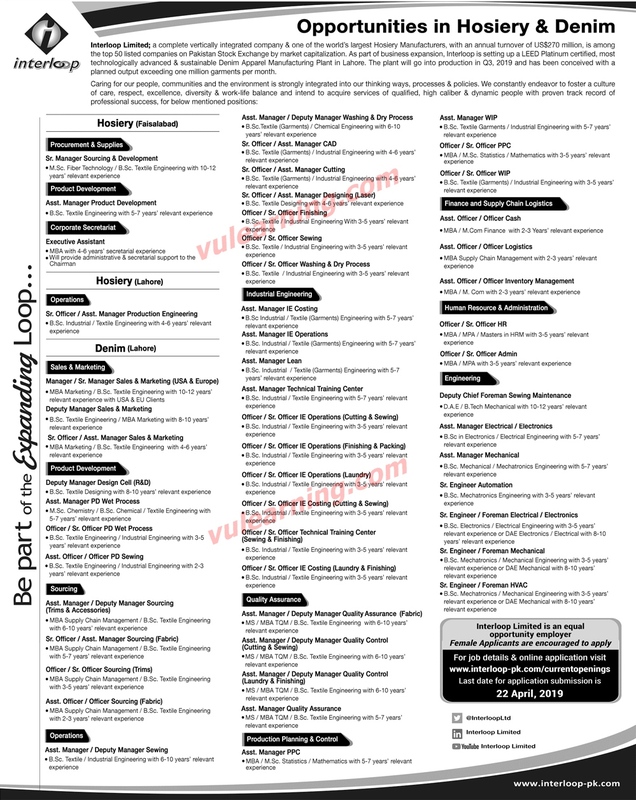 More info may be check in link. 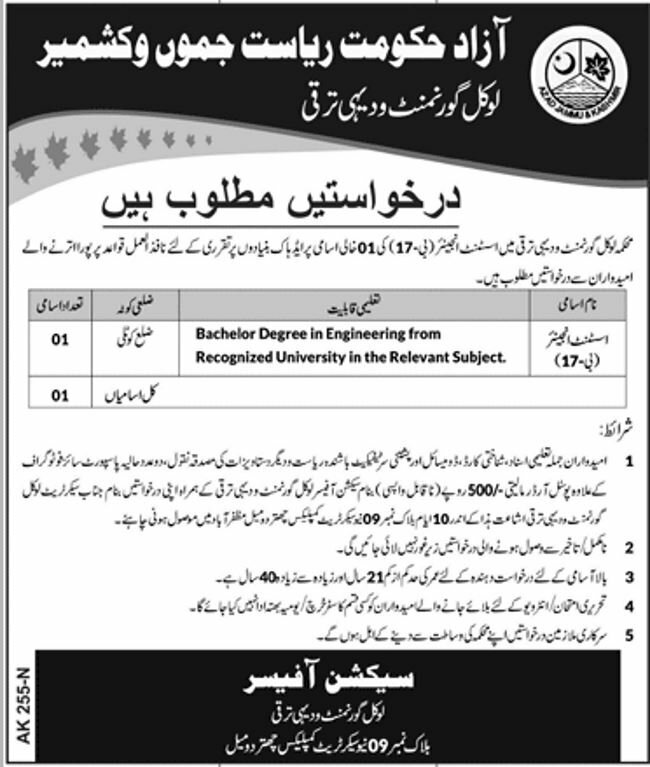 University of Swat need services of civil Engineer .More details may be seen in link. 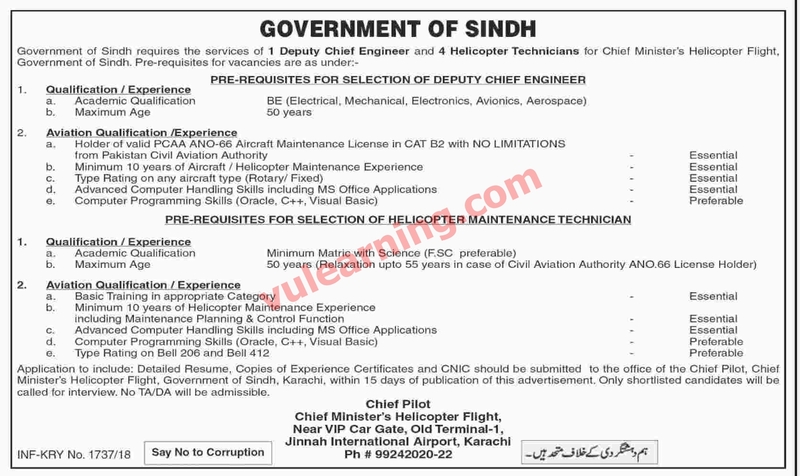 CM Sindh Office need srevices of Electrical/Mechanical Engineers for post of Dy Chief Engineer. 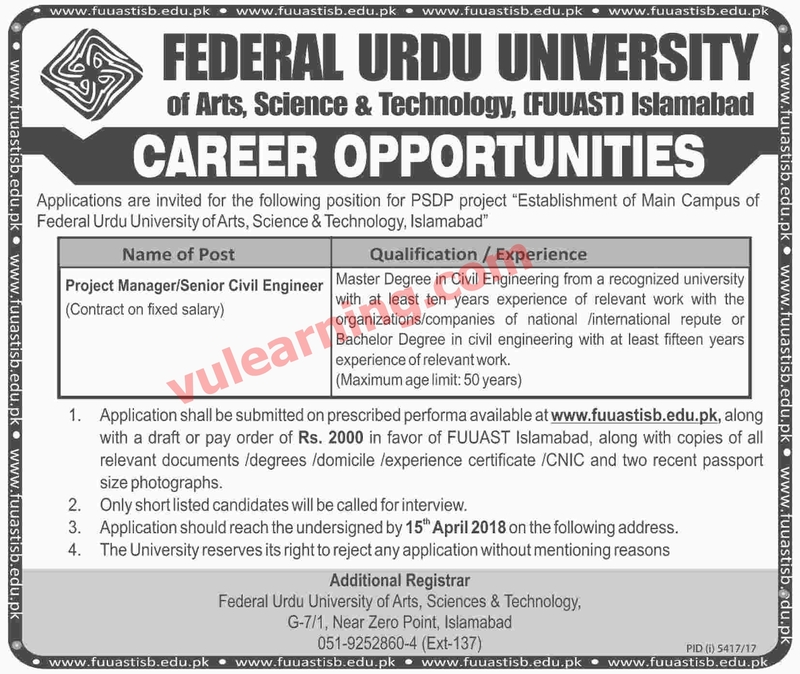 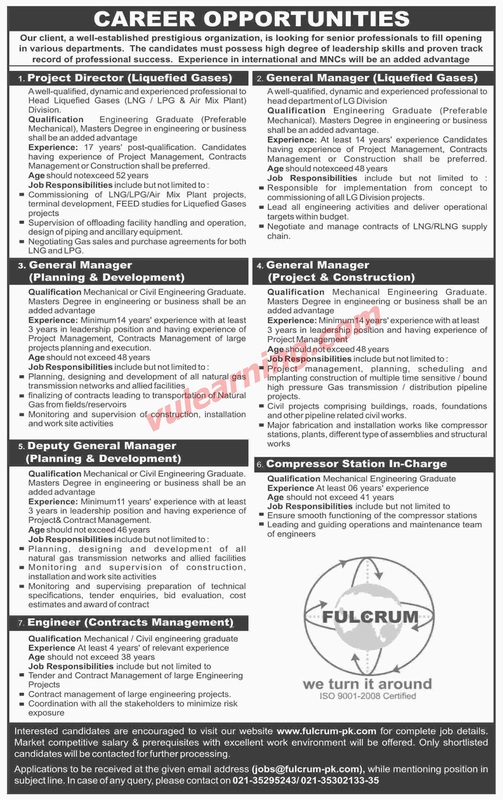 Federal Urdu University Islamabad need Civil Engineers for post of Project Manager . 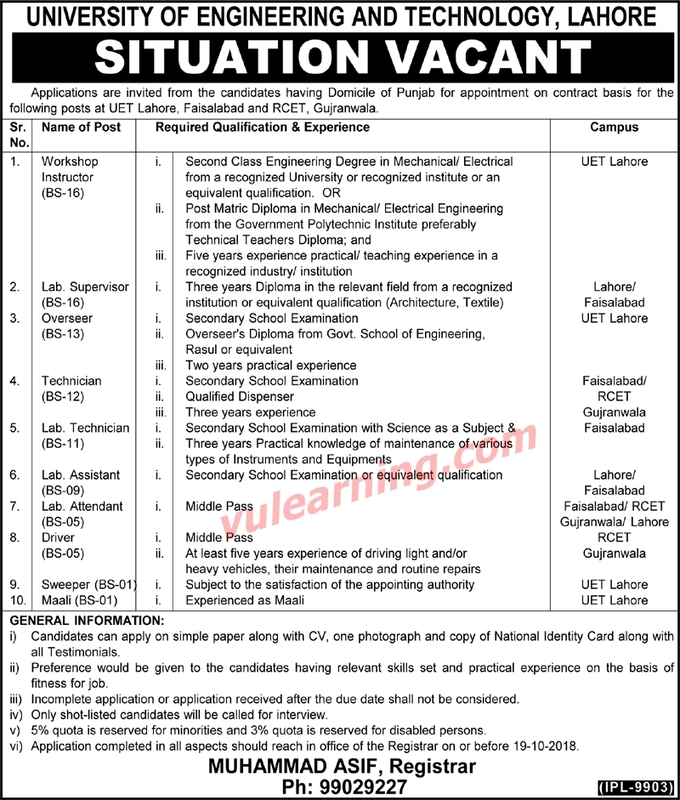 University of Punjab need services of BSc Electrical Engineers for post of lab Engineer.further details may seen in link. 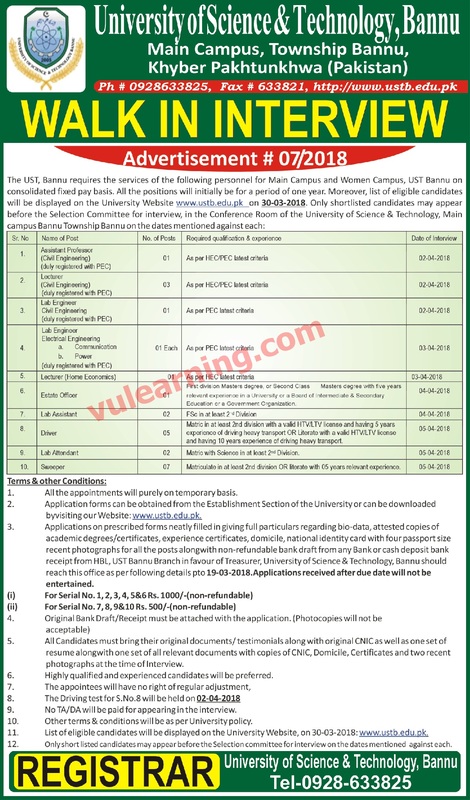 MNS University Multan need lab Engineers for Electrical/Civil Department.Further details are given in link. 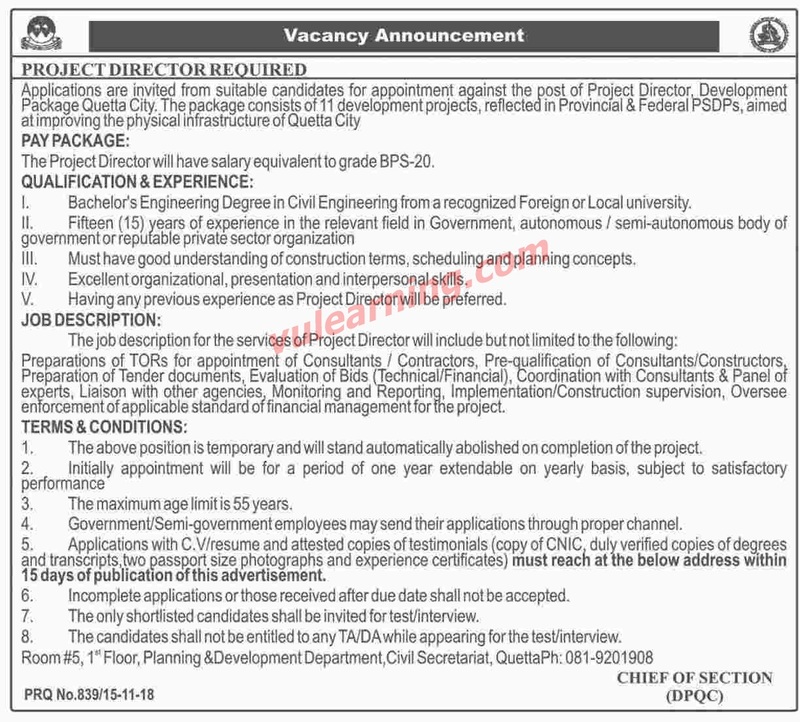 A National NGO need services of Civil Engineer for post of Project Engineer.Further details are given in link. 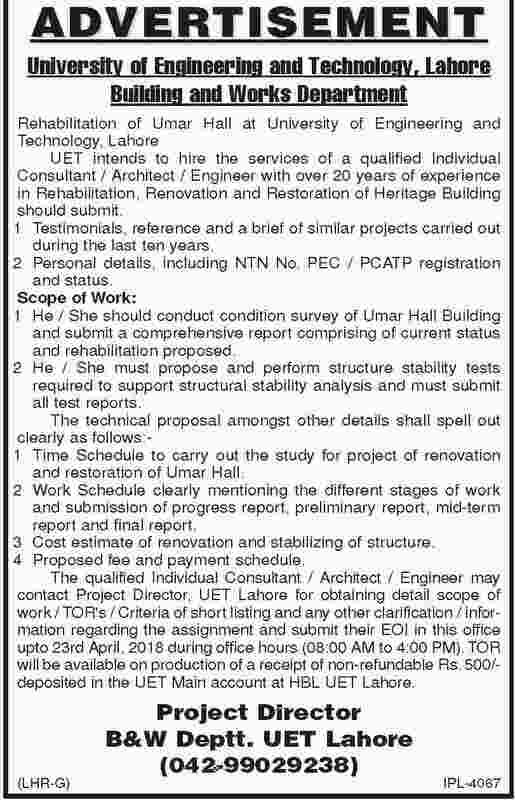 UET Lahore need civil engineer in building & work department. 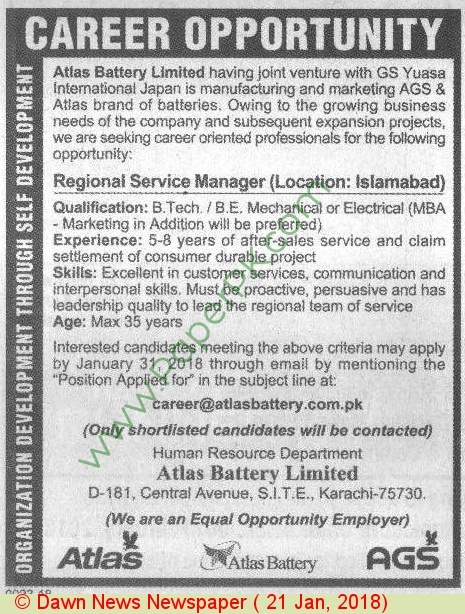 Further details may seen in link. 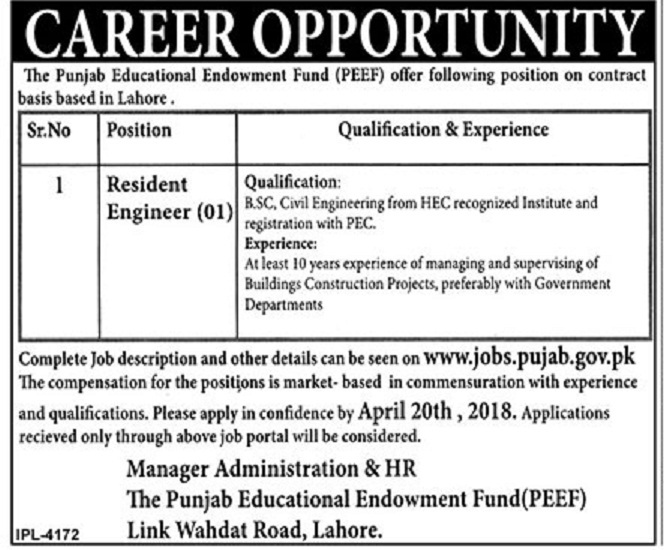 Punjab Education Endowment Fund need services of civil engineers.More info is given in link. 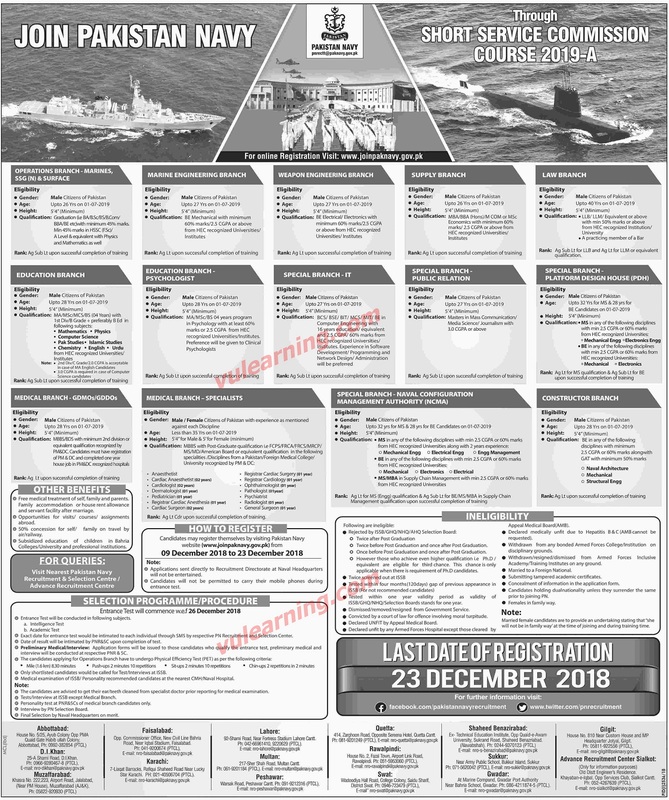 Pakistan State Oil Annual Training Program 2018.Further details & online application can be sent through link. 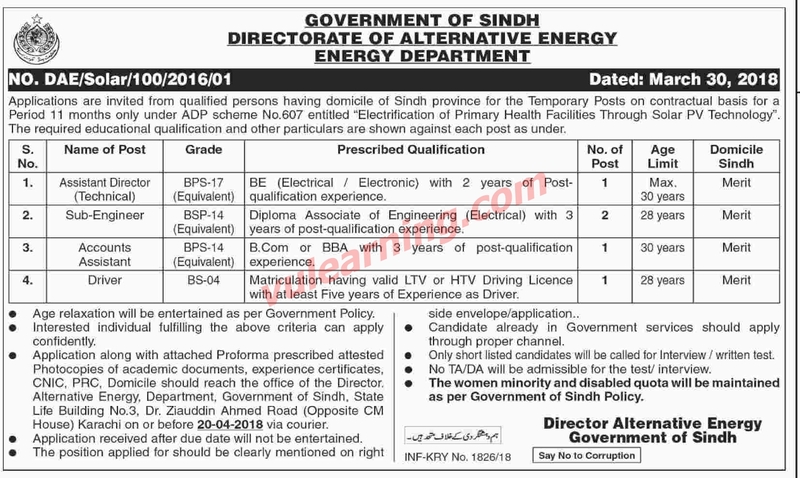 Govt of Sindh ,Directorate of Alternative Energy Department need BSc Electrical Engineers.Further details may seen in link. 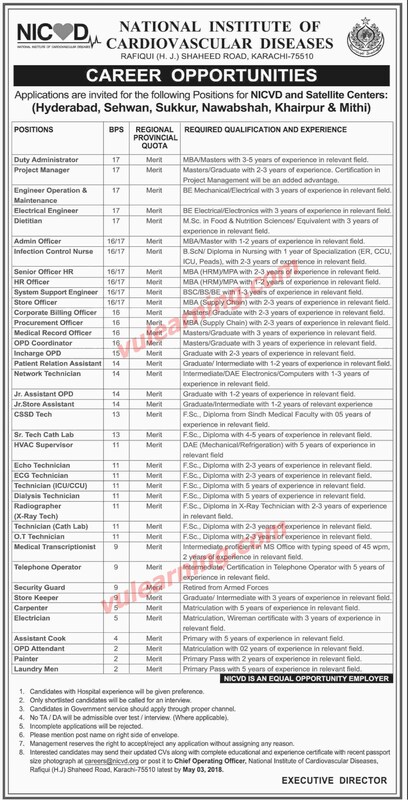 State Life Insurance need services of BSc Electrical/Mechanical/Civil Engineers .More info is given in link. 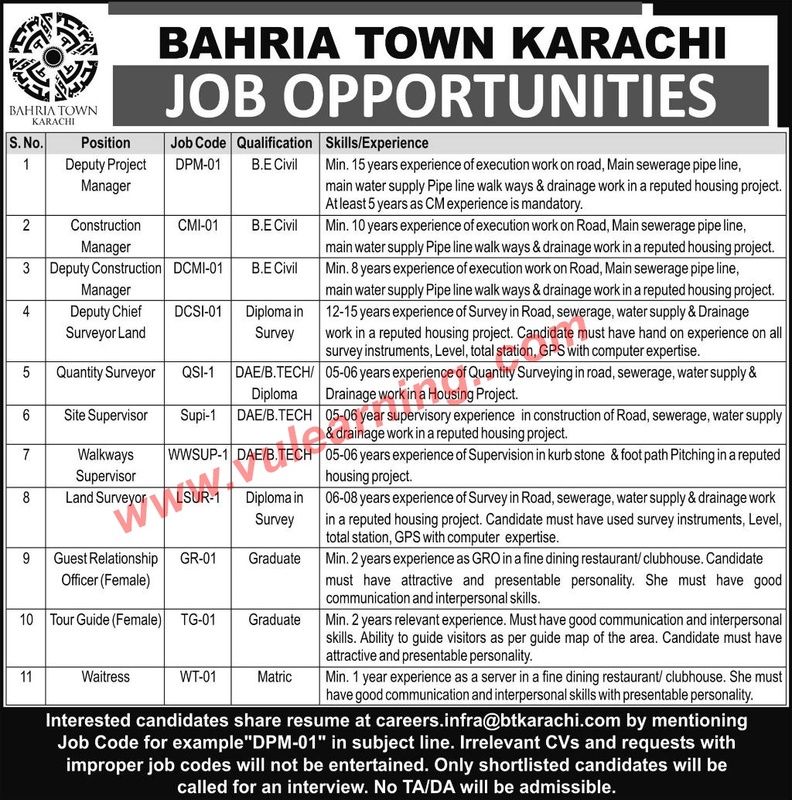 Bahria Town need Services of Civil Engineers.Further details may seen in link. 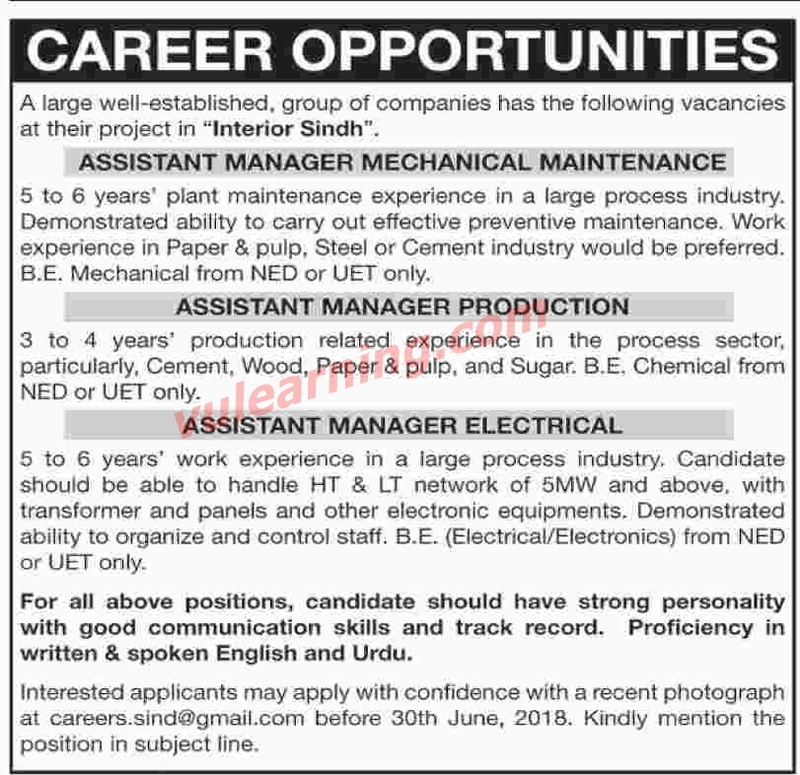 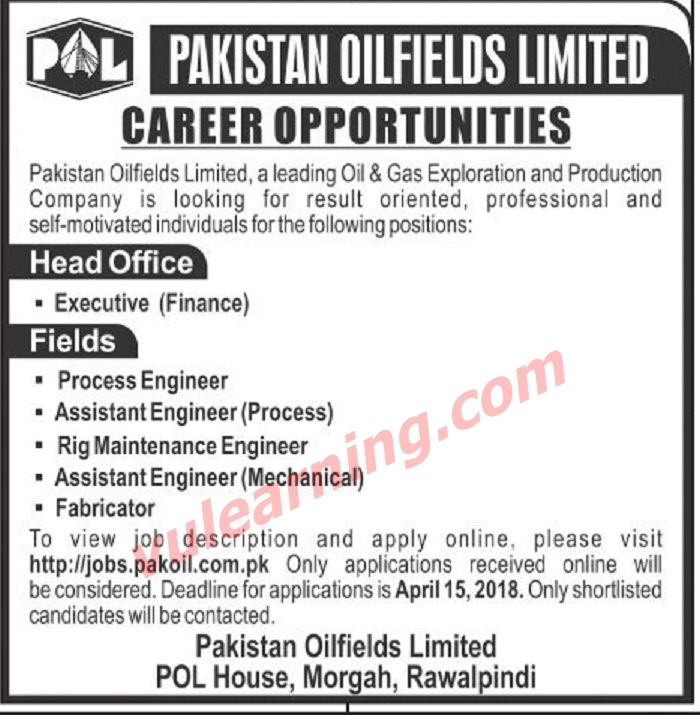 Pakistan Oilfields Limited POL need Mechanical Engineers .Further details may seen in link. 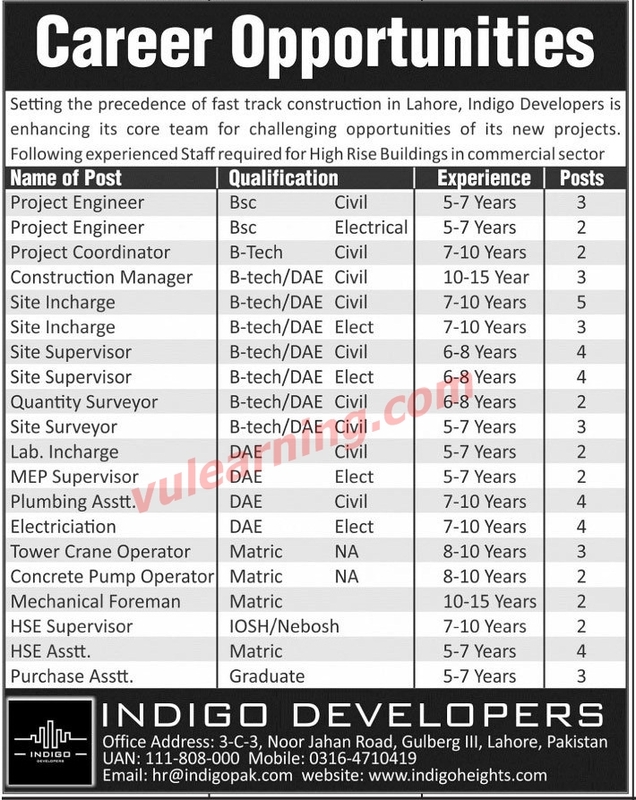 Indigo Developers Lahore need services of BSc Electrical/Civil Engineers.Further details may seen in link. 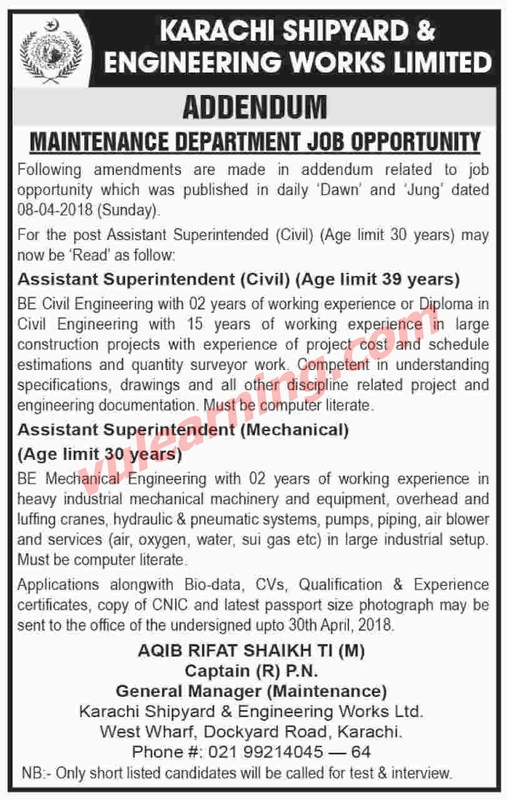 Capital Development Authority (CDA) need BSc Electrical/Mechanical/Civil Engineers.Further details are given in link. 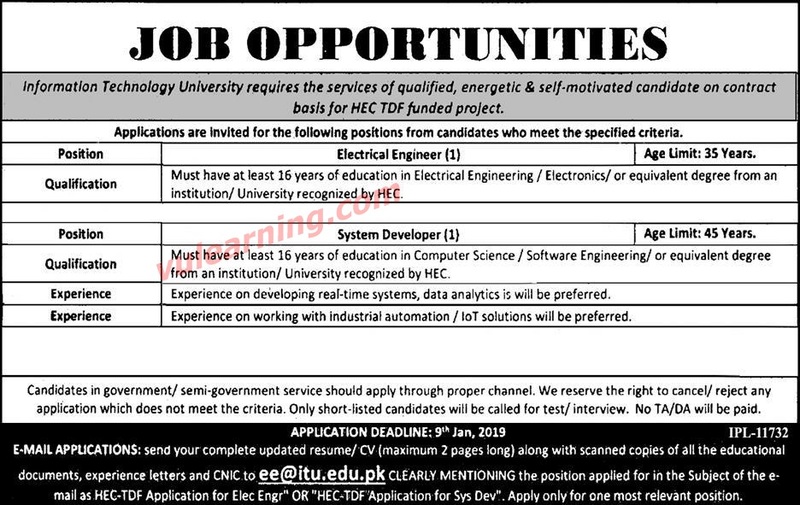 UEIT (Khawaja Fareed University of Engineering & Information Tech Rahim Yar Khan) need Electrical Engineers for post of Lab Engineer.Further details may seen in link. 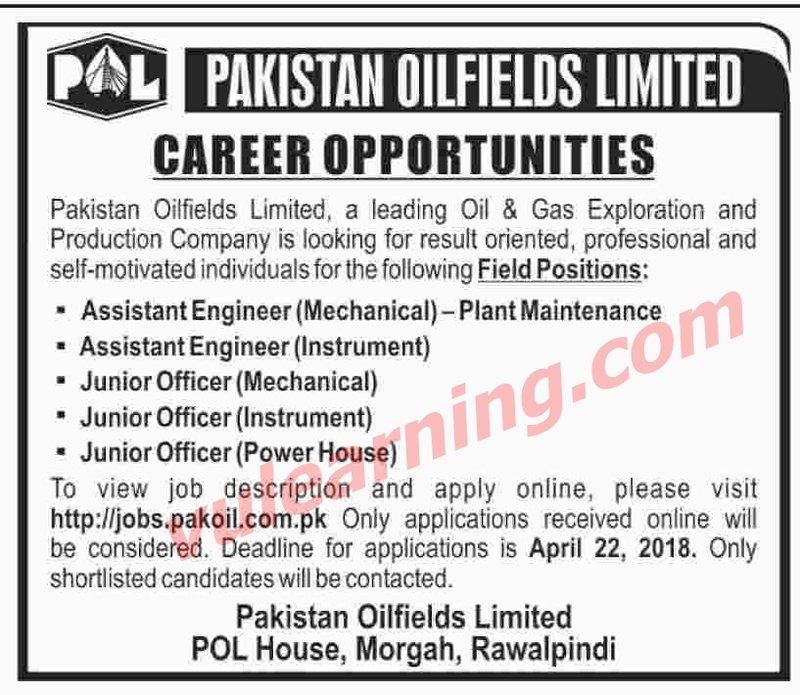 Pakistan Oilfields Limited need services of Mechanical Engineers.Further details may be seen in link. 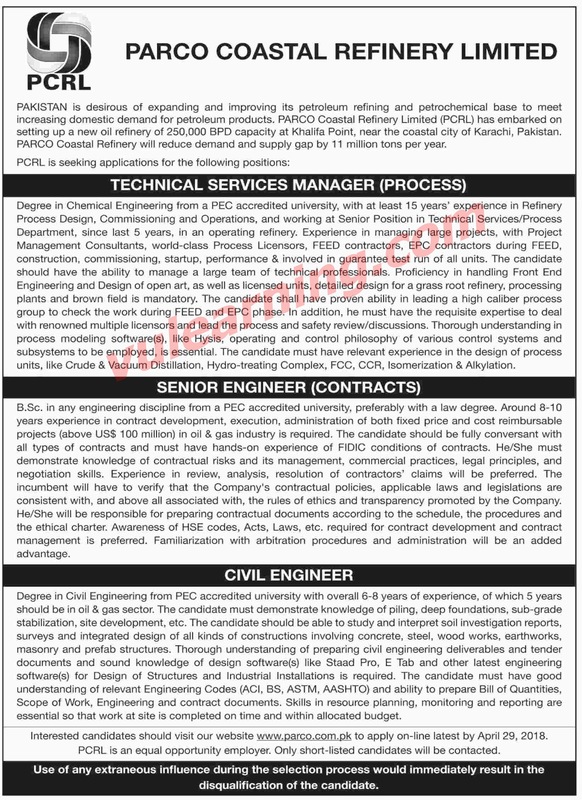 Parco Coastal Refinery Limited need services of civil Engineers.Further details are given in link. 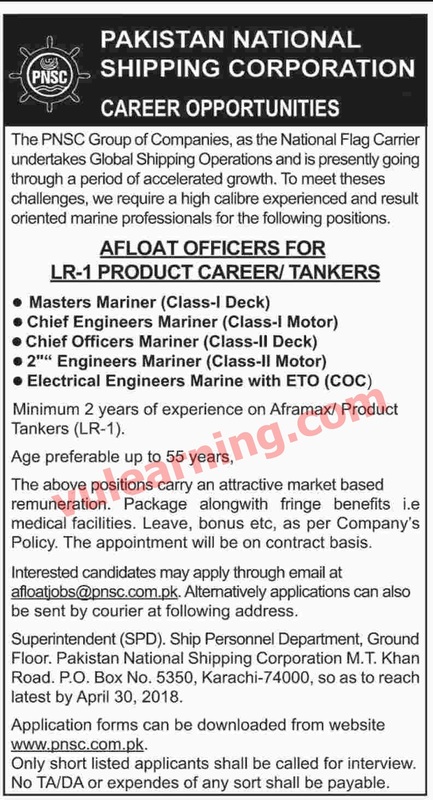 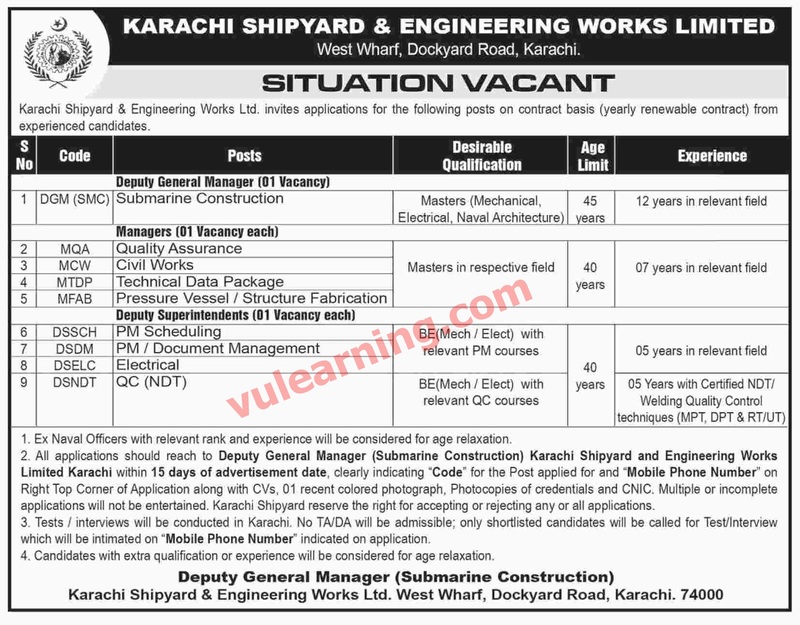 Karachi Shipyard & Engineering Works Ltd need Mechanical Engineers having BSc Degree in relevant field. 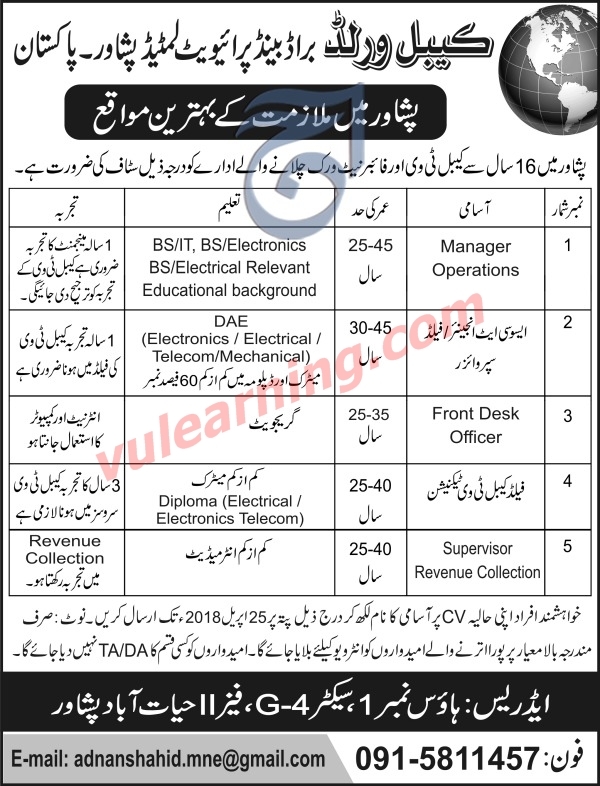 Cable World Broadband Private Limited Peshawar need Electrical Engineers for post of Manager Operations.Further details are given in link. 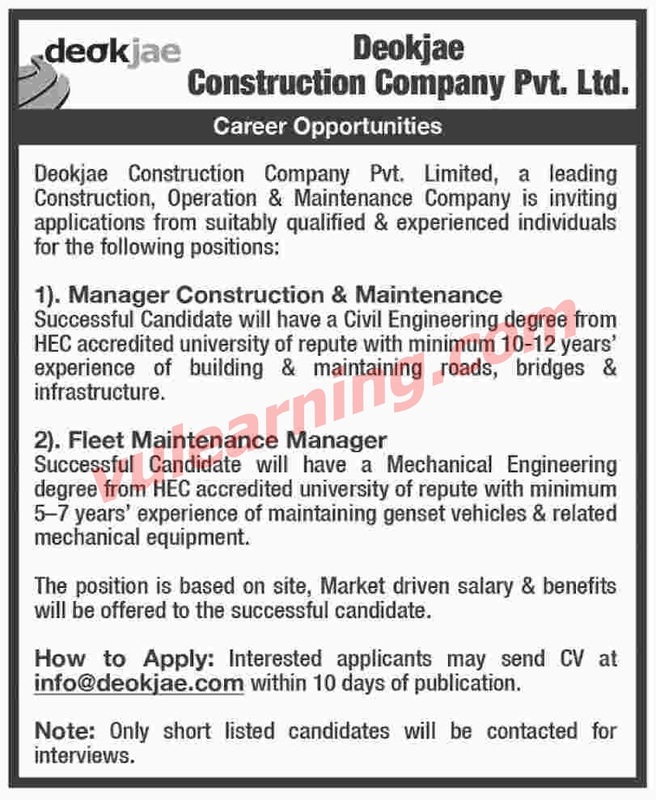 Daokjae Construction Company Pvt. 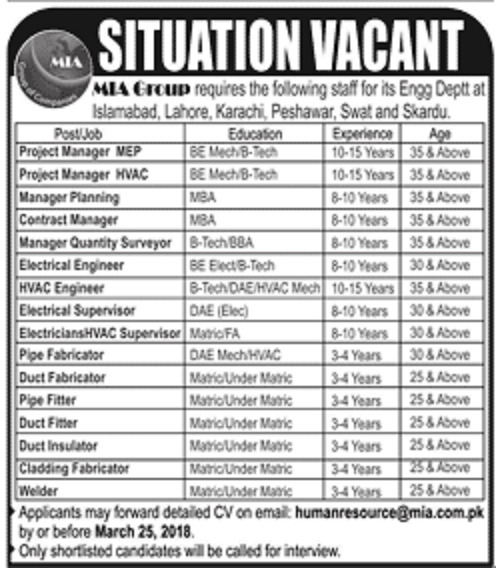 Ltd need B.Sc Civil/Mechanical Engineers. 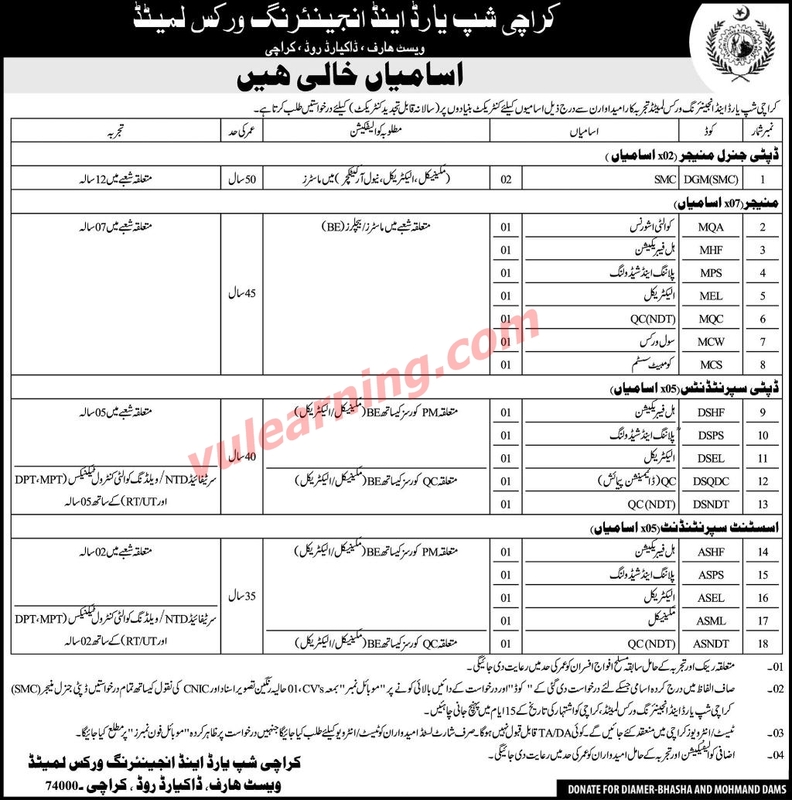 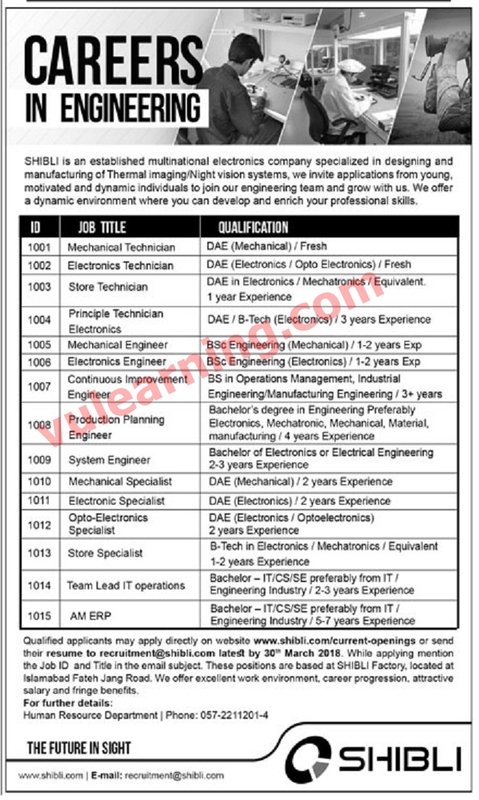 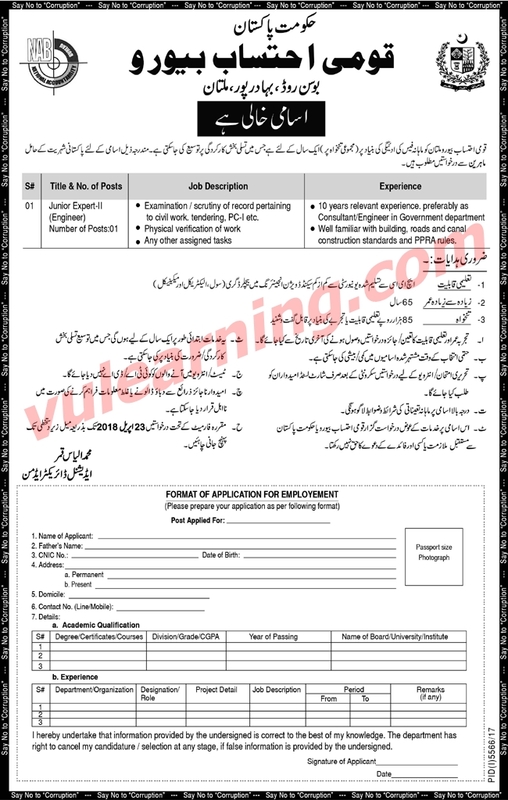 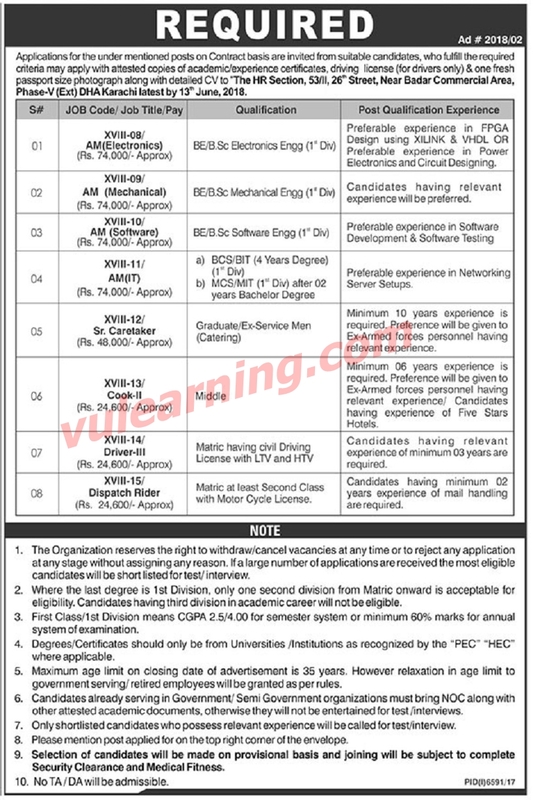 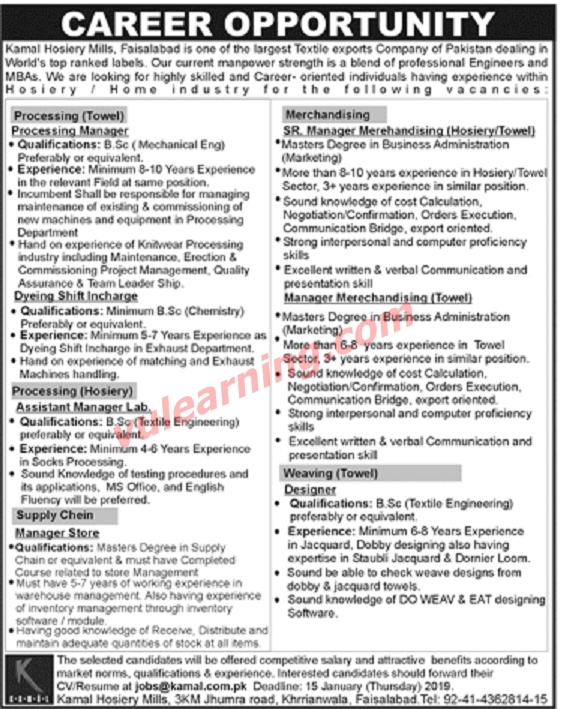 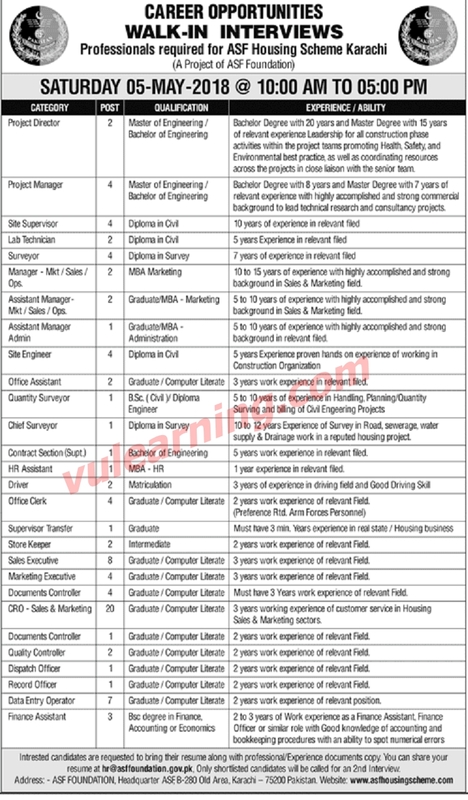 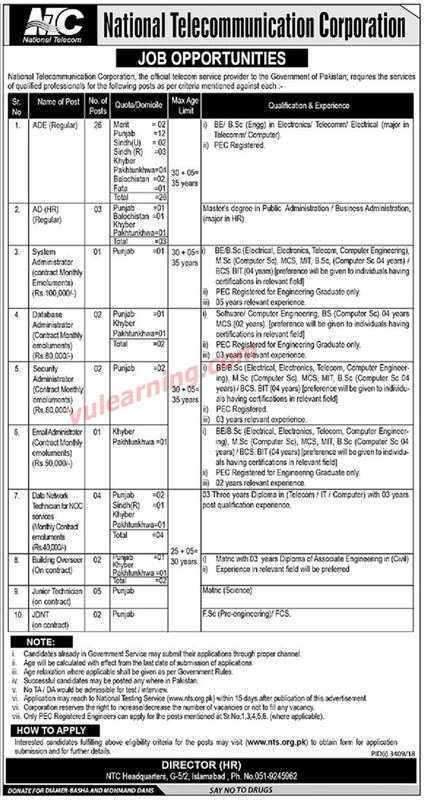 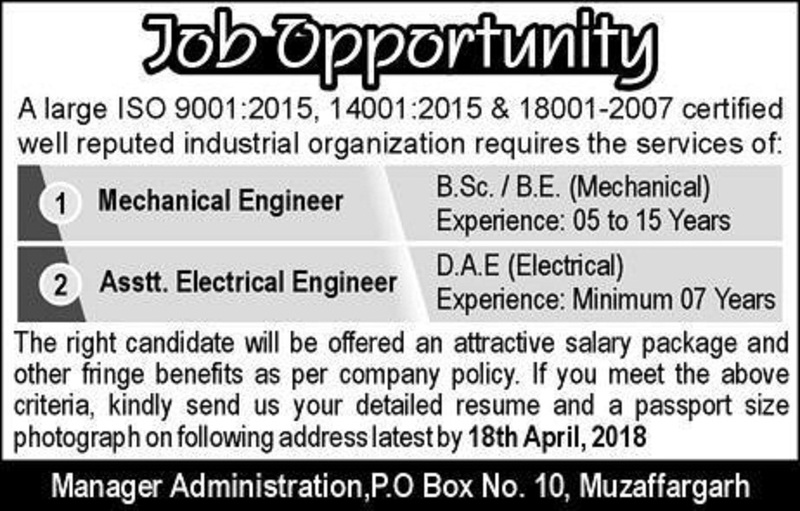 PO Box 10 Muzaffargarh jobs for Mechanical Engineers.Further details are included in link. 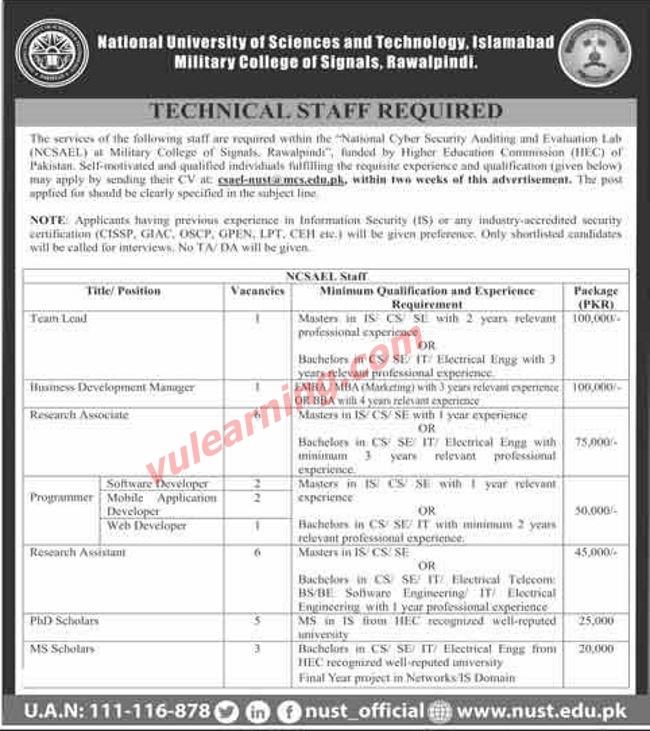 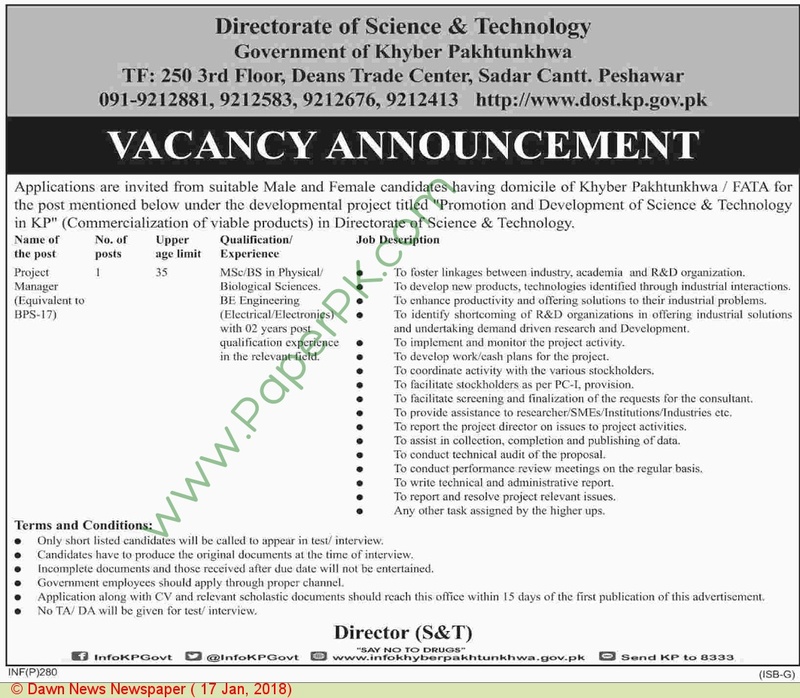 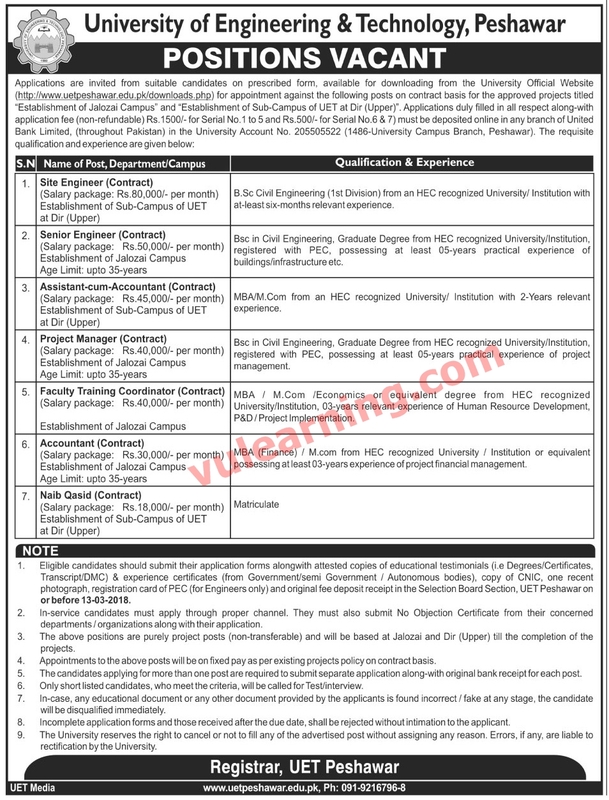 The University of Azad Jammu & Kashmir Muaffarabad need B.Sc Electrical Engineer for post of Lab Engineer .More details are given in link. 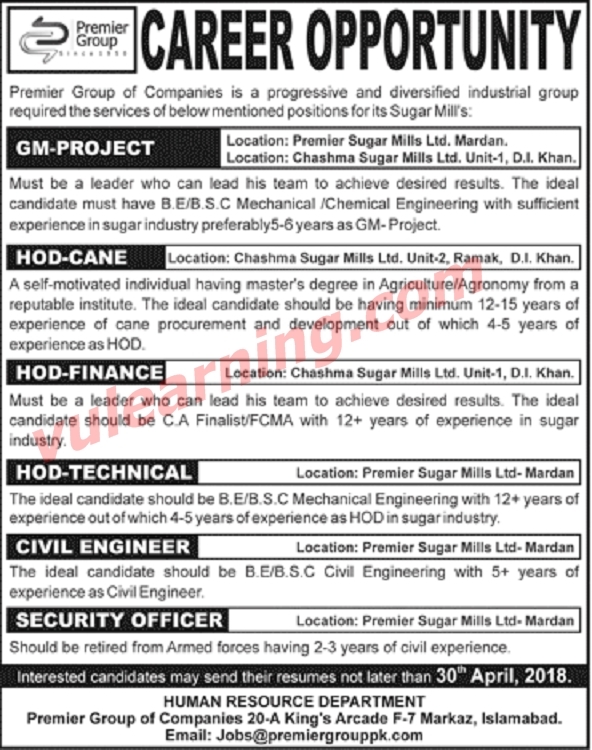 Premier Group of Companies /Sugar Mills need services of Civil/Mechanical Engineer having B.Sc degree in relevant field.Further info is given in link. 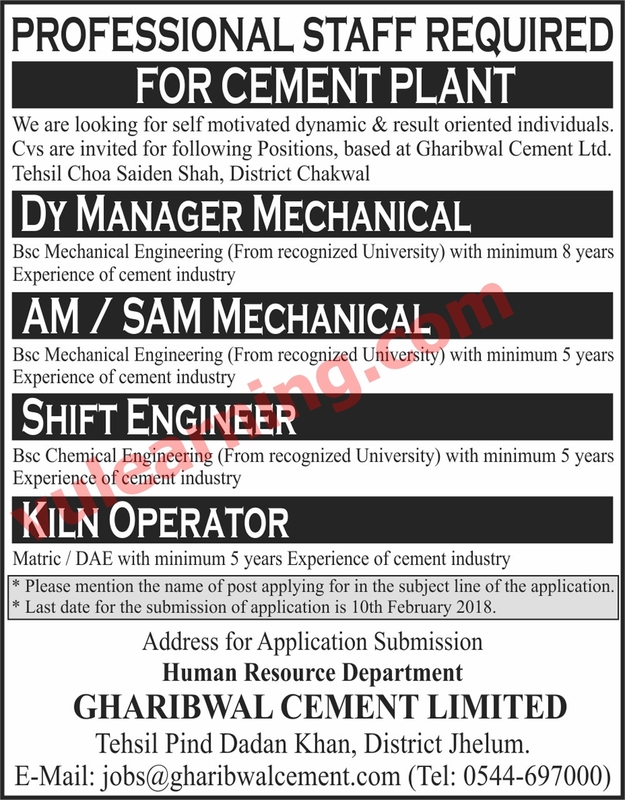 Bestway Cement Limited requires Mechanical Engineers for its sites in Hattar, Farooqia, Chakwal & Kallar Kahar . 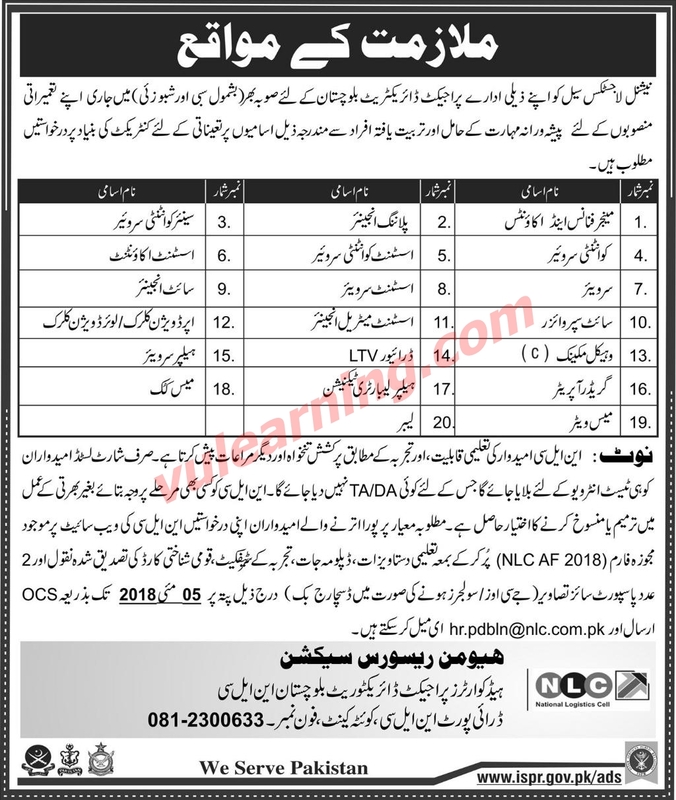 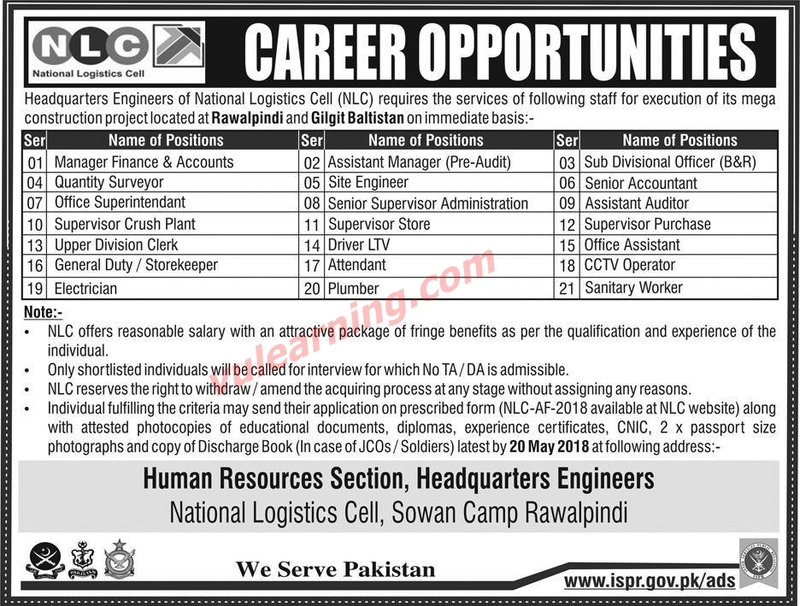 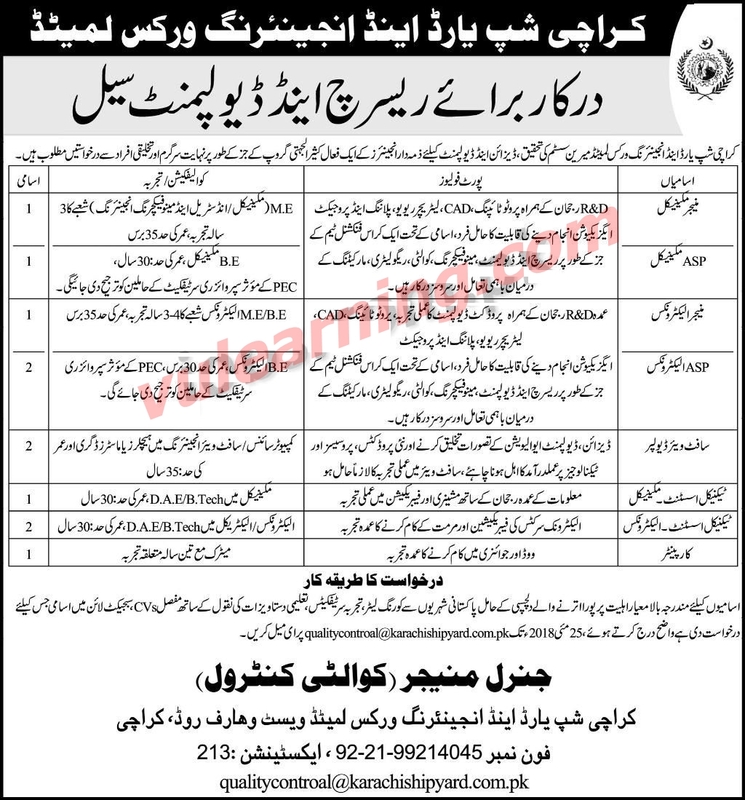 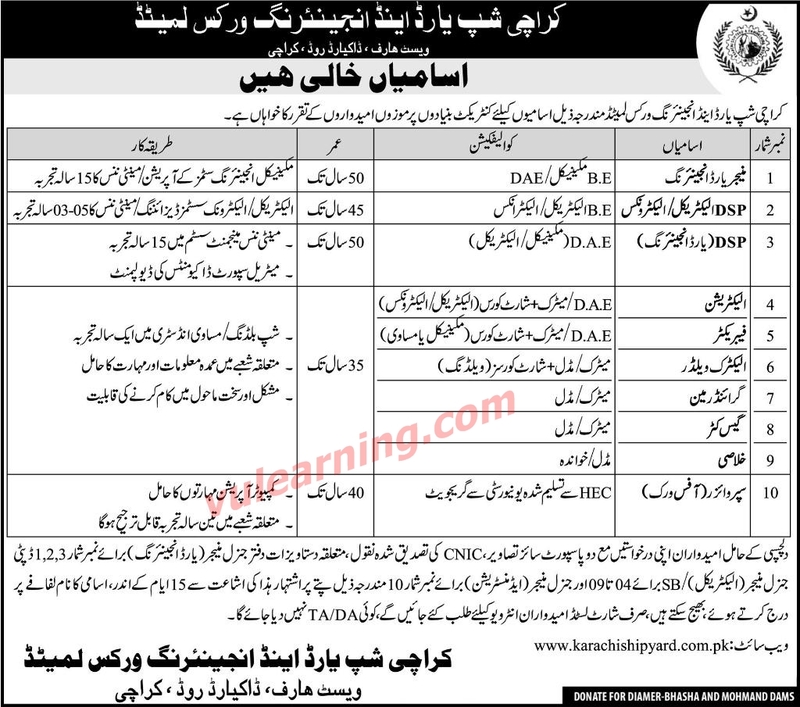 National Logistics Cell (NLC) need services of Site Engineers for its Project Directorate Balochistan.Further details are given in link. 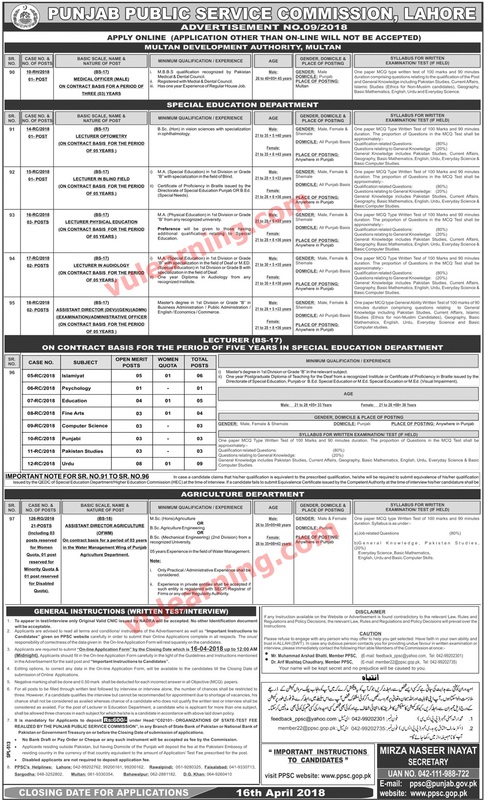 National Institute of Cardiovascular Diseases NICVD Karachi need B.Sc Electrical/Mechanical Engineers for post of Engineer Electrical/Engineer operation & maintenance;. 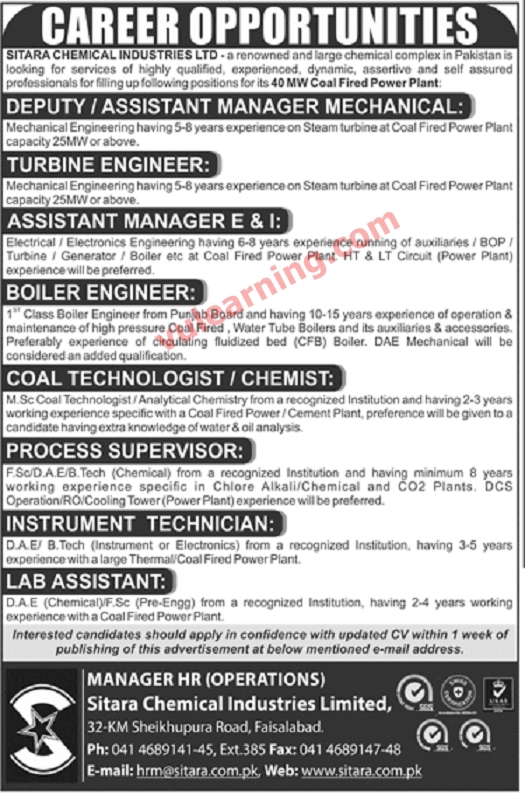 DESCON Engineering Limited Lahore need Civil/Electrical /Mechanical Engineers .Further details are given in link. 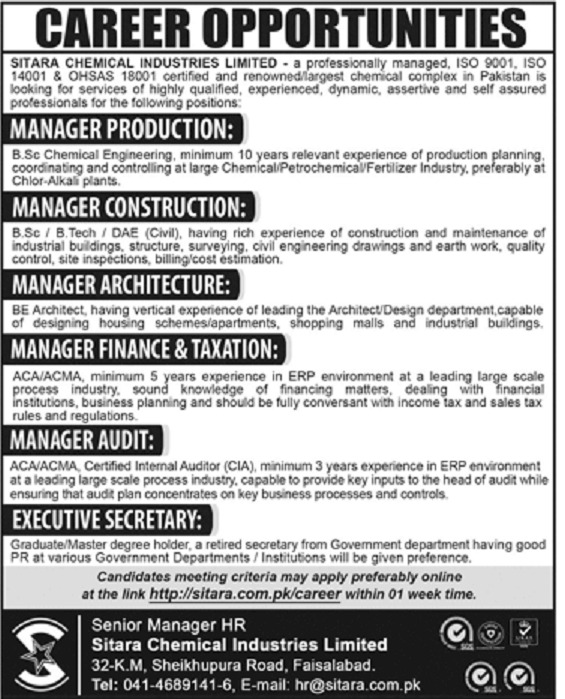 Unilever Pakistan need Engineering Graduates for post of Assistant Managers.Further details are given in link. 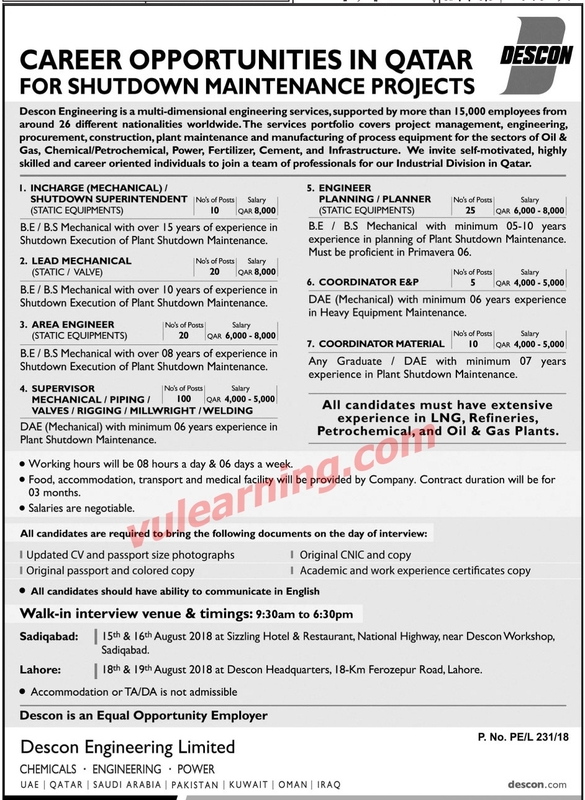 UAE Oil & Gas Field (Walk-in Interviews) for Electrical /Mechanical Engineers .Further details are included in link. 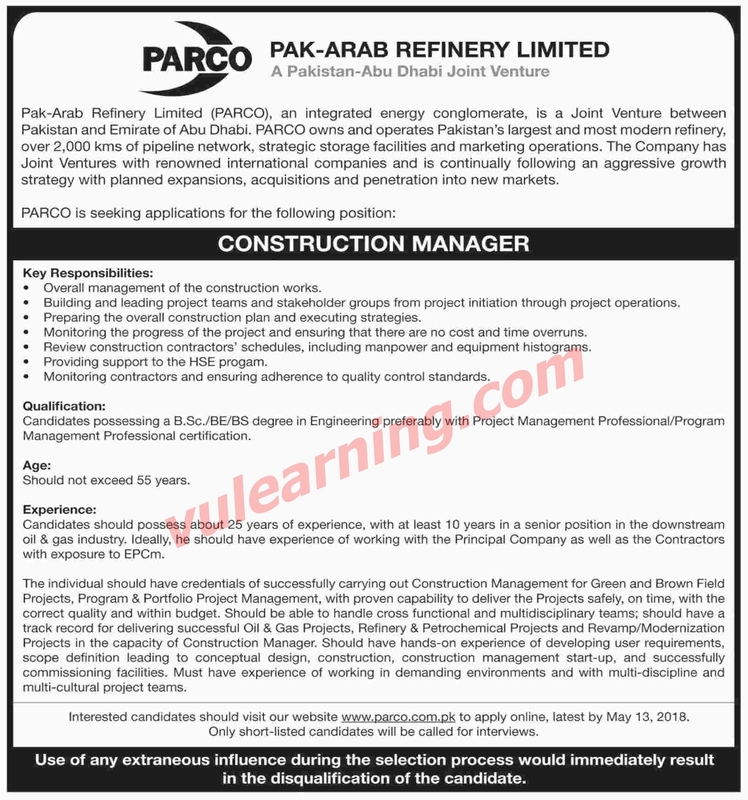 Pak-Arab Refinery Limited PARCO need services of Construction Manager having B.Sc degree in Engineering.Further details are given in link. 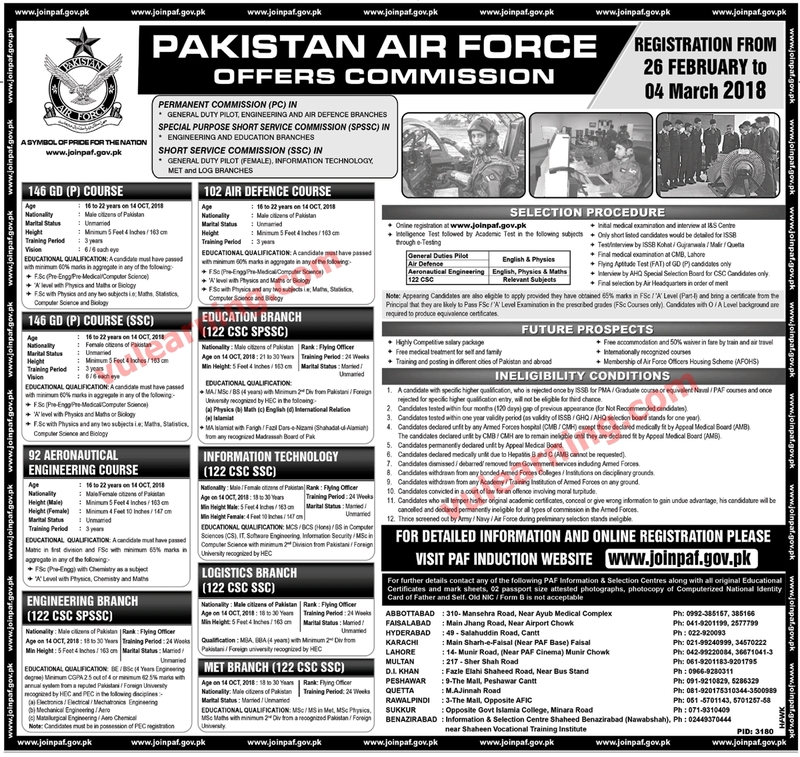 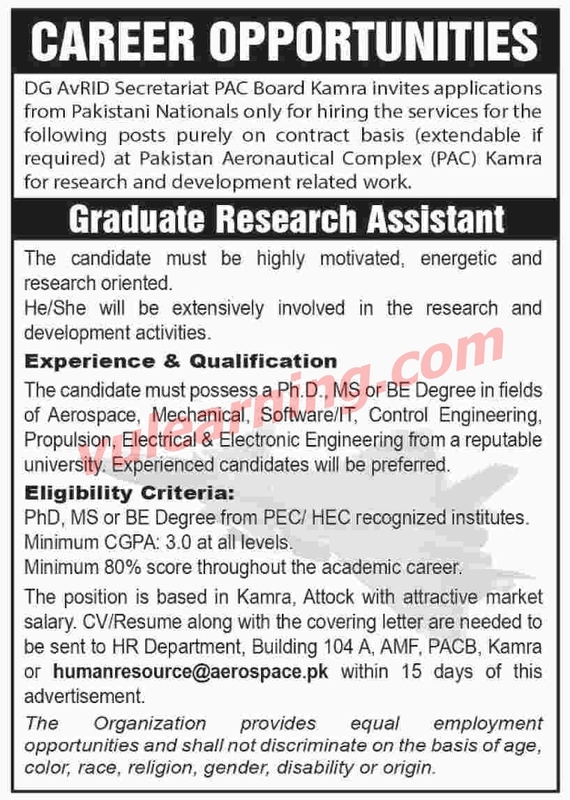 Pakistan Aeronautical Complex PAC Kamra need services of PEC registered Mechanical/Electrical Engineers .Further details are included in link. 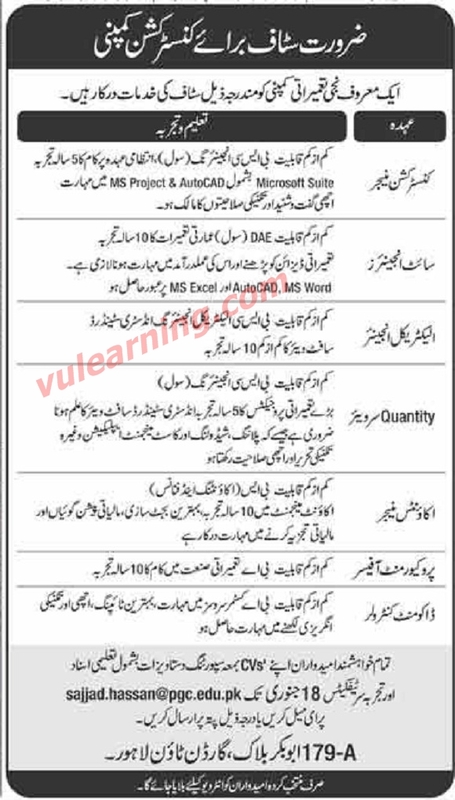 Reputed Consulting Engineering Company need services of Civil/Electrical/Mechanical Engineers for its Projects in Karachi.Further details may seen in link. 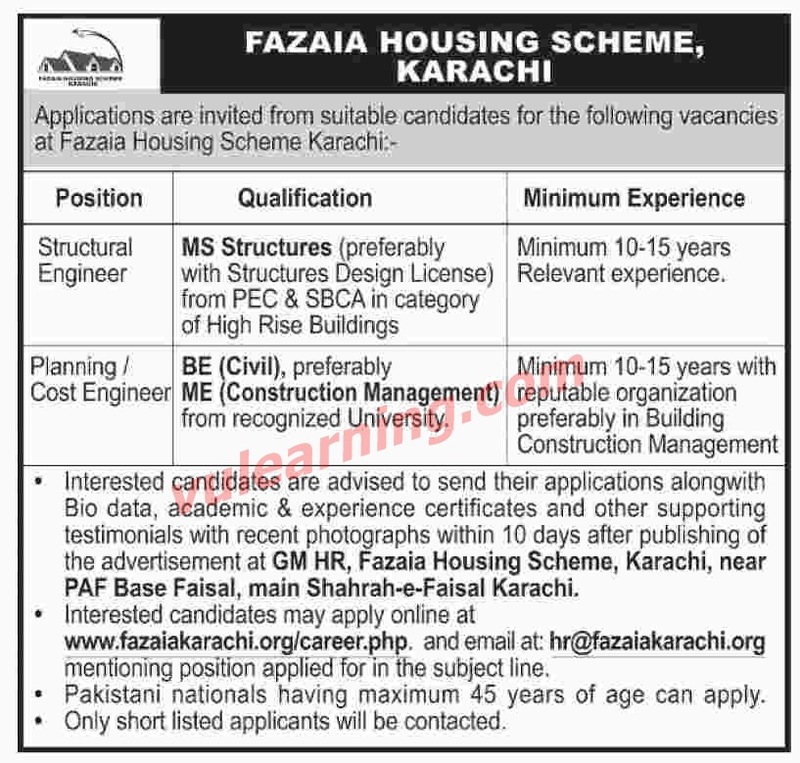 ASF Housing Scheme Karachi need BSc Civil Engineers.Further details may seen in link. 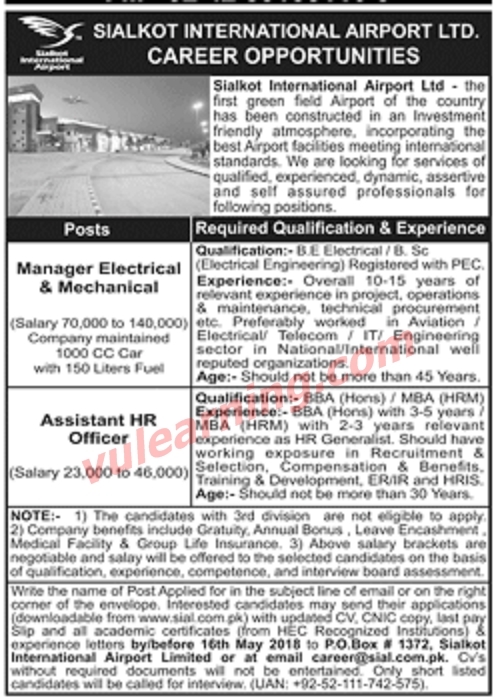 Sialkot International Airport Limited need services of Electrical Engineers . 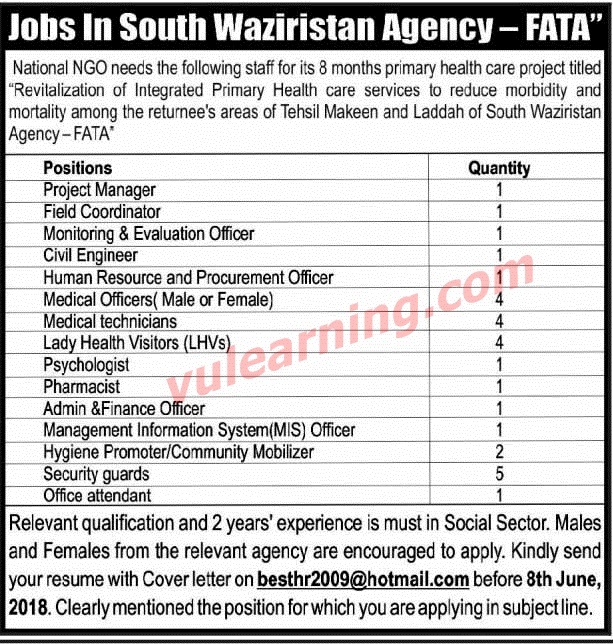 Further details are included in link. 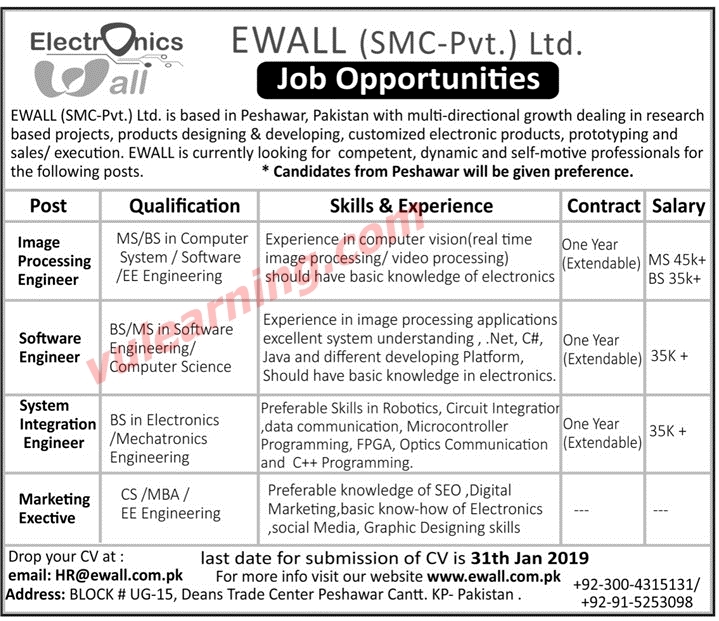 Special Communication Organization Rawalpindi need B.Sc Electrical Engineer .For more details visit the link given here. 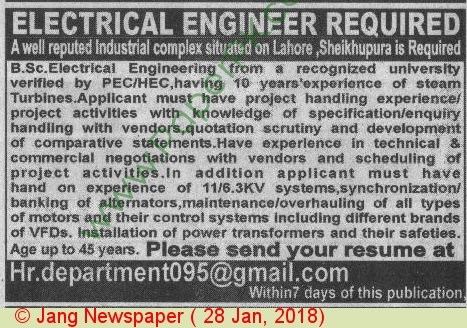 Reputable Engineering Company need B.Sc Electrical/Mechanical Engineers .Further details may seen in link. 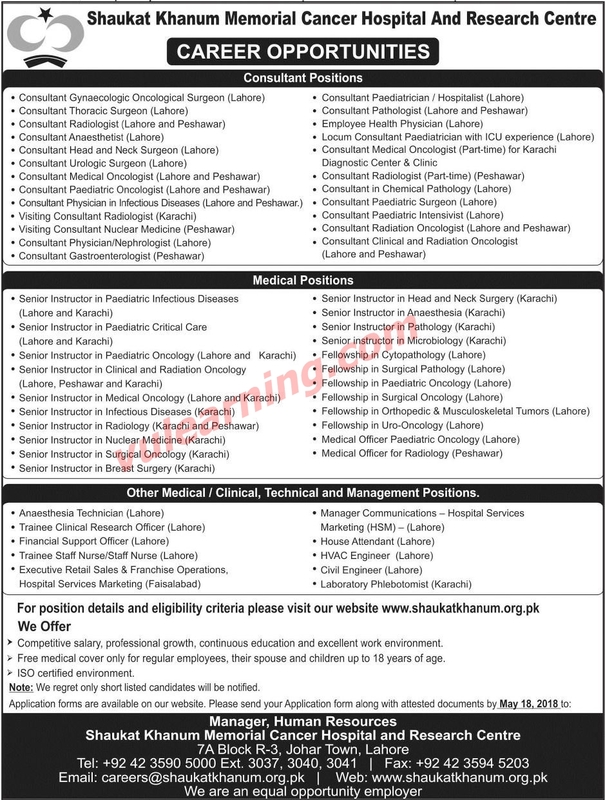 Shaukat Khanum Memorial Cancer Hospital & Research Centre need Civil /Mechanical Engineers having B.Sc in relevant field. 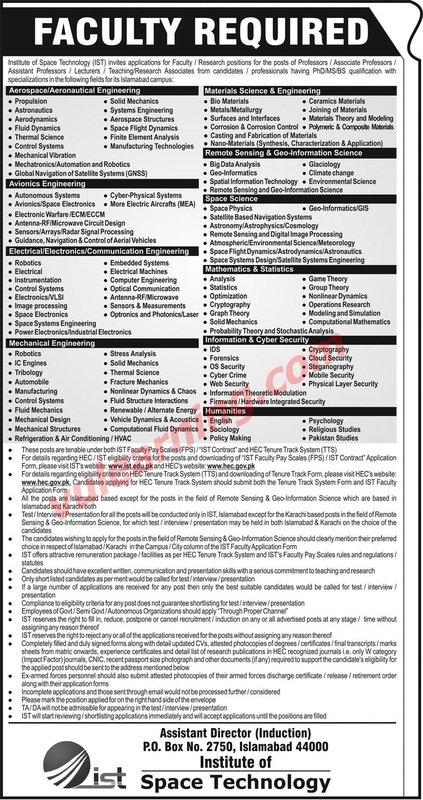 Air University Islamabad & Multan need Mechanical /Electrical Engineers .Further details are included in link. 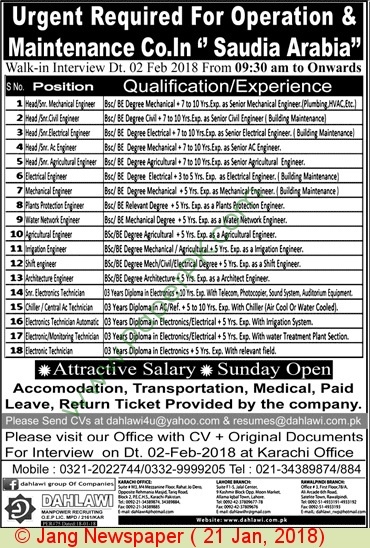 Karachi Shipyard & Engineering Works need services of Mechanical Engineers.More info is given in link. 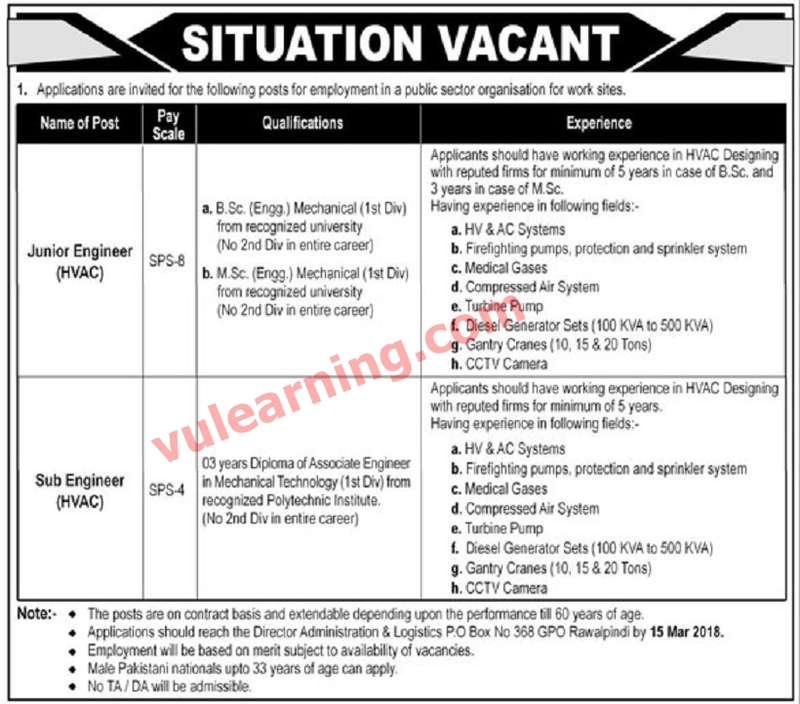 OPUS Inspection Pvt Ltd NEED B.Sc Mechanical/Electrical Engineers for post of Lane Chief.Further details are given in link. 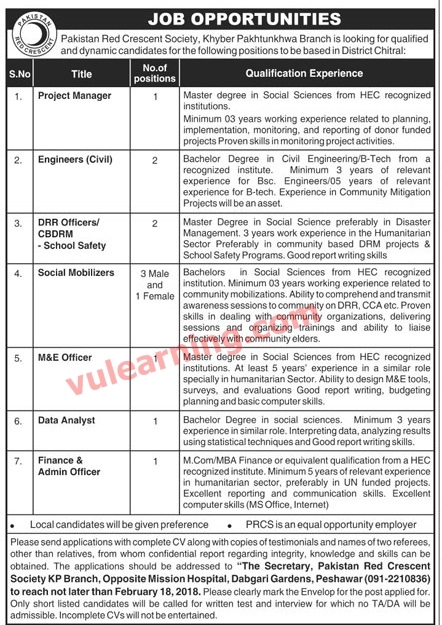 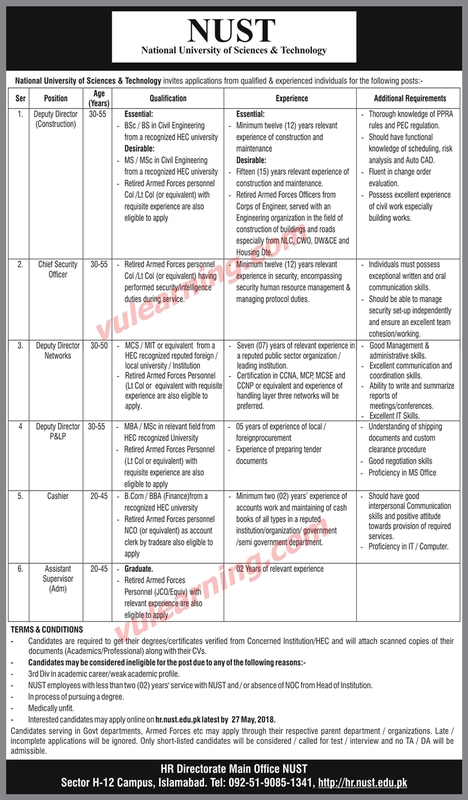 Leading Organization Jobs in Gwadar need B.Sc Civil /Electrical /Mechanical Engineers .More details are given in link. 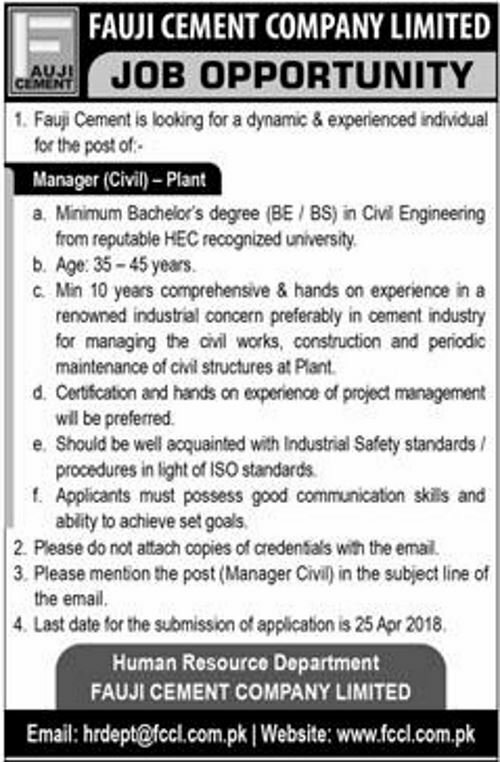 ICI Pakistan Limited Khewara Soda Ash Plant need B.Sc Electrical Engineers for post of Assistt Manger Electrical.Further details are given in link. 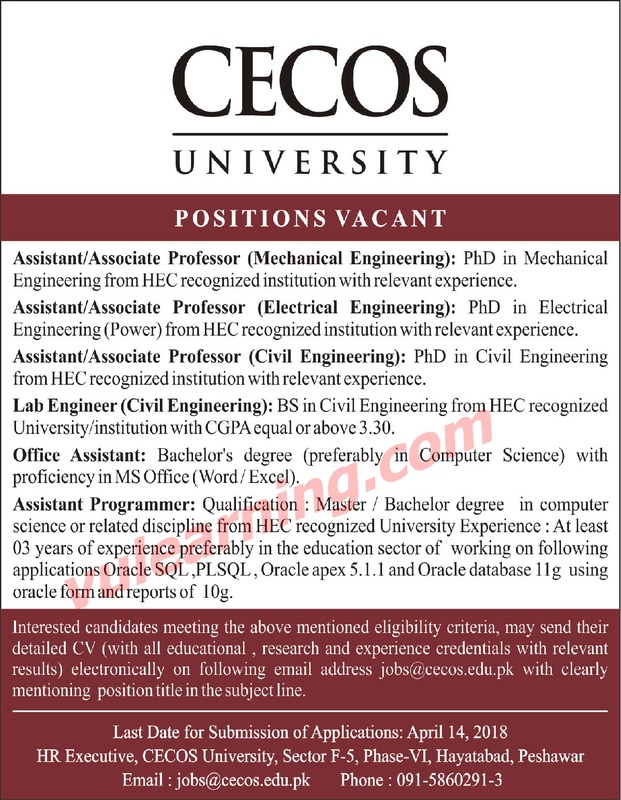 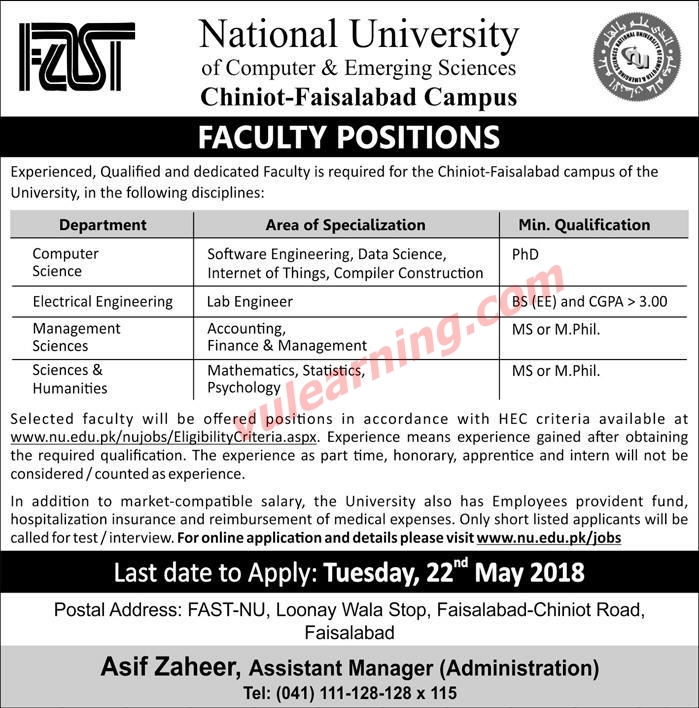 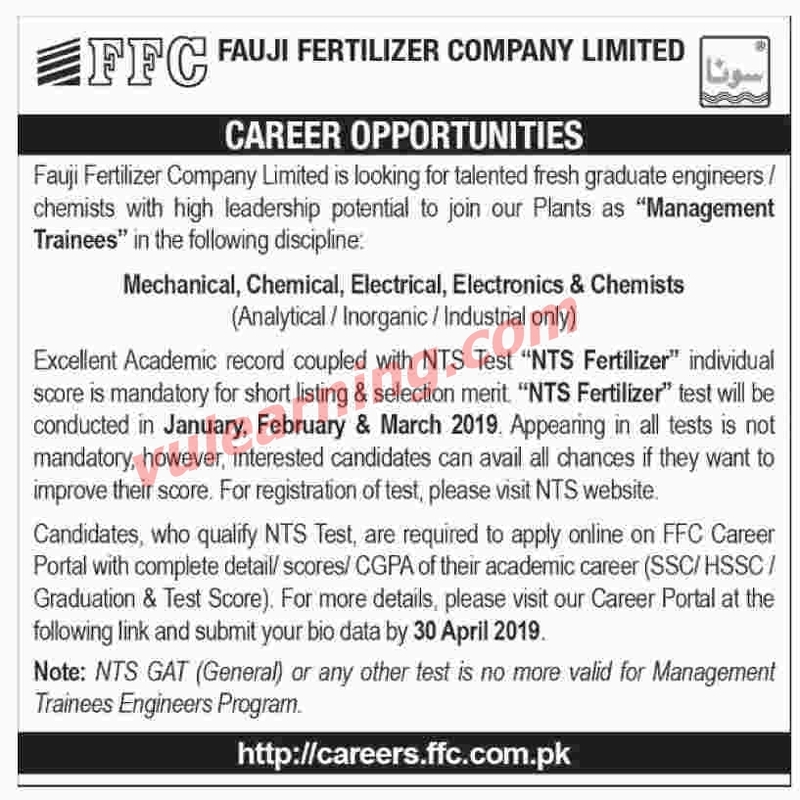 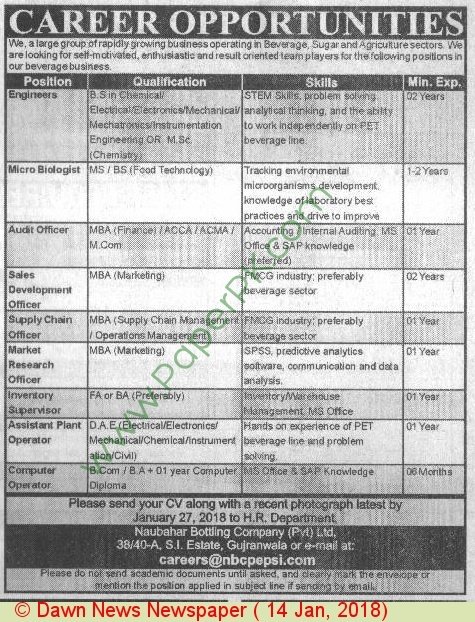 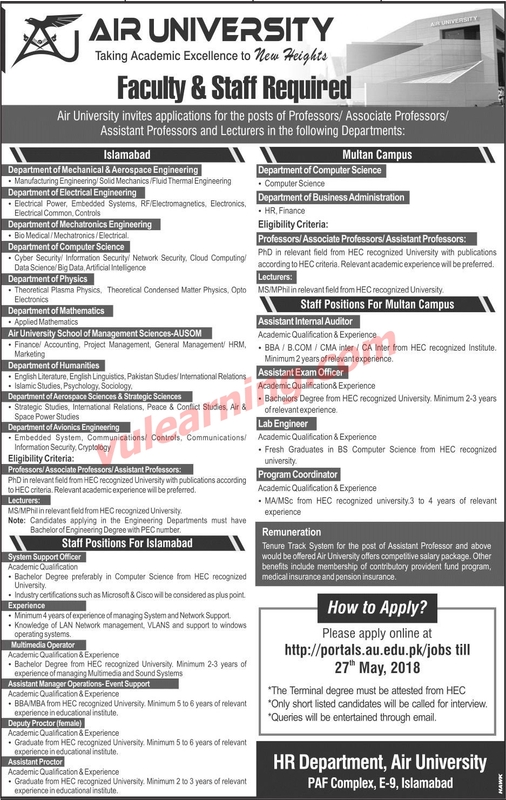 NUCES FAST need B.Sc Electrical Engineers for Chiniot - Faisalabad Campus.further details are given in link. 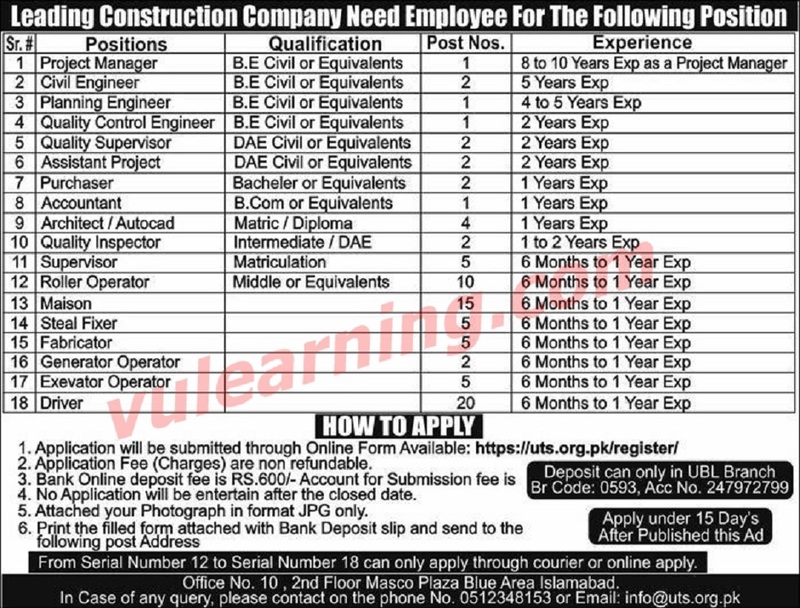 Famous Construction Company need services of civil Engineers in Multan & Lahore.Details are included in link. 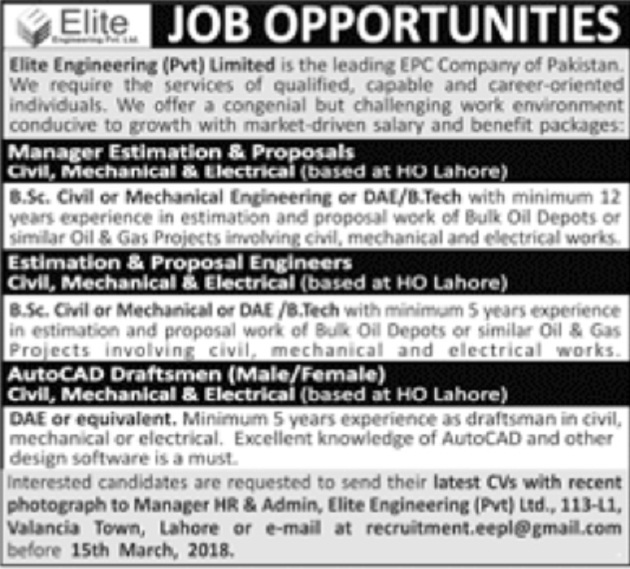 Unique Group of Companies need services of Mechanical Engineers .Further details are given in link. 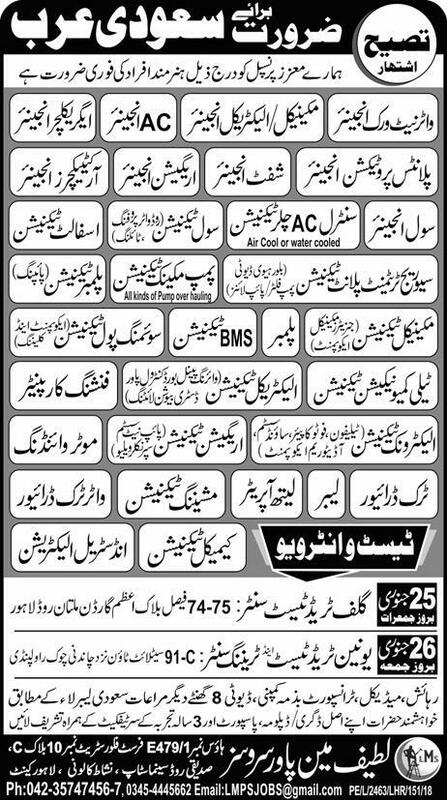 SZABIST need services of Electrical/Mechanical Engineers in Karachi , Hyderabad & Larkana .Further details are included in link. 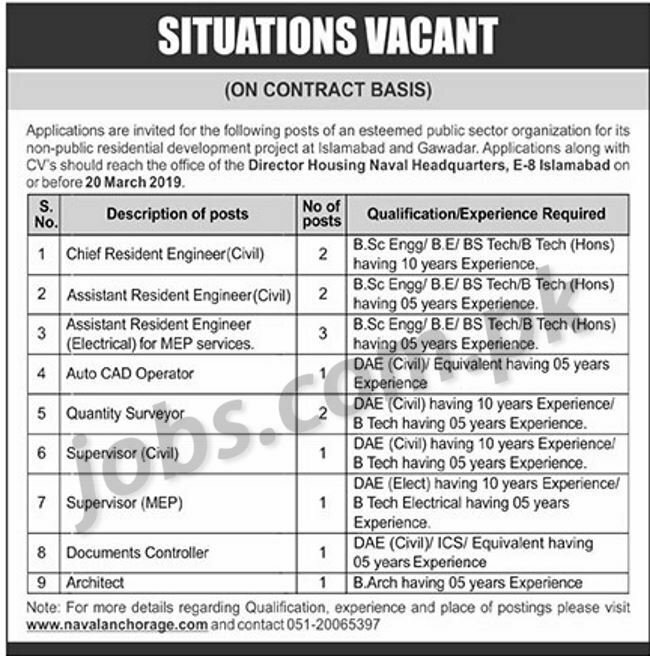 NUST Islamabad need B.Sc Civil Engineers for the post of Dy Director Construction.Further details are included in link. 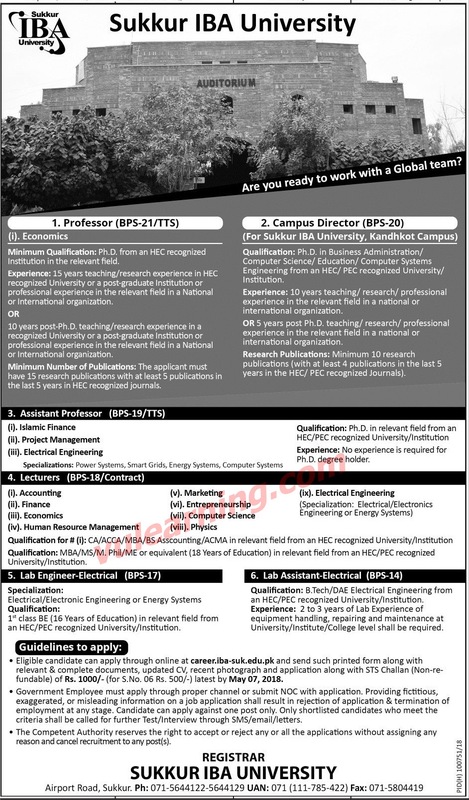 Gandhara Institute of Science & Technology Peshawar need Teaching staff having BSc degree in Electrical / Civil Engineering. 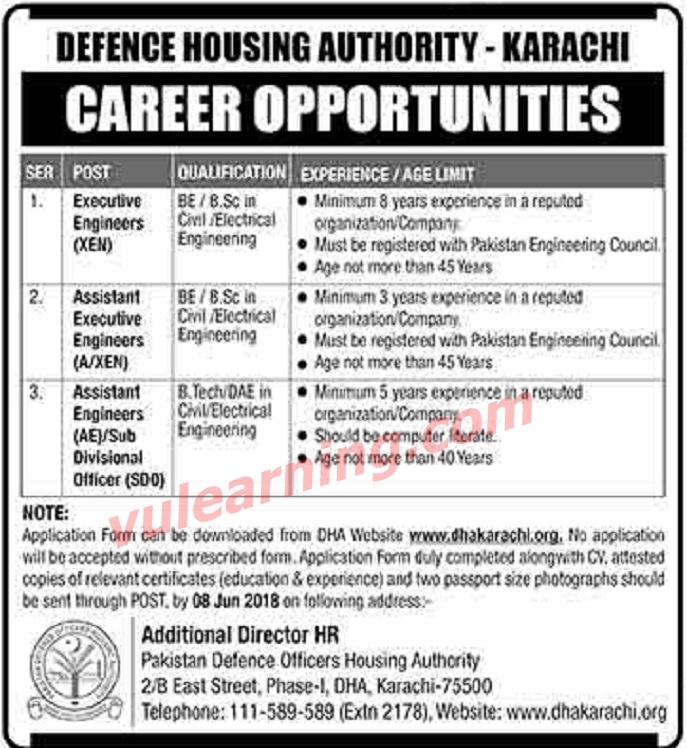 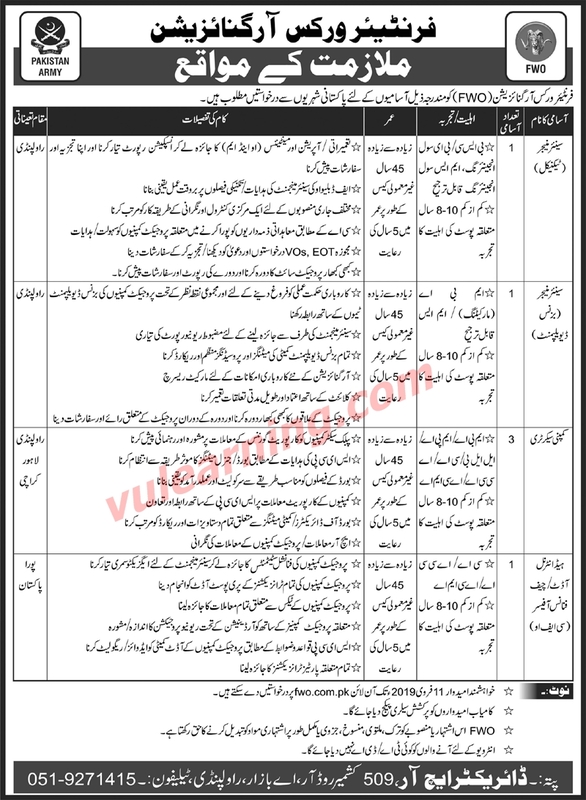 Defence Housing Authority DHA Karachi need BSC Civil/Electrical Engineers for post of XEN, A/XEN, and AE / SDO. 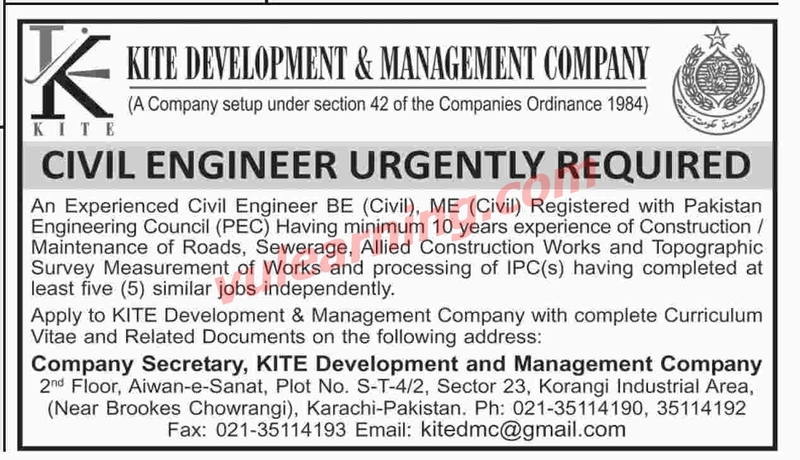 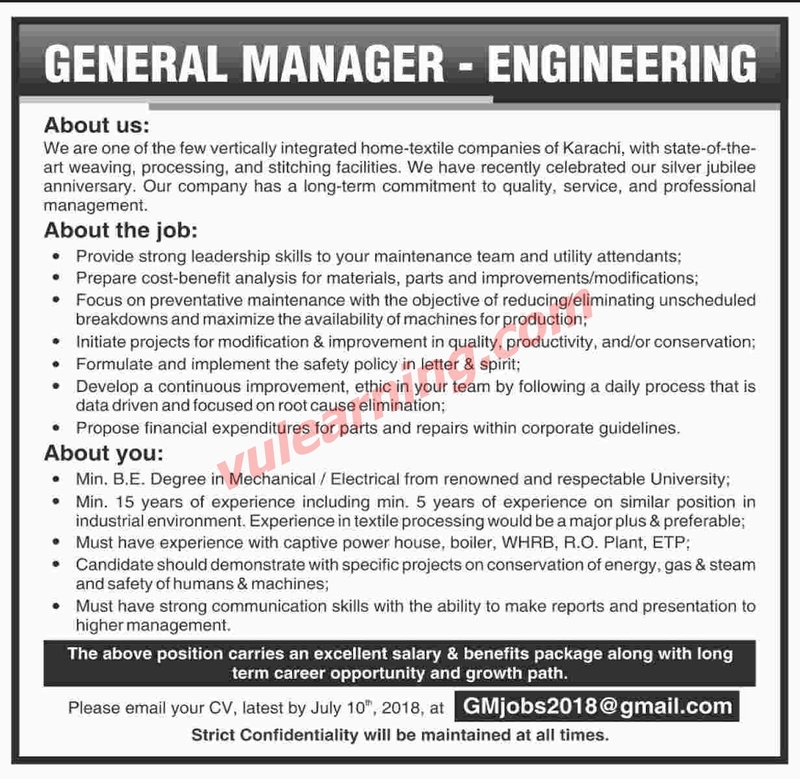 Kite Development & Management Company Karachi need BSc Civil Engineers. 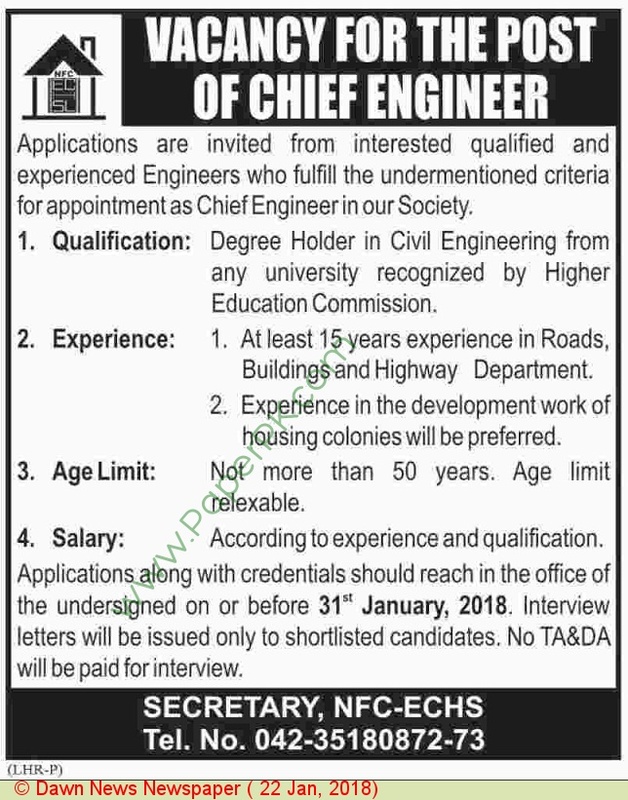 National NGO South Waziristan Agency - FATA need BSc Civil Engineer.Further details are given in link. 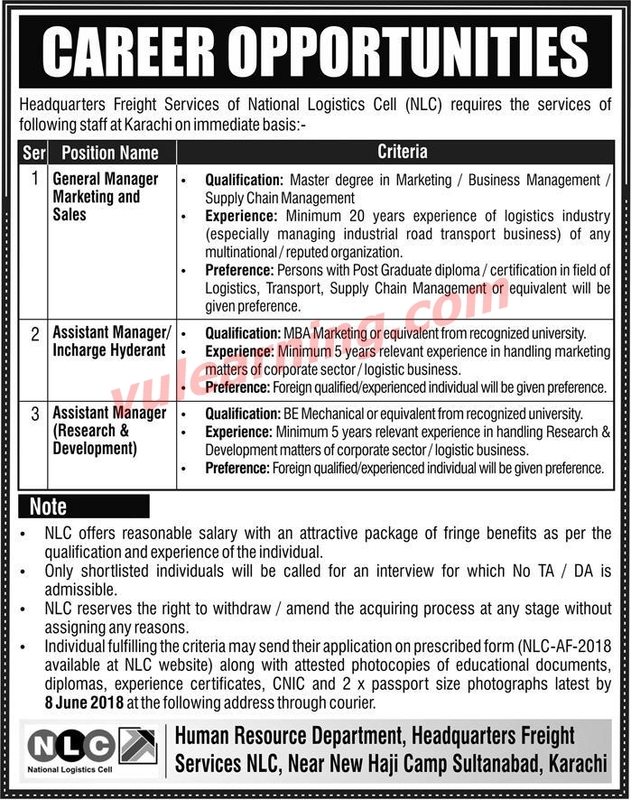 Headquarters Fright Services of National Logistics Cell (NLC) need services of Mechanical Engineer for post of Assistant Manger. 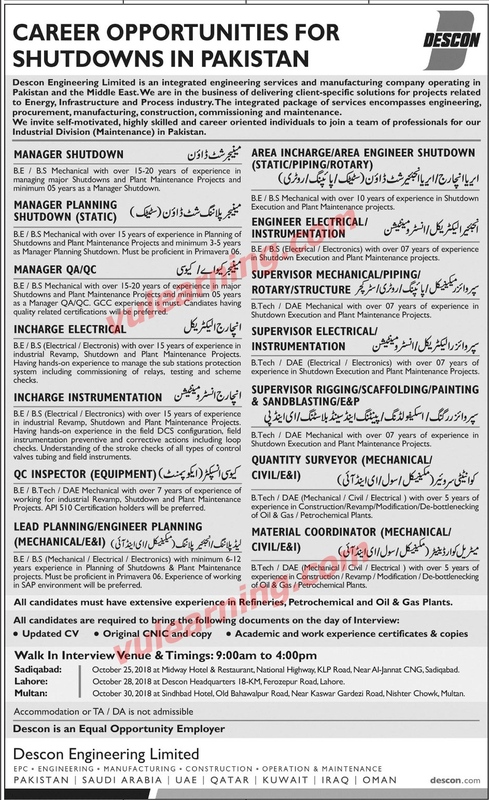 SMEC Oil & Gas Pvt need services of Civil/Electrical/Mechanical Engineers in Islamabad. 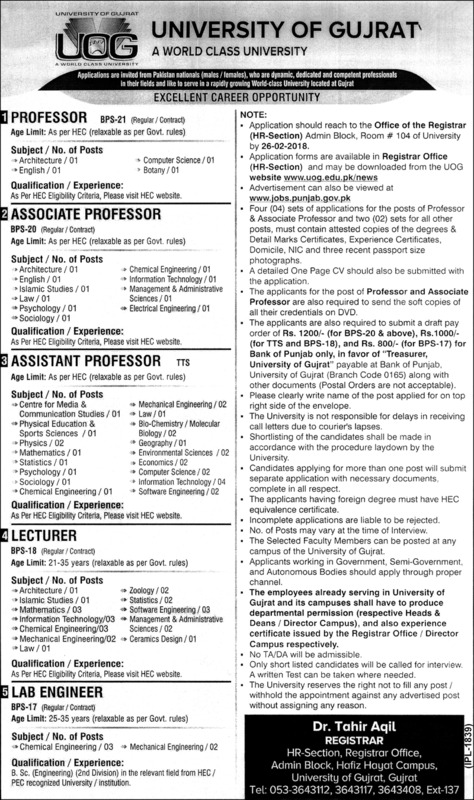 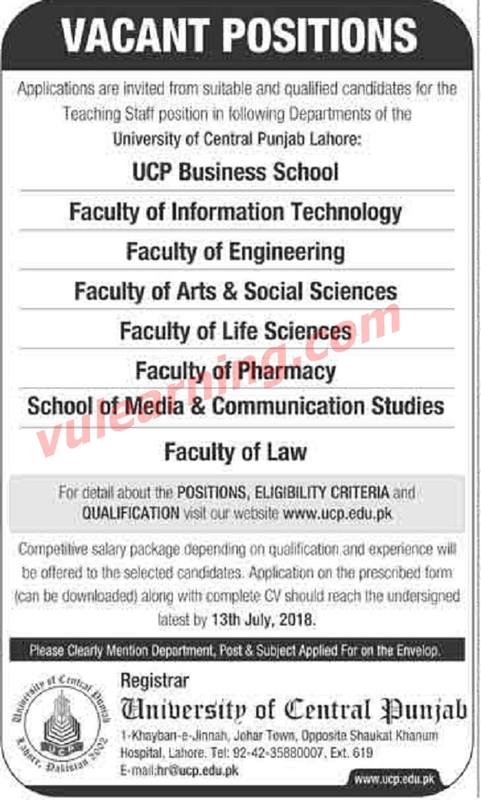 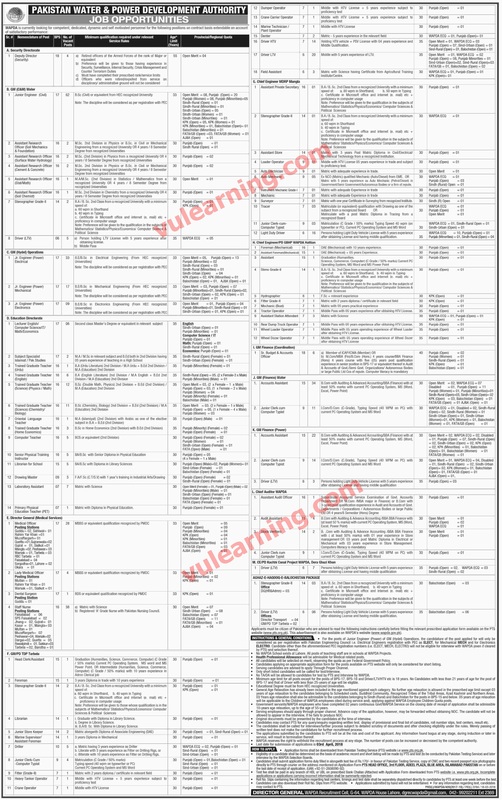 University of Central Punjab UCP Teaching Faculty Jobs . 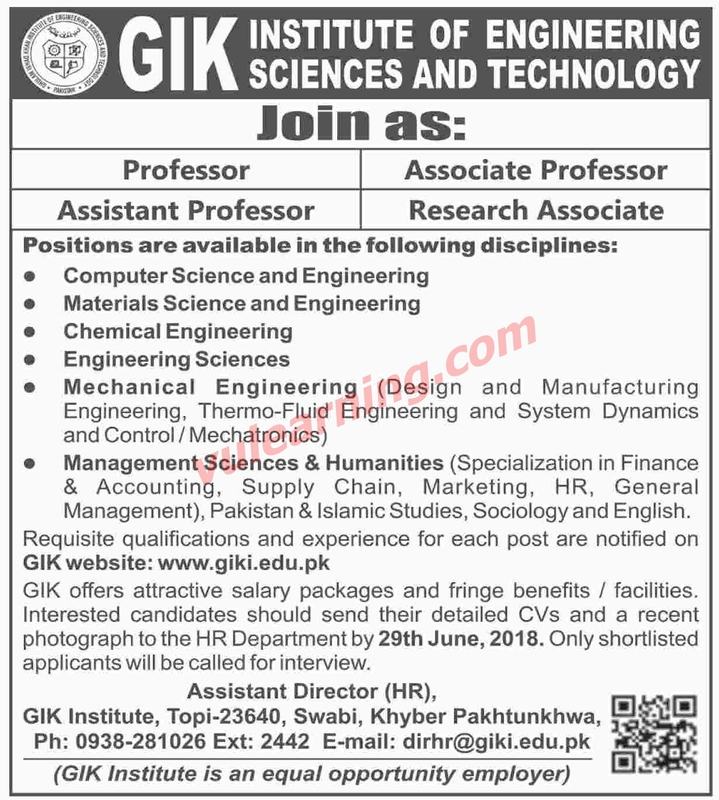 GIK Institute of Engineering Sciences & Technology Topi need Mechanical Engineers . 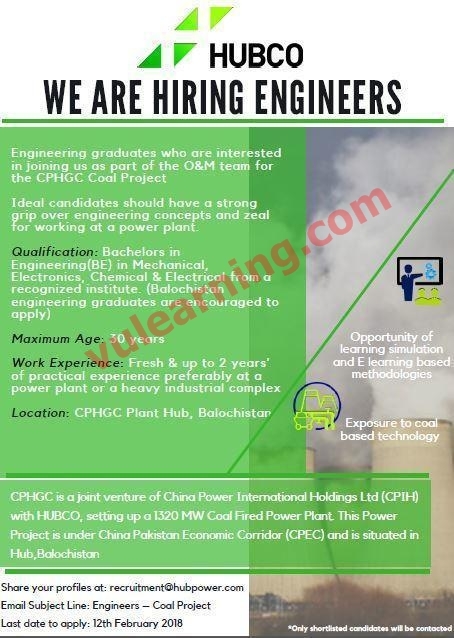 Reputable Engineering Company need services of Electrical Engineers in Islamabad . 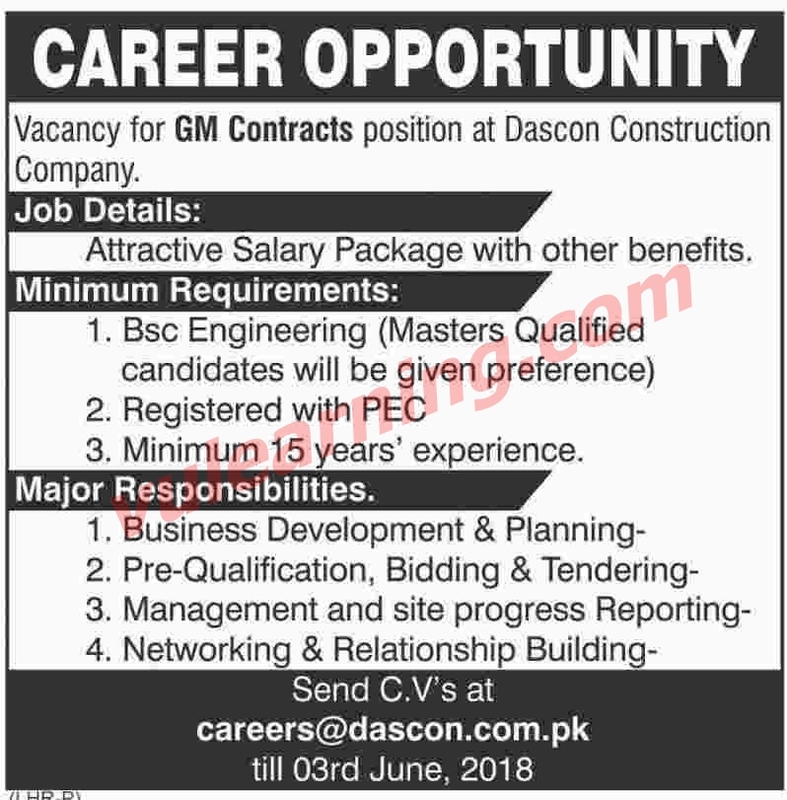 Descon Engineering Limited need BSc Mech/Electrical Engineers for Shutdown in Pakistan . 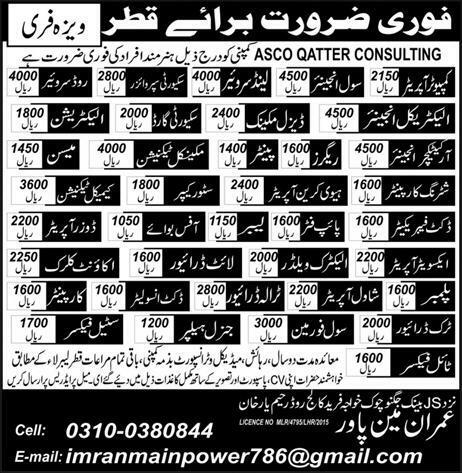 DESCON for Shutdown Maintenance Projects in Qatar need Mechanical Engineers . 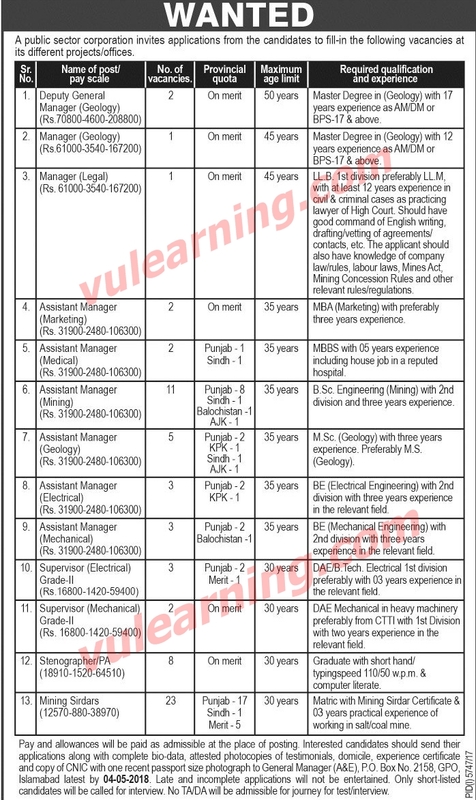 Civil Aviation Authority need services of BSc Civil & Electrical Engineers . 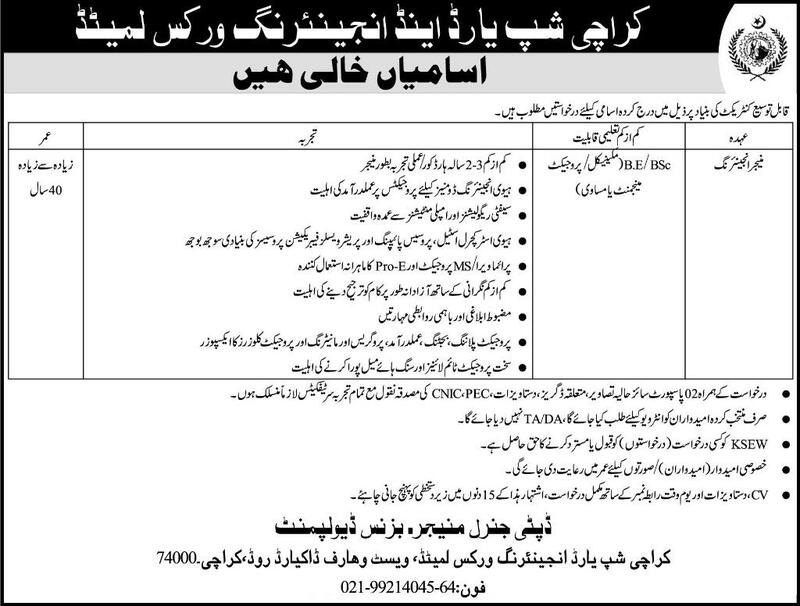 School Education and Literacy Department Sindh need Electrical Engineers. 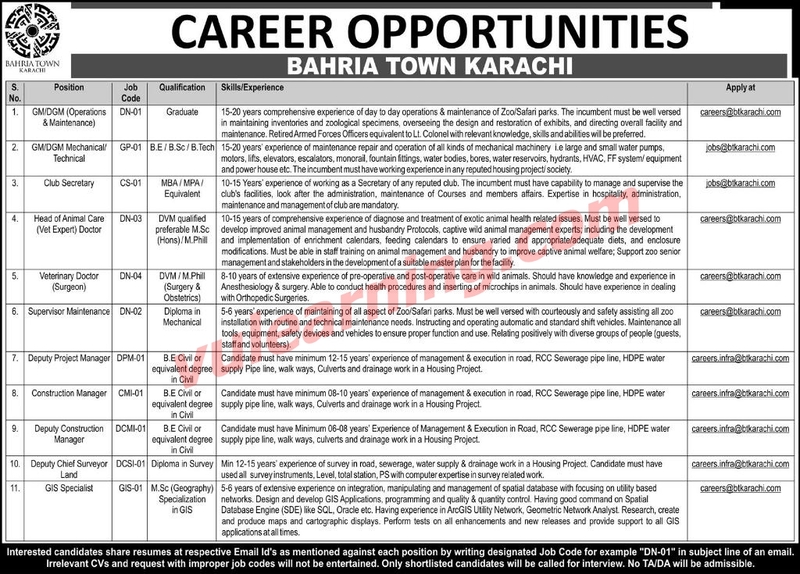 Karachi Shipyard & Engineering Works Limited KSEW need services of BSc Mechanical engineer. 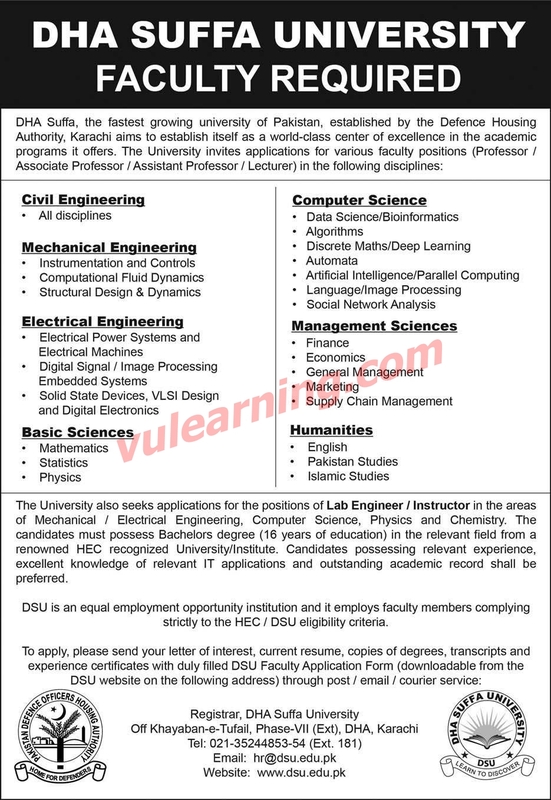 DHA Suffa University Karachi need Teaching Faculty in Civil/Electrical/Mechanical Departments. 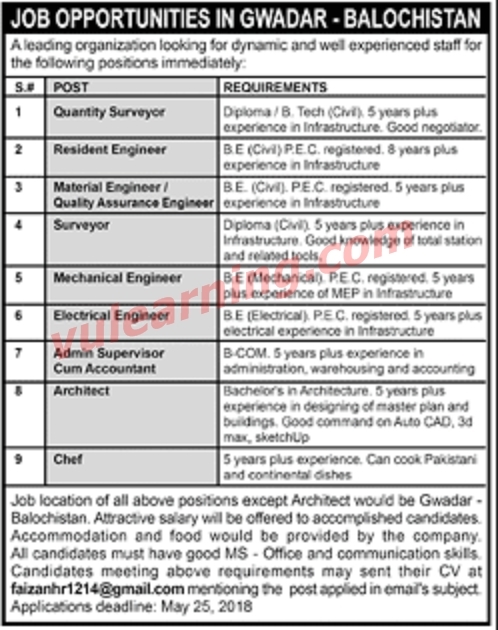 Balochistan Planning & Development Department need services of Civil Engineer. 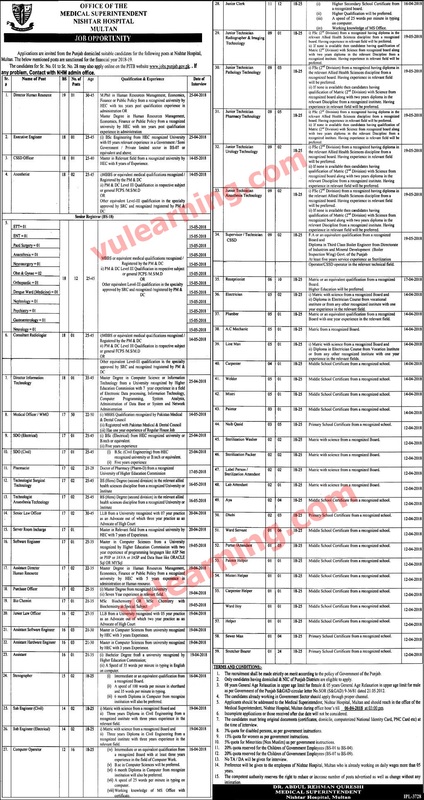 Air University need services of Civil Engineers for post of Assist Dir. 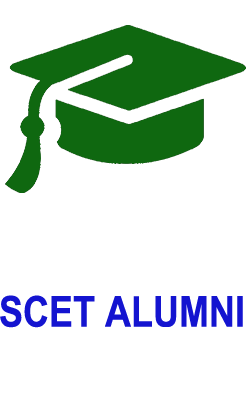 Engineering Services. 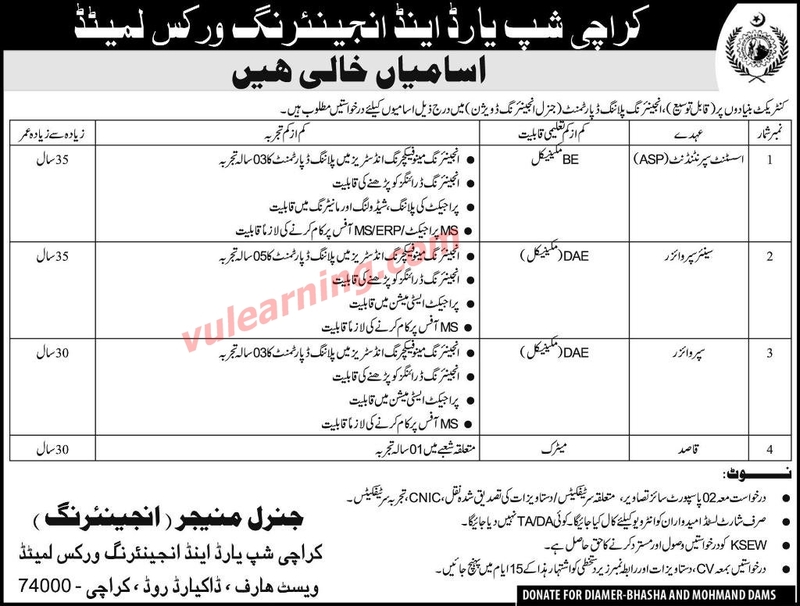 Pakistan navy need services of Mechanical/Electrical Engineers on Short services Commision based. 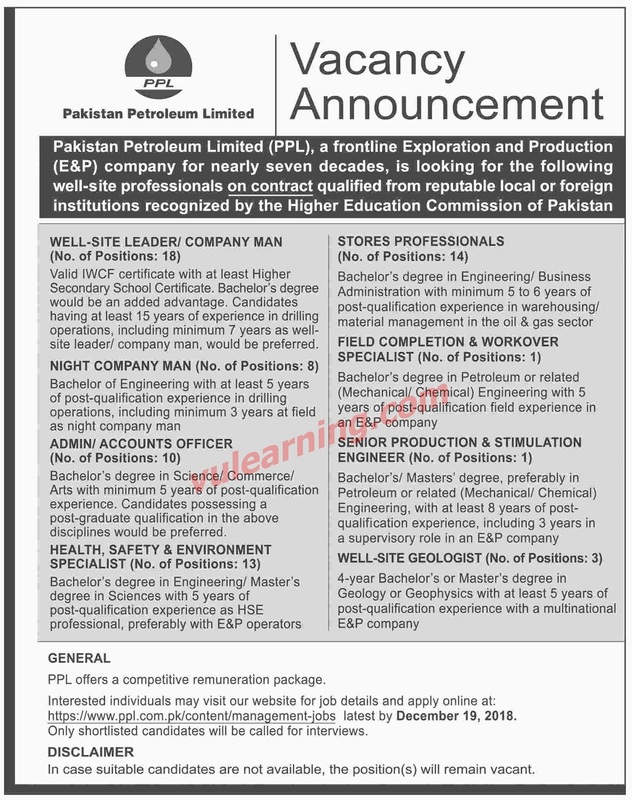 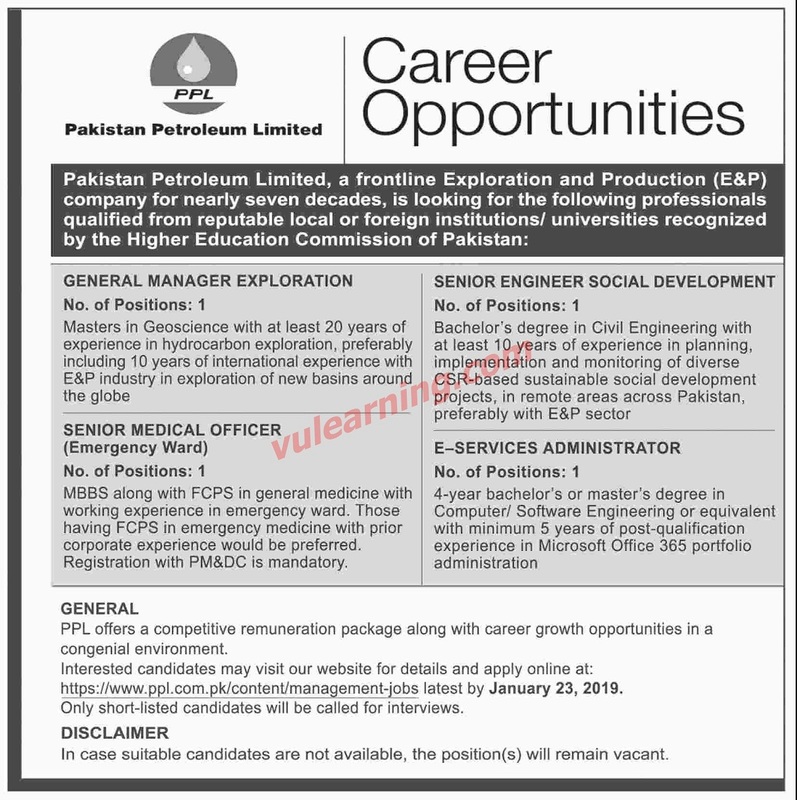 Pakistan Petroleum Limited (PPL) need services of engineering graduates of any discipline. 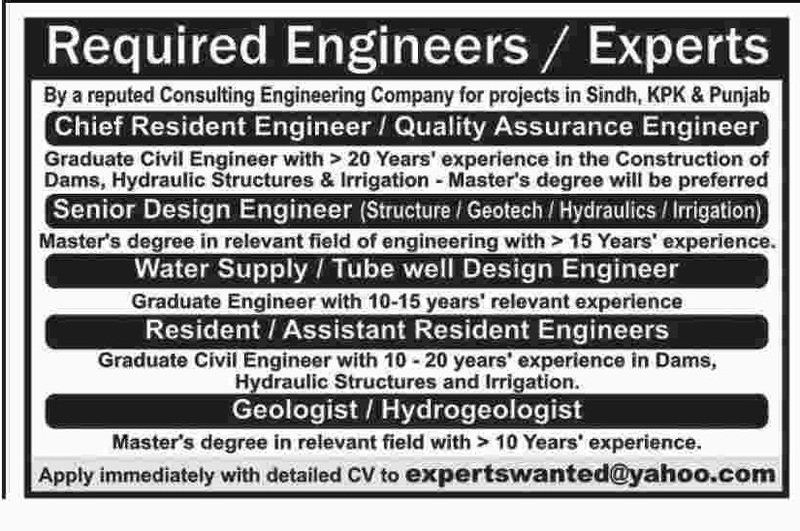 Ministry of Water Resources need services of civil engineers . 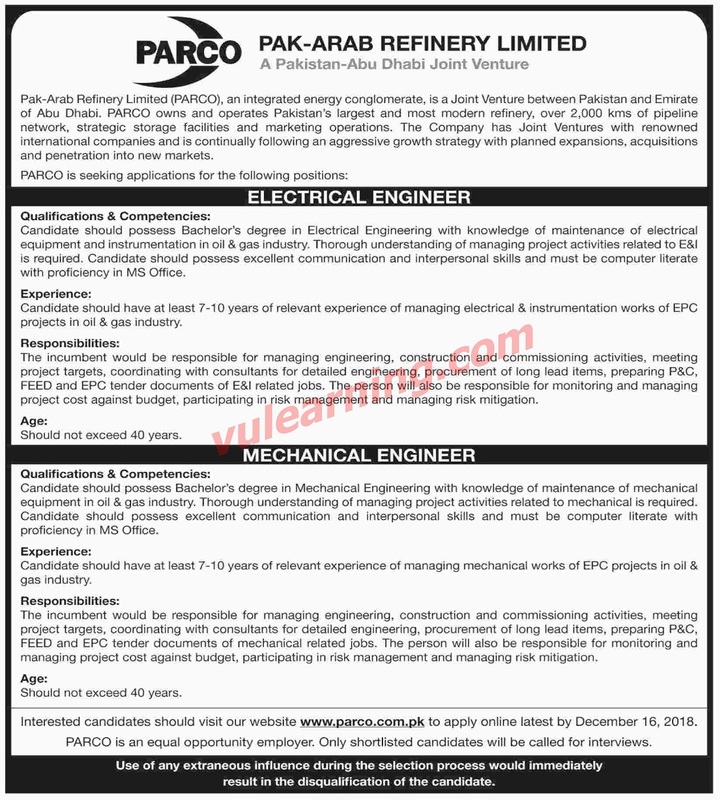 Parco Coastal Refinery Limited need services of mechanical engineers. 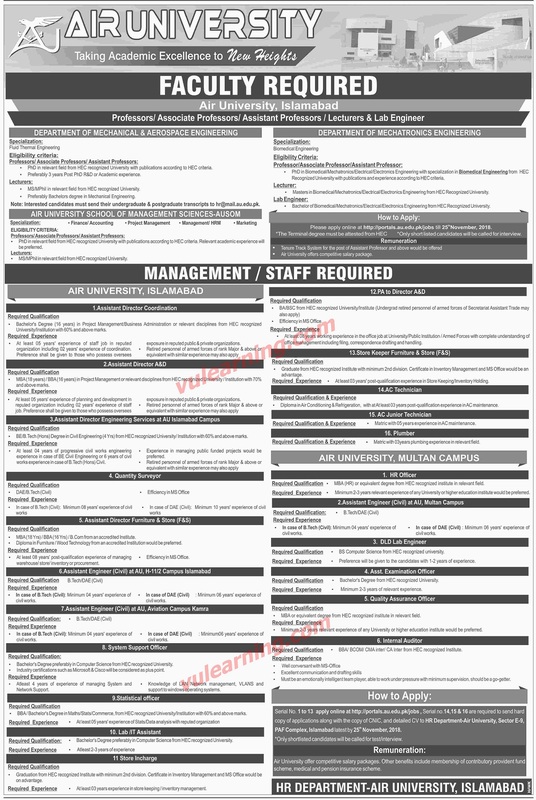 iaquat National Hospital & Medical College Karachi need services of Civil Engineer for post of Assistant Manager. 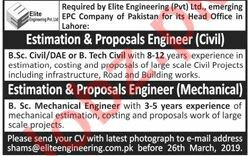 Engineering Consultancy Firm needs services of civil engineer. 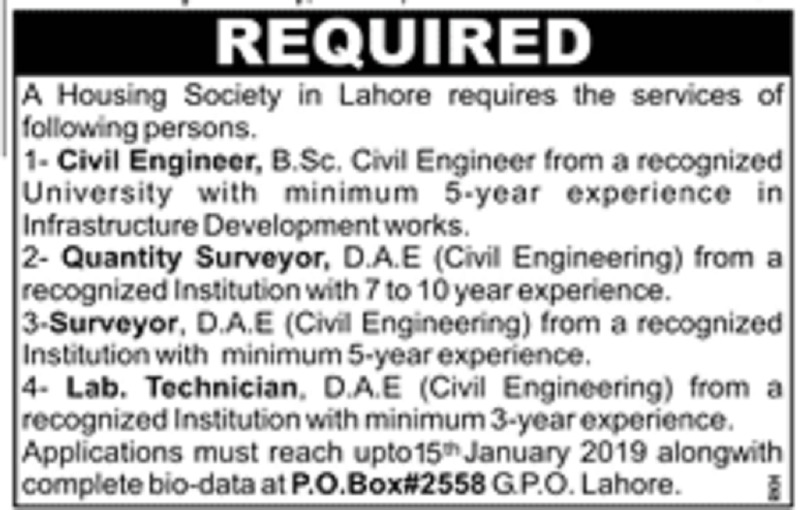 Lahore Housing Society need services of Civil Engineer.Further details may be seen in link. 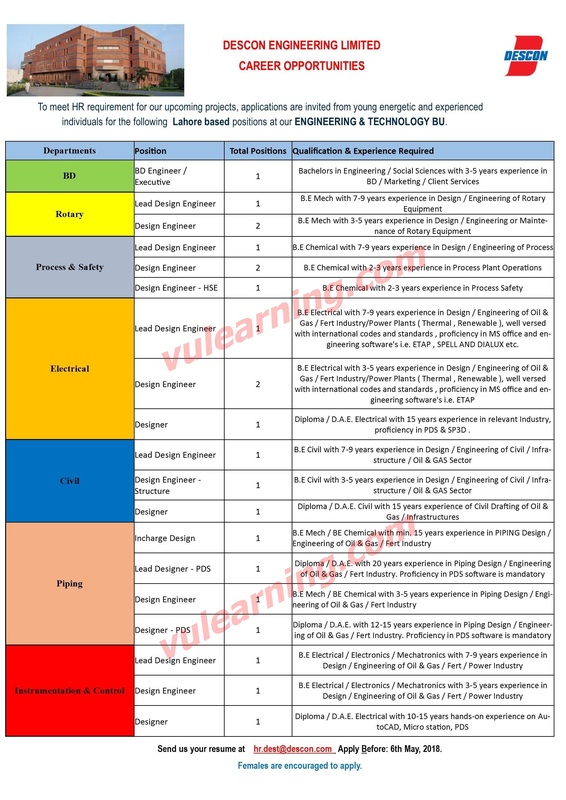 Ministry of Defence need services of Electrical Engineers for the post of Deputy Directors Engineering & Assistant Directors Engineering . 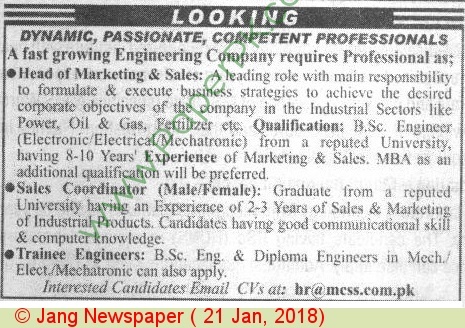 NESCOM need services of Mechanical/Electrical Engineers. 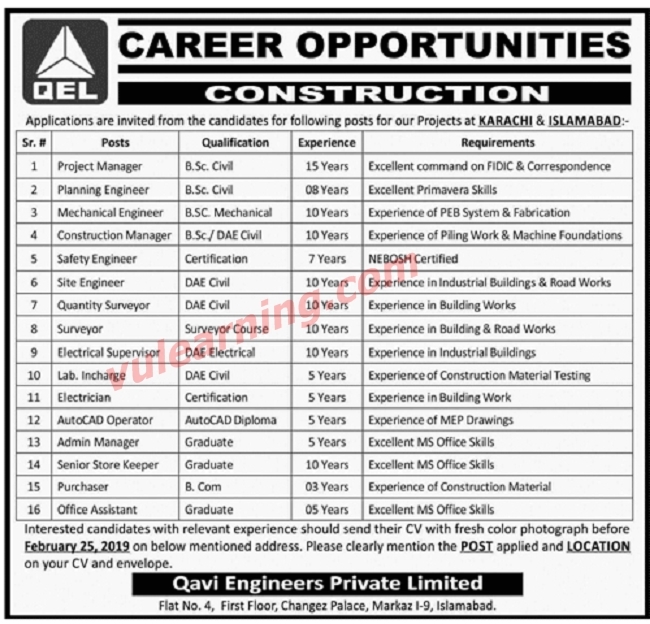 Famous Private Construction Company need services of Civil & Electrical Engineers. 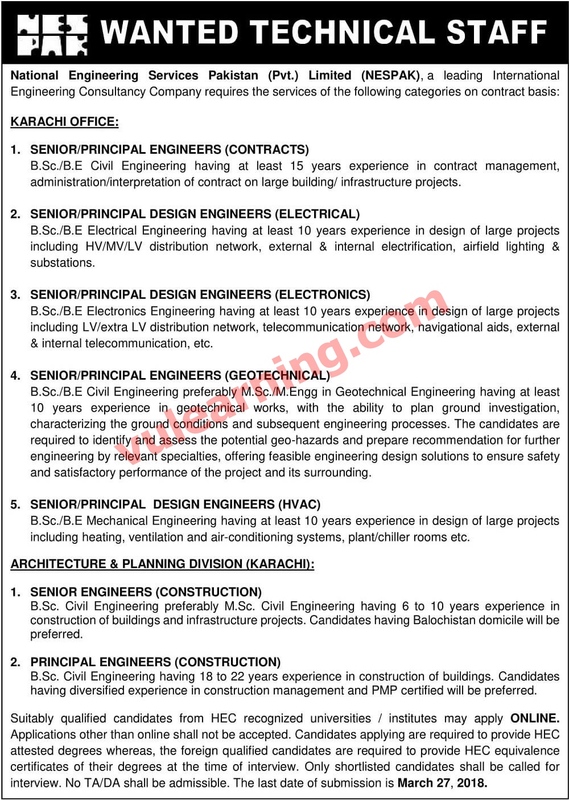 Public School Gadap Karachi need BSc civil engineer for post of Resident Engineer. 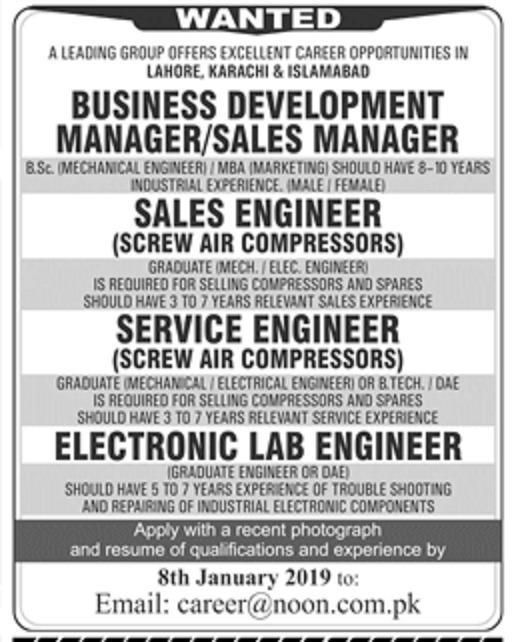 Lucky One Mall & Towers Karachi need services of BSc Mechanical Engineer.For more info visit the link given here. 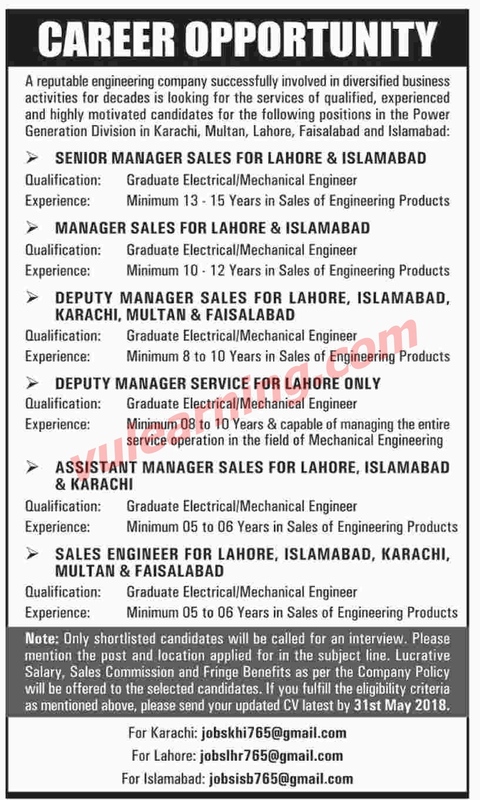 amal Hosiery Mills Faisalabad need services of Mechanical Engineers . 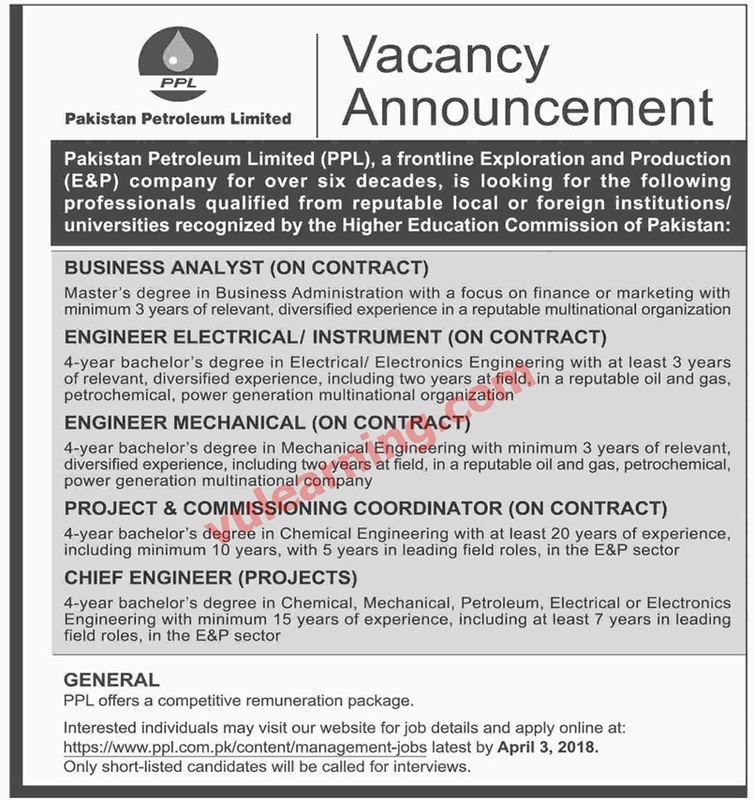 PPL Pakistan Petroleum Limited need services of Civil Engineer. 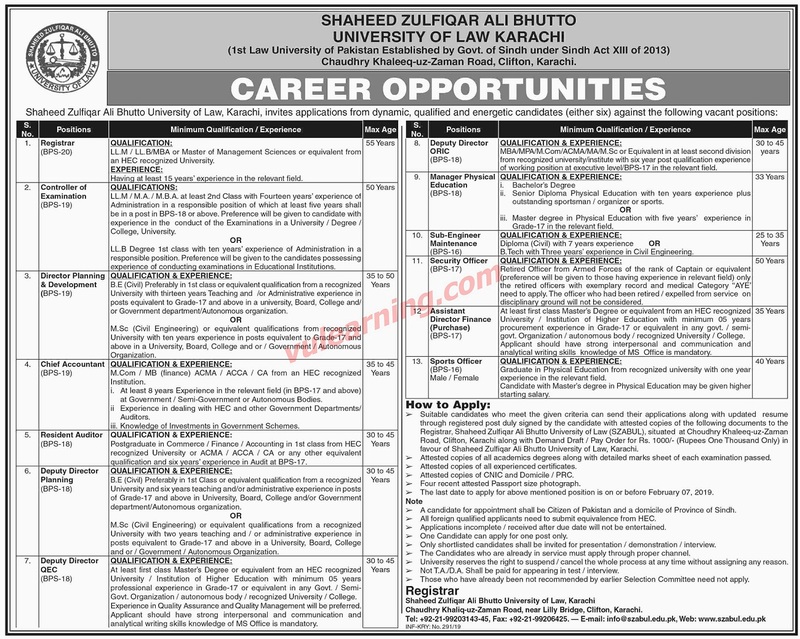 SZAB University of Law Karachi need services of Civil Engineers. 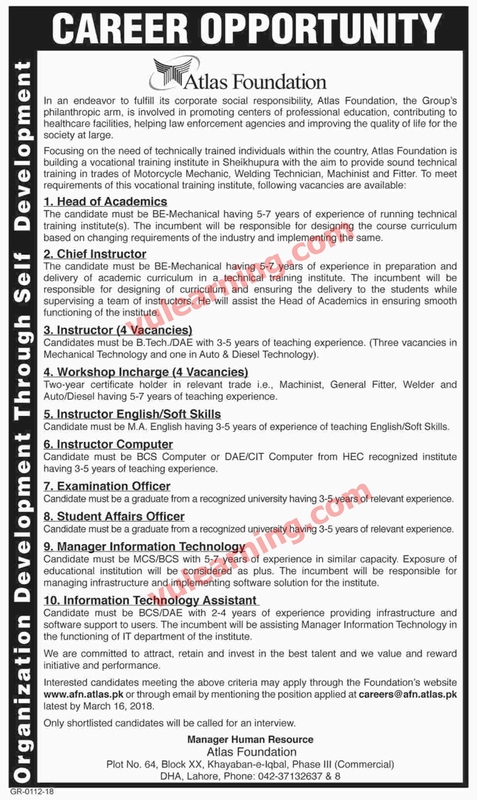 Medical Teaching Institution MTI Bannu need services of Electrical Engineer. 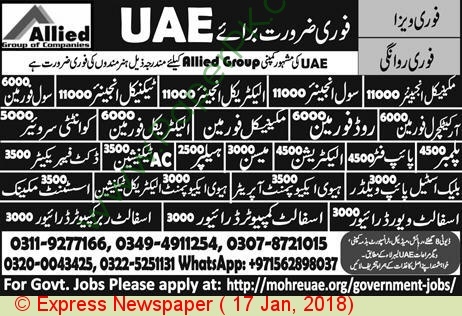 heikh Zayed Hospital Rahimyar Khan need services of Electrical Engineer. 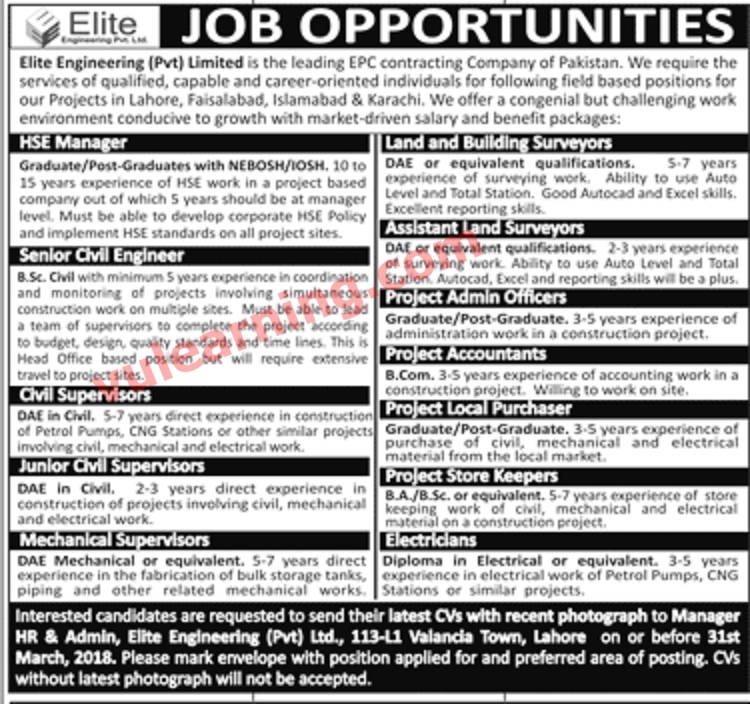 A Private Construction company need services of Electrical /Civil Engineers for its projects situated in punjab/gilgit/kpk. 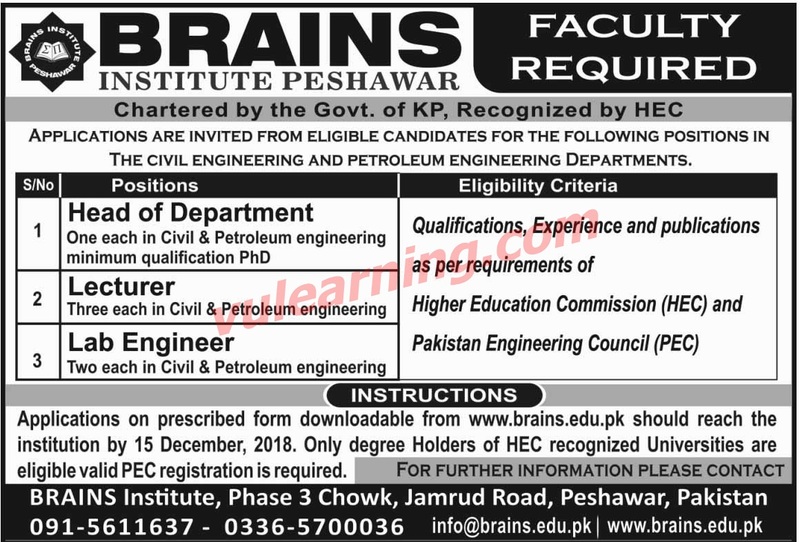 hwaja Fareed University UEIT need services of BSc Civil/Mechanical/Electrical Engineers for post of Lab Engineers. 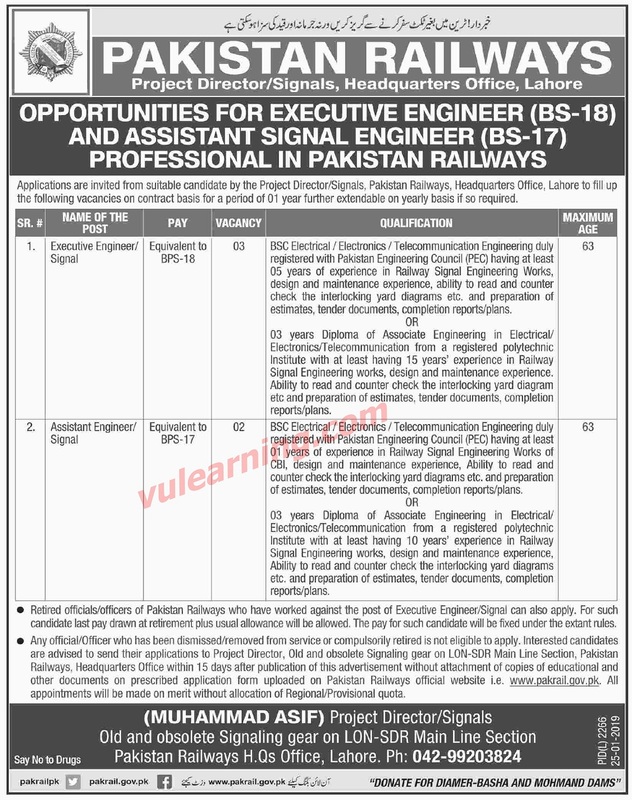 Pakistan Railways need services of Electrical Engineers. 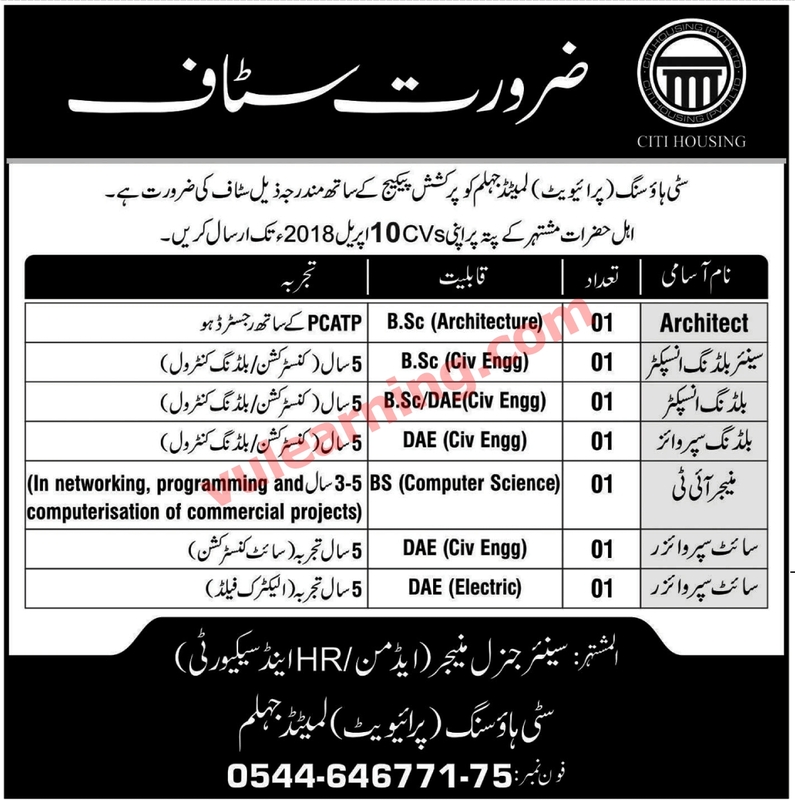 Sindh Madressatul Islam University need services of Civil Engineer. 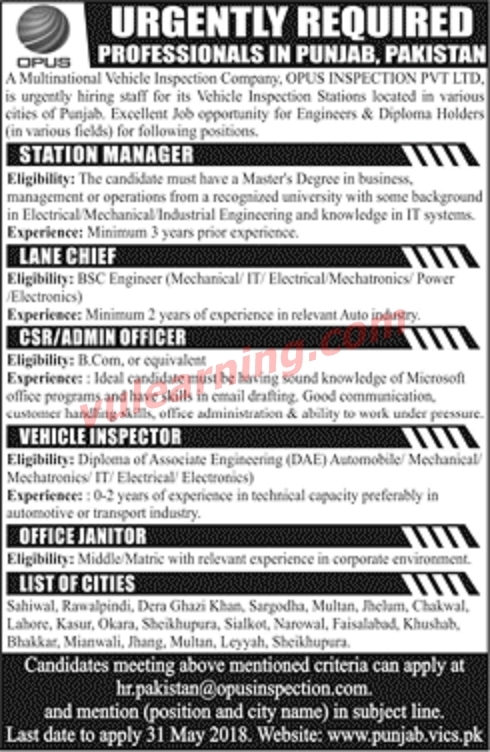 National Telecommunication Corporation (NTC) need services of BSc Electrical Engineers. 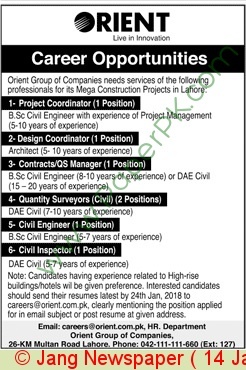 FWO , Frontier Works Organization need services of Civil Engineers .